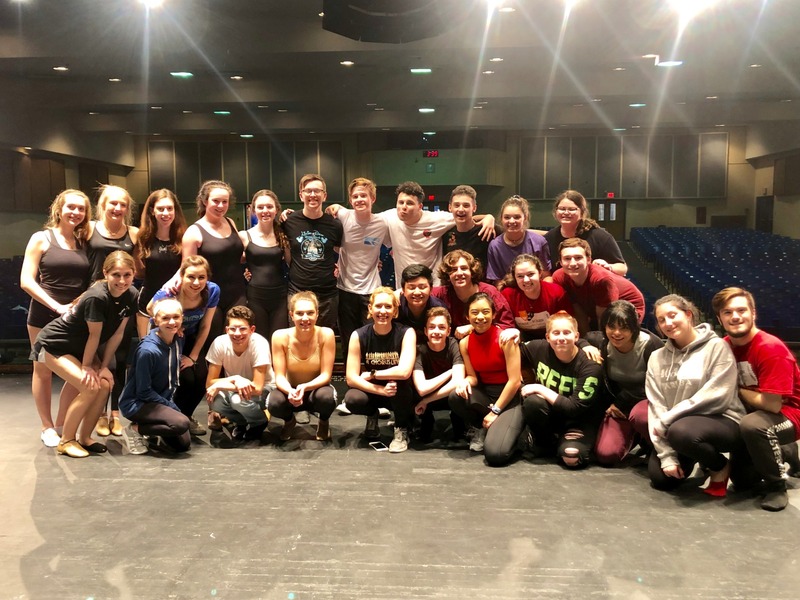 The Nautical Star Theatre Company and the TRN Theatre and Dance Academies participated in a Masters Class with Melissa Cabey. Melissa is TRN alumni and played the role of Val in the National Tour of A Chorus Line. She came and taught the students choreography from the show and then hosted a question and answer session. 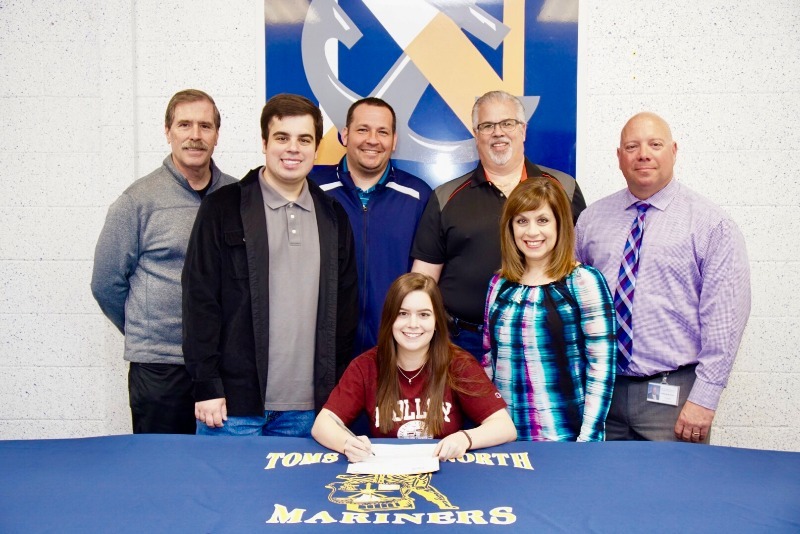 Congratulations to Toms River North 's Kirsten Ardis who signed a letter of intent to attend the University of Massachusetts Amherst in the fall. Kirsten led the swimming team to the Ocean County and A-South championships. She was the Ocean County Champion in the 50 meter free style and anchored the record setting 200 meter medley relay team. Kirsten will continue her swimming career with the Minutewomen and received an academic scholarship to major in Environmental Engineering. Good Luck Kirsten on your exciting new journey. 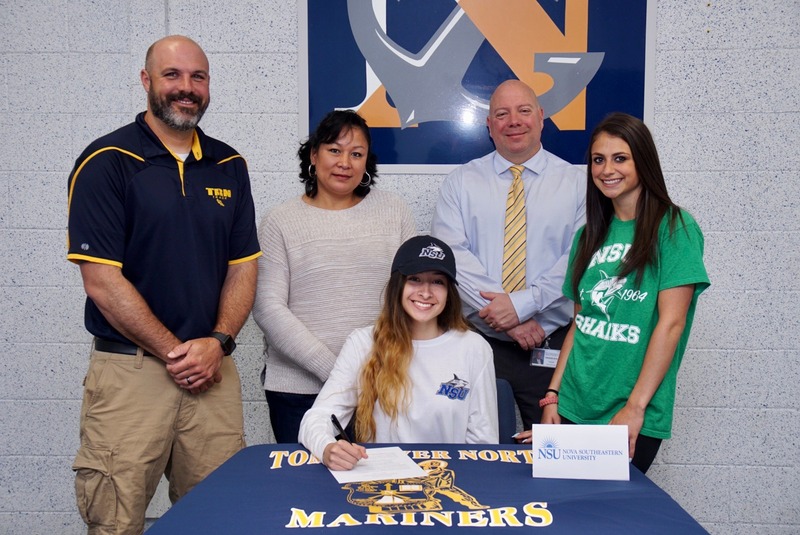 Congratulations to Michelle Greenstein who signed a letter of intent to attend Nova Southeastern University in the fall. Michelle received an academic scholarship and will run cross country and track for the Sharks. 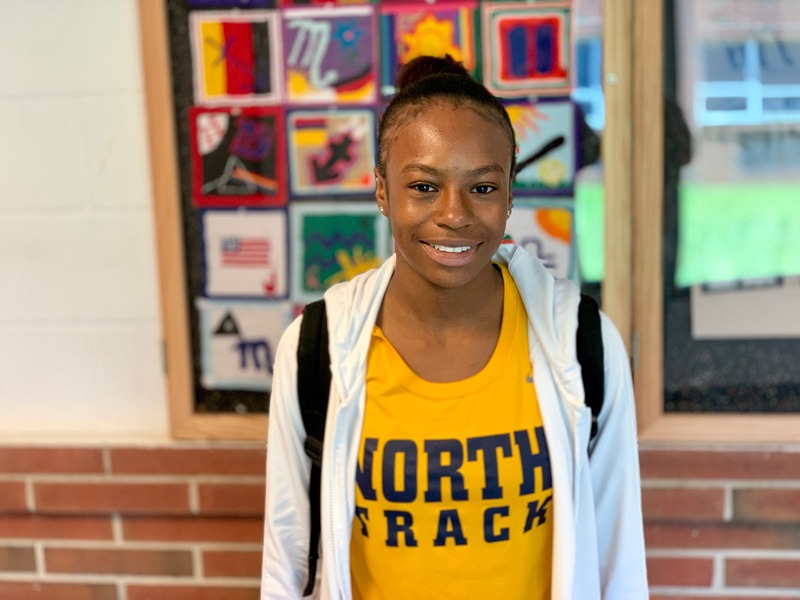 An outstanding 100 and 200 meter runner, Michelle is just a few tenths of a second from breaking the school 200 meter record. Good luck Michelle, we are all rooting for you. 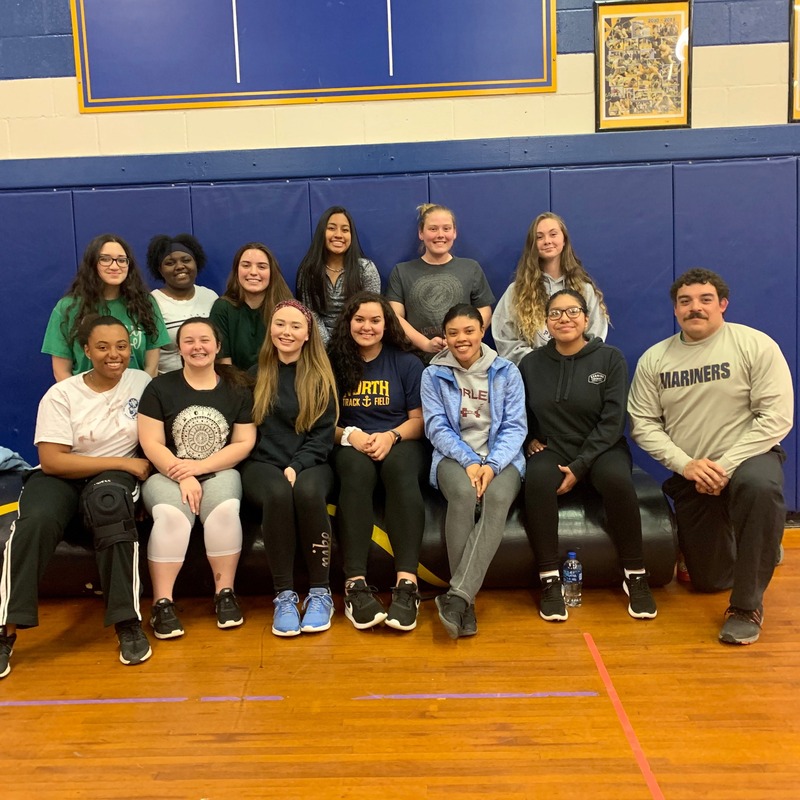 The Girls Track and Field and team has enjoyed much success this year with strong support from the Javelin, Shot Put and Discus throwers. Go Mariners! Their 3-0 start has been a total team effort! Go Mariners! 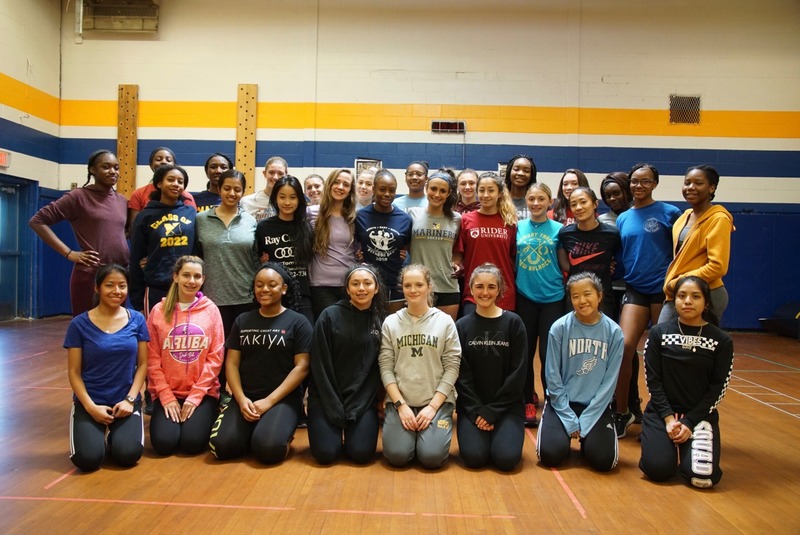 The TRN Girls Track and Field team is off to a spectacular start. After an impressive performance at the Rocket Relays and a big win this week improving their record to 3-0, the Lady Mariners will continue to impress this weekend at TCNJ. Go Mariners! 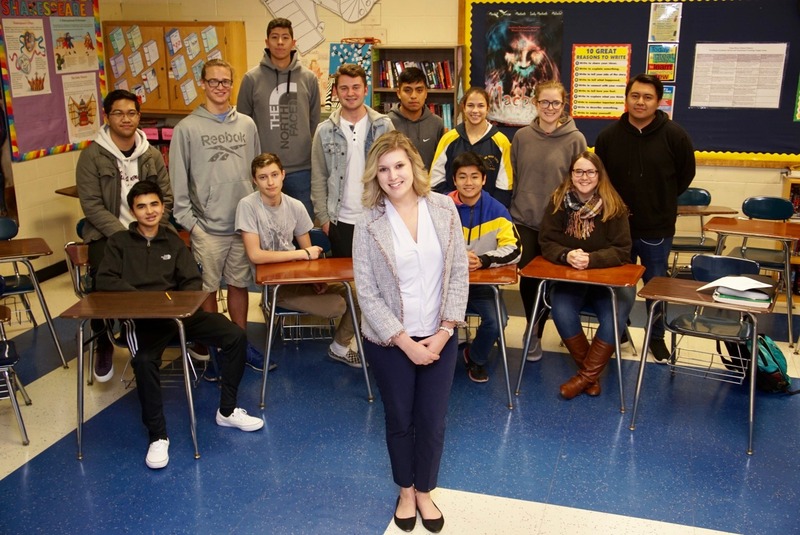 Congratulations to our Staff Member of the Month, Ms. Alyssa Ellerson! Ms. Ellerson has taught biology and physics over the last 5 years here at High School North. She is involved with our STEAM Club and enjoys working with our supportive, friendly staff and her hardworking students. Outside of school she enjoys shopping, going to the beach, and spending time outdoors with friends and family. Congratulations to Madison Bennert who signed a letter of intent to enroll in Wagner College in the fall. Madison is interested in being part of the medical field and has her sights set on becoming a Physician Assistant. She received an academic scholarship and will play soccer and compete at the NCAA Division 1 level. The Seniors picked their favorite teacher to emulate today on “Freaky Friday”. Congratulations to our April Students of the Month, Christopher Quinn and Madison Bennert! 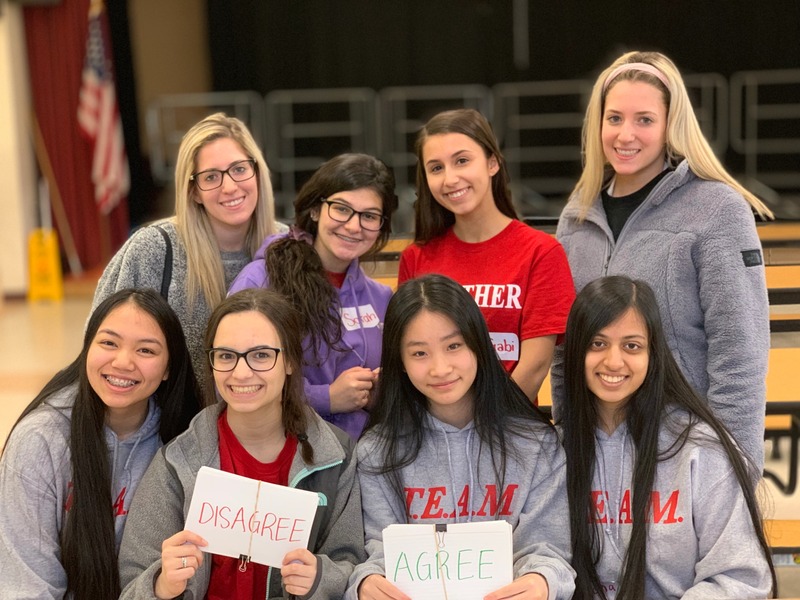 TRN hosted the Society for the Prevention of Teen Suicide for a full day workshop to address the mental health issues that contribute to this very serious issue. High schools from all over the county attended to develop coping strategies to ensure the care, safety and protection of all our students. 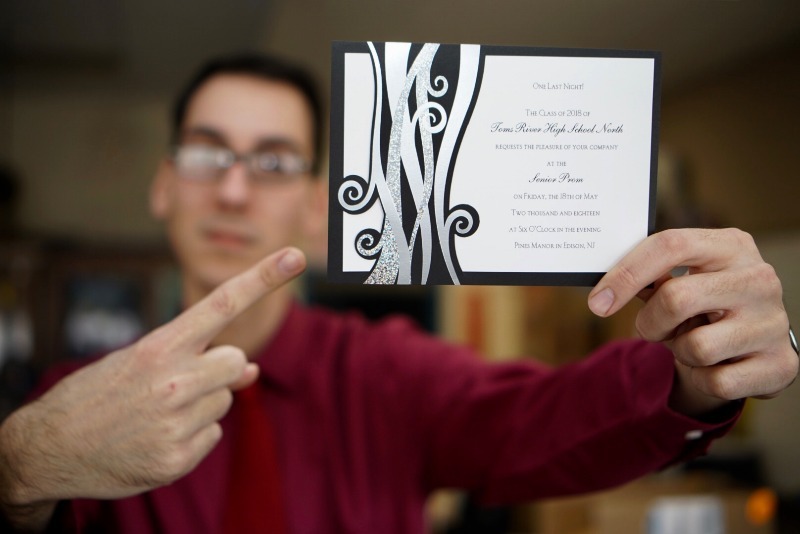 TRN captures Teen Art Festival Awards! 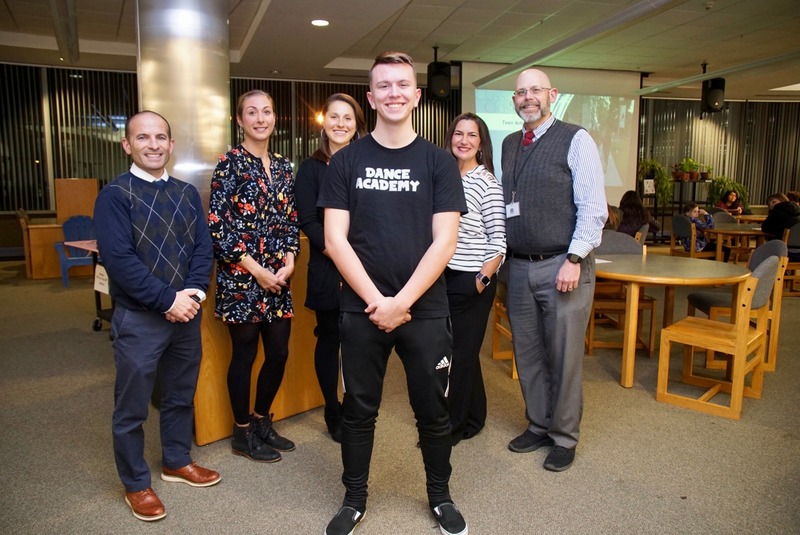 Toms River High School North visual art students received six awards of recognition at the recent 2019 Ocean County Teen Arts Festival! Towards keeping our commitment to provide a safe and healthy place for our students to learn, there will be an information session for students and parents on the dangers of vaping on Monday, April 15th from 6:00 pm to 7:00 pm at the High School East Student Center. This week TEAM (Together Everyone Achieves More) will visit the 5th grade classes to help ease the transition for the students when they attend the Intermediate schools in the fall. May your troubles be less. And your blessings be more. And nothing but happiness come through your door. A good friend is like a four-leaf clover, hard to find and lucky to have. 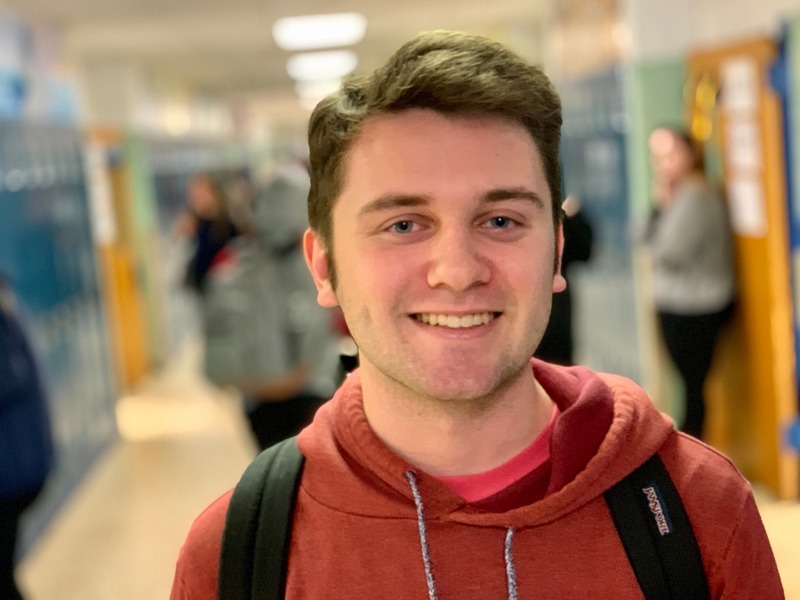 Congratulations to senior Zach Dougherty for being recognized by the NJ League of Women Voters by awarding him with the prestigious "Making Democracy Work" award. ...It's a ...well, it's a bird! Mrs. Welsh's PAWS club brought in a special guest speaker, Mr. Ben Wurst from the Conserve Wildlife Foundation of NJ. 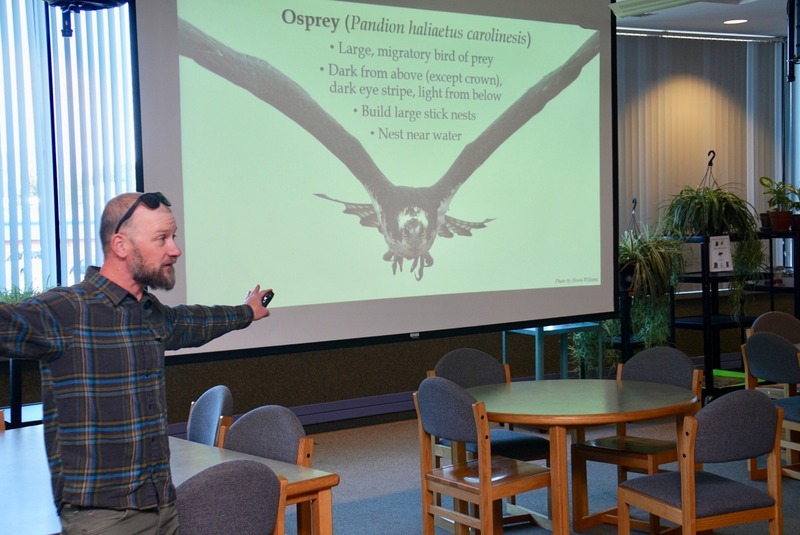 Mr. Wurst gave an inspirational talk about the New Jersey Ospry, a magnificent creature that relies on human support to help maintain shrinking habitats. 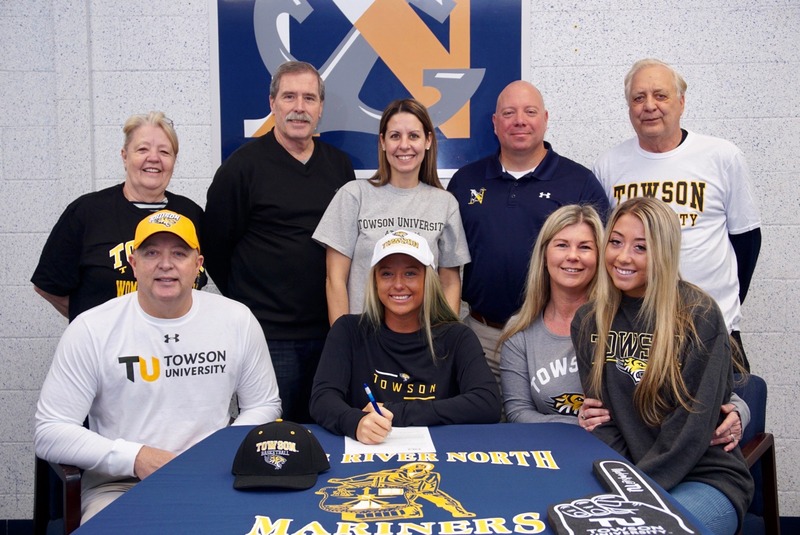 Congratulations to Brielle Biscogno for signing a letter of intent to attend in Towson University in the fall. After having a outstanding basketball season where she surpassed the coveted 1,000 career points milestone, Brielle will receive a scholarship to play basketball for the Towson Tigers. Brielle plans on majoring in Physical Education. Good Luck Brielle and thank you for all the great basketball memories. 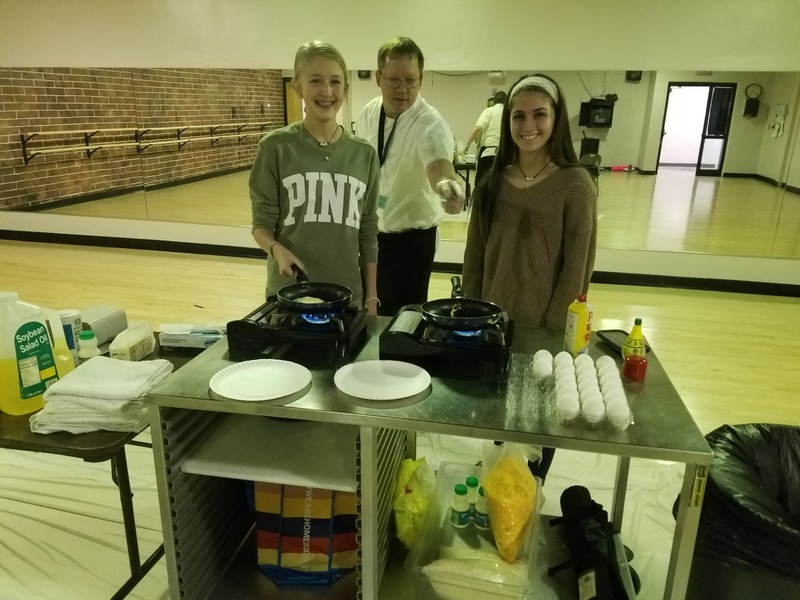 Toms River schools nutritionist Pete Bratton conducted a healthy breakfast cooking demonstration, "Sophomore Nutrition for Dancers" for the members of the TRN Dance Academy. Mr. Bratton told the class about the importance of eating healthy before a performance and about the beneficial foods that are high in protein to give them the energy to perform at an optimal level. 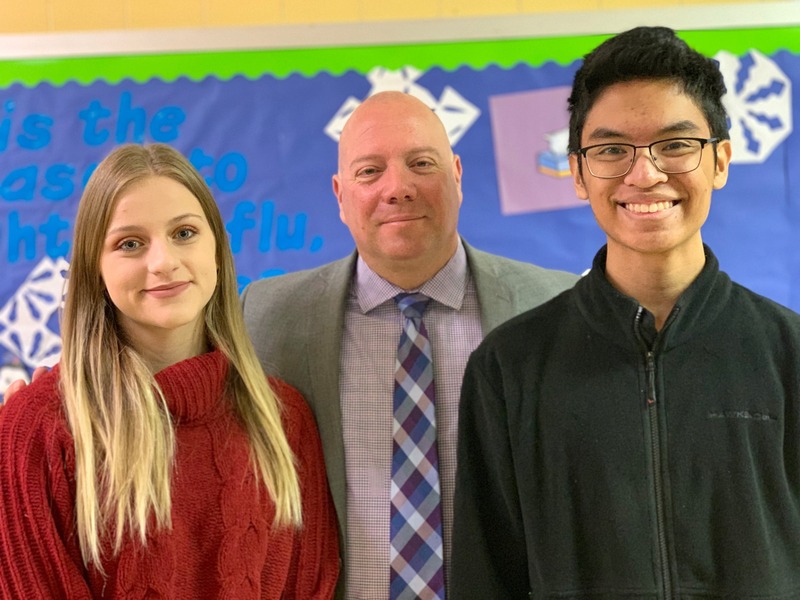 Congratulations to our March Students of the Month, Jenna Paul and Sam Angelo! 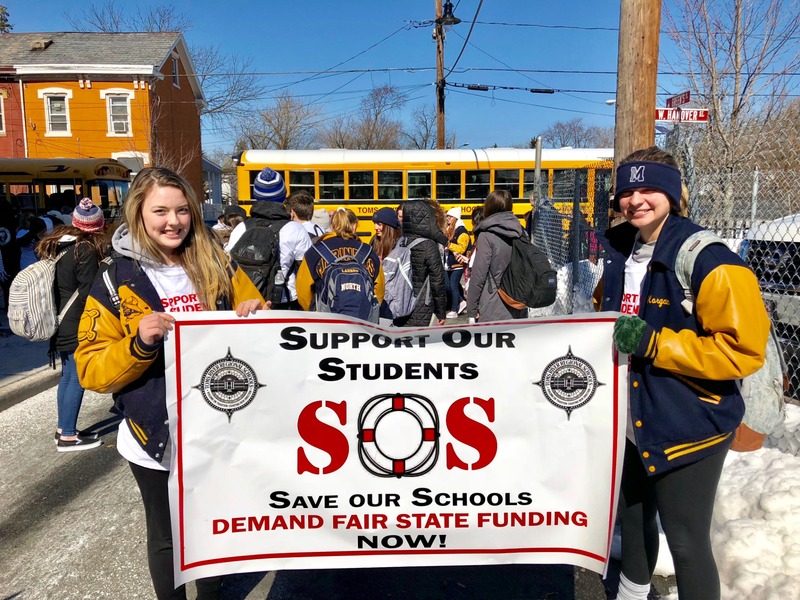 Students and teachers from the Toms River Regional School District marched on Trenton yesterday as Governor Murphy made his budget proposal, a budget that is not fair to the Toms River Community. There was a impressive turnout that will hopefully make an impression on the State politicians to restore adequate funding for our school district. Congratulations to our Staff Member of the Month, Ms. Julia Politano! 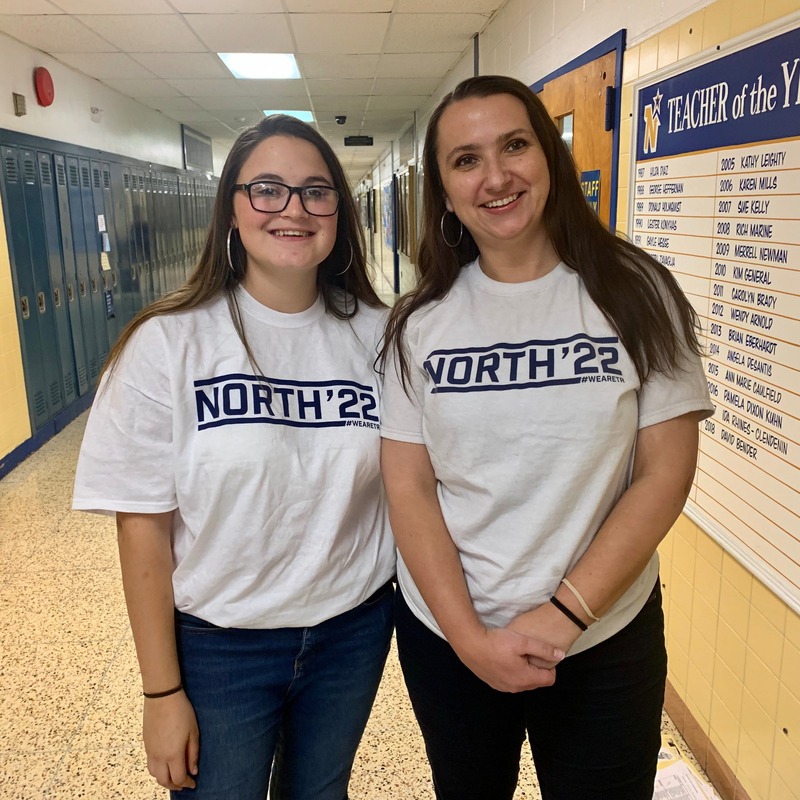 Ms. Politano has taught at Geometry and Math 10 at High School North for the last two years. She currently acts as the advisor to N’STEP and coaches Softball. Ms. Politano loves working with her students because they are wonderful and our staff because they are helpful and friendly. 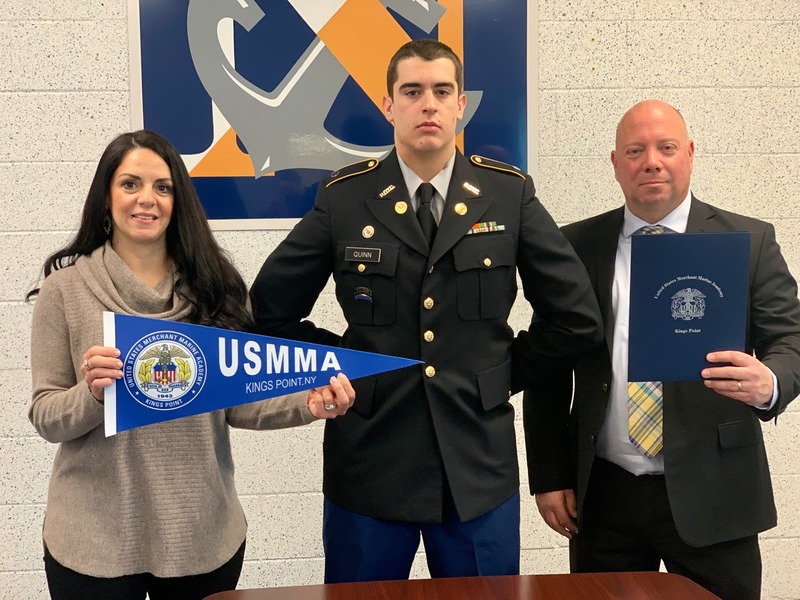 High School North Senior, Christopher Quinn received and accepted a Letter of Appointment from the US Merchant Marine Academy (USMMA). 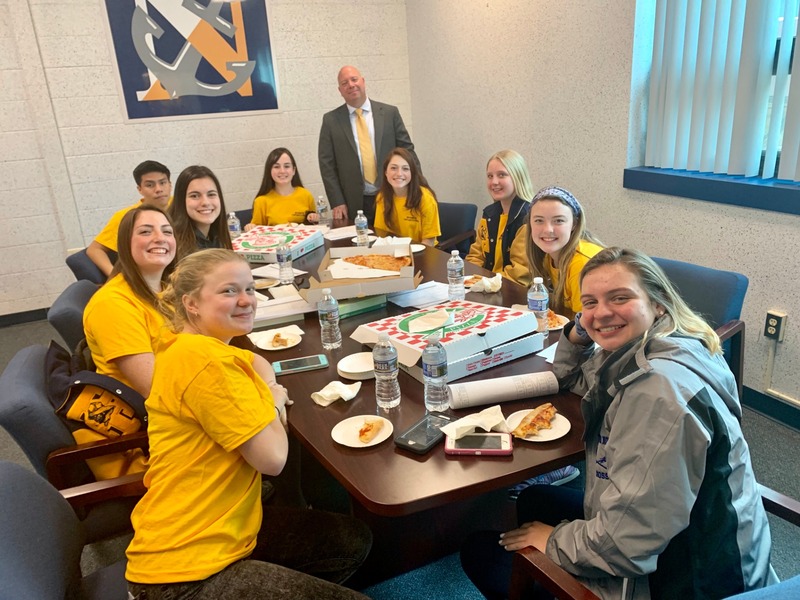 Toms RIver North Students Against Destructive Decisions (SADD) supported the Ocean County Health Departments "The 3 D's. Drinking, Drugging and Driving" program held at the Ocean County Mall. 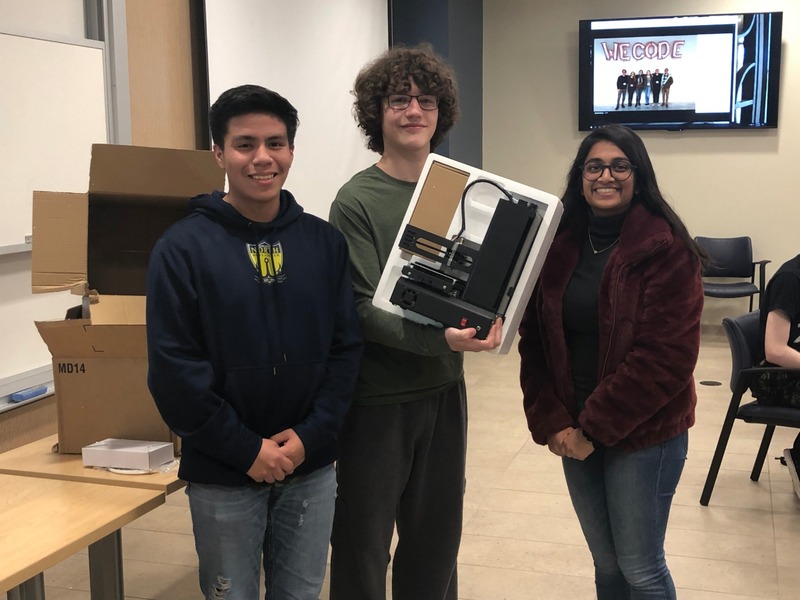 Congratulations to Peter Reilly, Hernan Navarro, and Khushi Patel for taking 1st place at the Monmouth University Computer Programming Competition on Friday in which 25 teams competed. They did an amazing job of solving 12 out of the 13 given problems. Well Done! Congratulations to the Mariner Wrestling team on an outstanding season! North wrestling finished 20-4 on the year, and for the first time in school history, won the A-South Title. Among the many season highlights was Louie Gagliardo winning the first Regional Championship in 10 years! 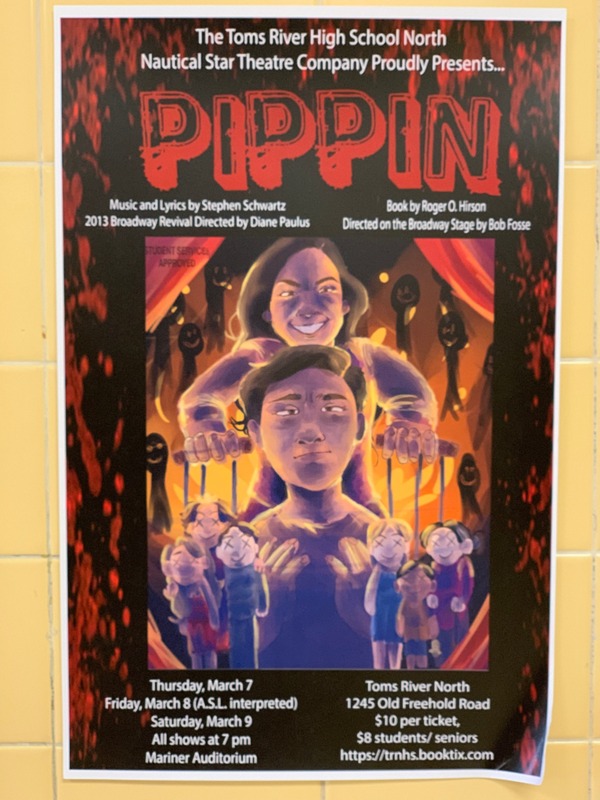 The Toms River North Nautical Star Theatre Company proudly presents Pippin. Mr. Kane addressed the Junior class to make an impassioned plea for continued support of the "Field of Dreams" project. 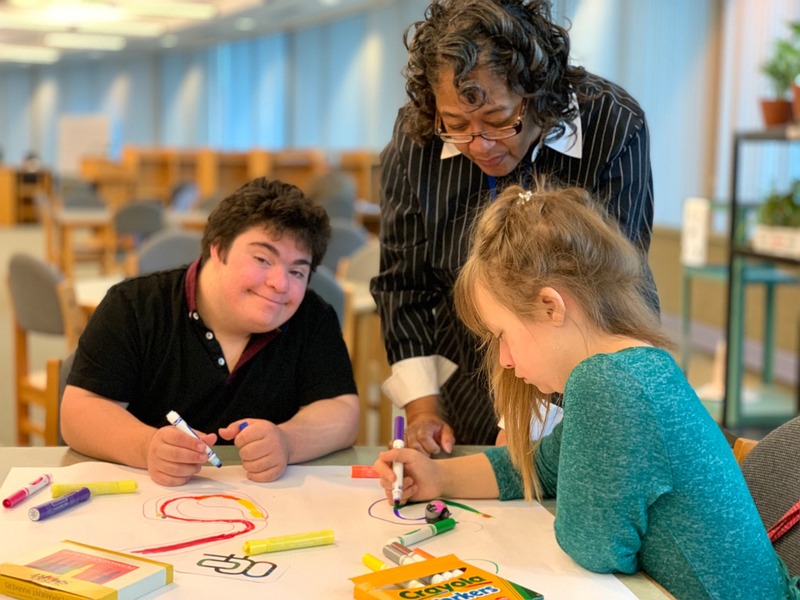 Mr. Kane's vision is that children with special needs with have a state of the art playground area where the parents and children can come and play without feeling stigmatized. Visit the web site for more information and how to become involved. 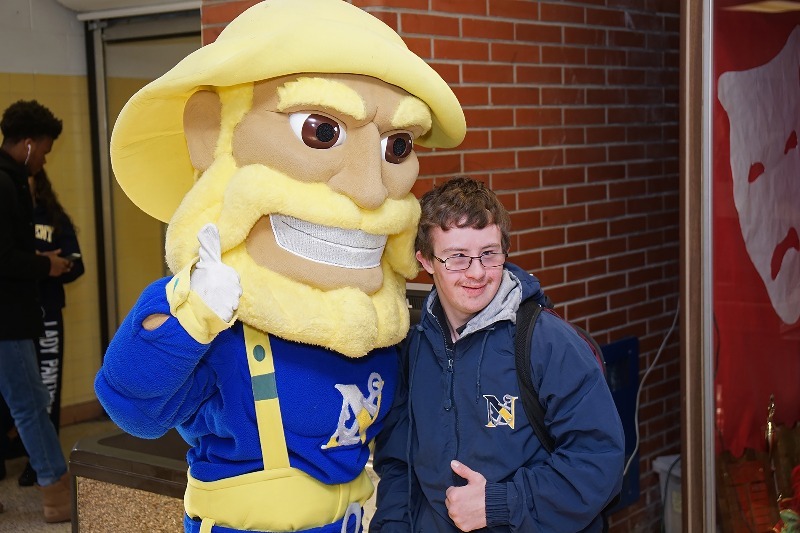 Brandon Gowan teamed up with our school mascot "Salty" to bring the energy of school spirit to last Friday's pep rally. The Sophomore class came out on top in first place in the "Battle of the Classes" competition. 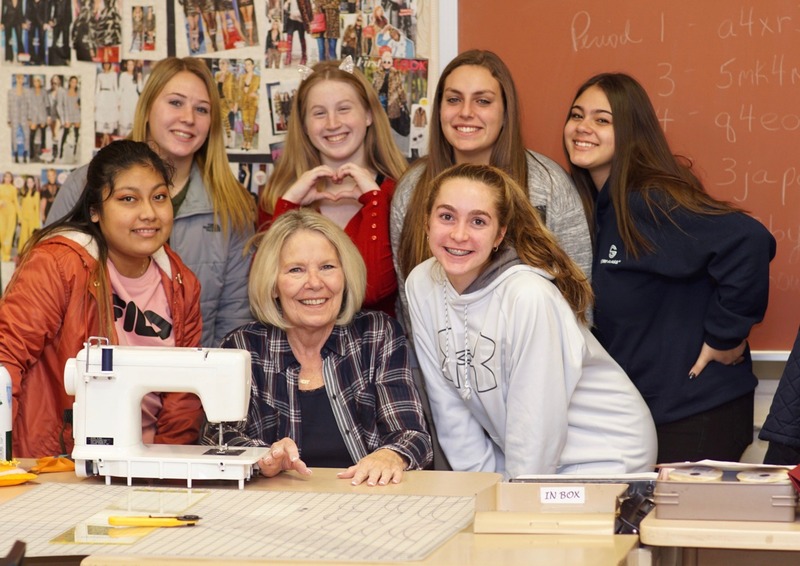 Ms. Houlihan has been selected as an Outstanding Arts Educator in the South Jersey Art Region as part of the Scholastic Art Awards. Congratulations to our boys swim team on their 2nd place finish at the Shore Conference Championship this past weekend. The 200 freestyle relay consisting of Mike Schober, Brian Sprinkle, CJ Sprinkle, and Matt DeGennaro set a new meet record with a time of 1:28.12. Mike Schober also set a school record in the 100 breast stroke with a time of 1:00.30. Congratulations and good luck in the 1st round of the states! 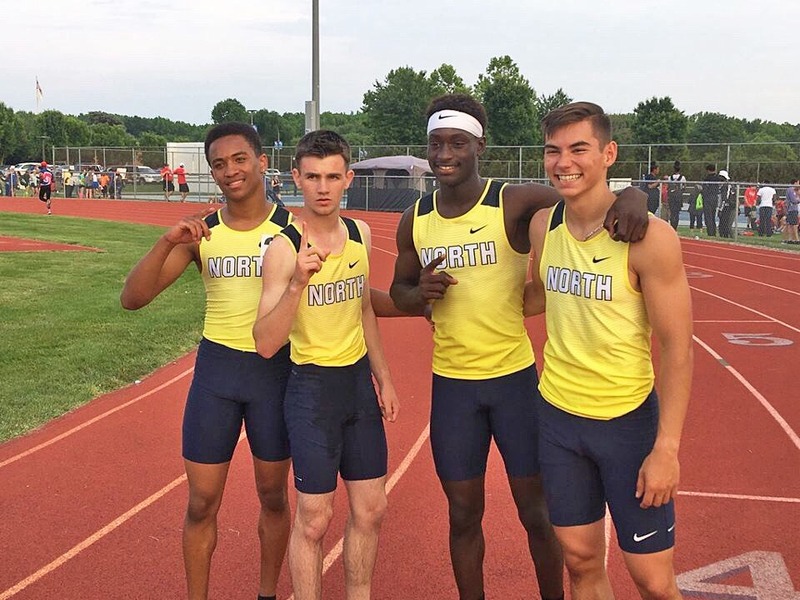 Congratulations to our boy’s track team for their performance at the Shore Conference Championships. Javid Ridgeway used a strong last lap to win the mile. 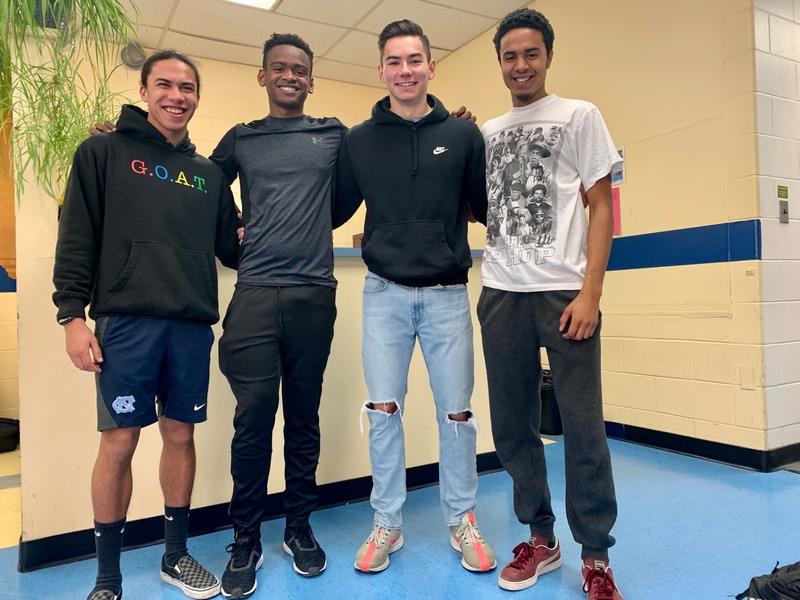 The 4 X 800 team of Javid Ridgeway, Elliot Lynn, Connor Sauers, and Jalen Ridgeway ran 8:04 and qualified for the Eastern States Championship and the Millrose Games. 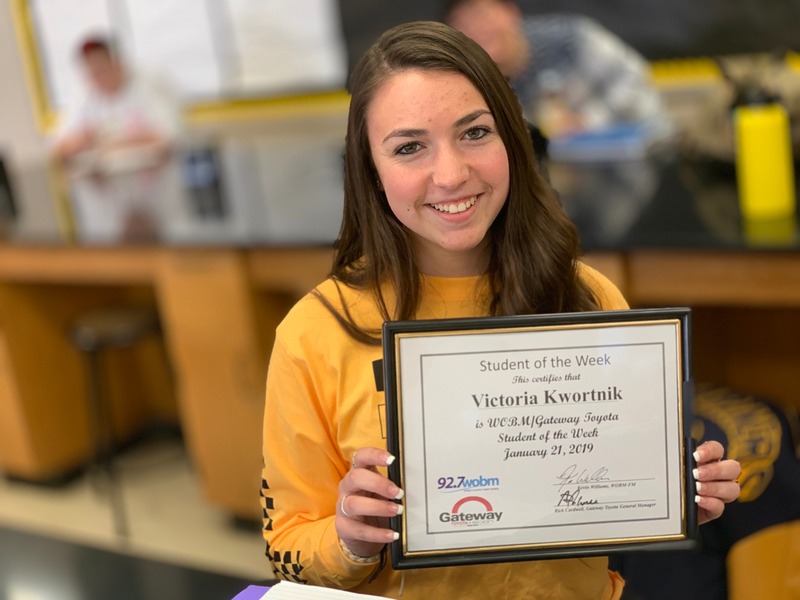 Congratulations to VIctoria Kwortnik for being selected as the WOBM/Gateway Toyota "Student of the Week".This award is given to well-rounded students who are fine representatives of their school. 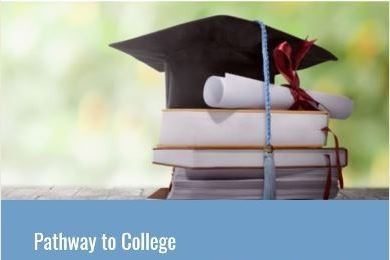 In June, there will be a $1000.00 college scholarship during a random drawing among the other nominees. When looking for the very best in Ocean County schools, look no further than Victoria! Good luck, we are all rooting for you! 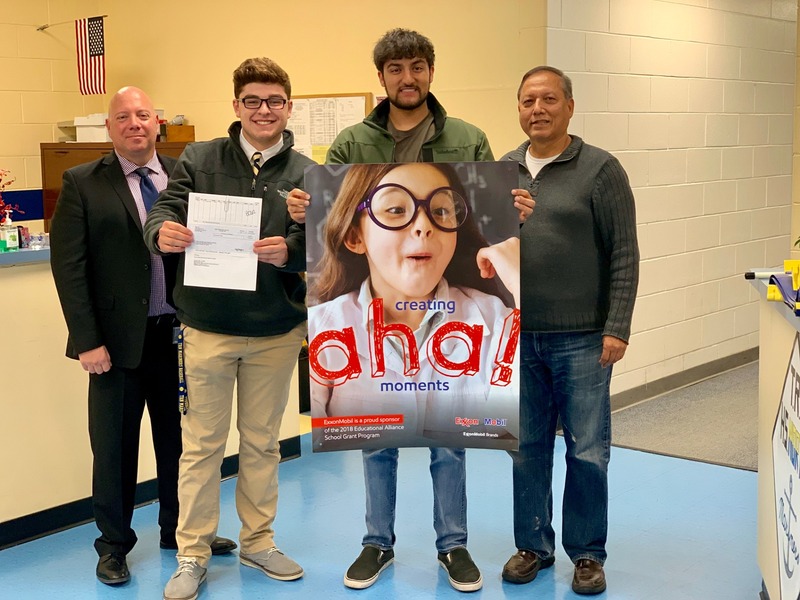 Mr. Rajiv Sharma, owner of the Toms River Exxon station at 13 route 37 East, presented a $500.00 check to promote the development of science at Toms River North High School. 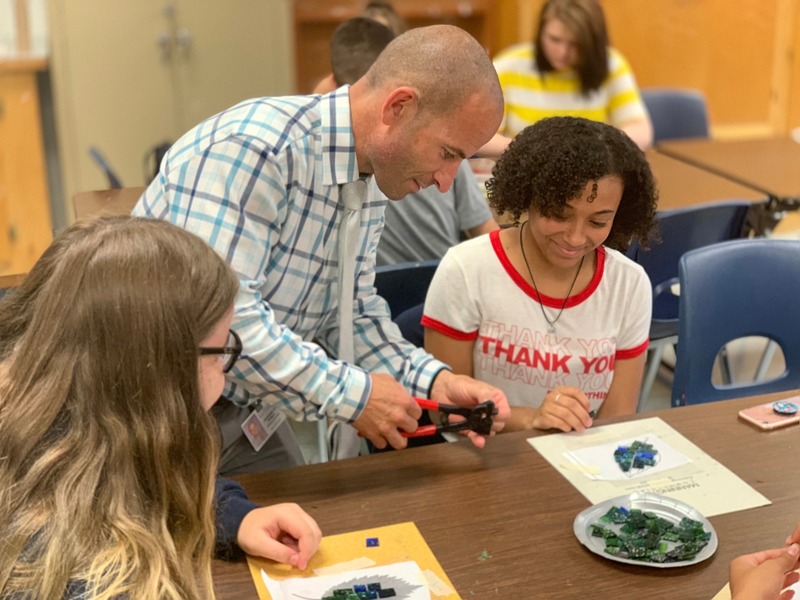 "Creating AHA moments" is part of the 2019 Educational School Grant Program for which Exxon is a proud sponsor. Holding the poster is senior Rohan Sharma who was recently accepted to Maryland University. Much thanks and congratulations to the Sharma family for their generosity and support! Congratulations to NIck Reilly for notching his 100th career wrestling win! 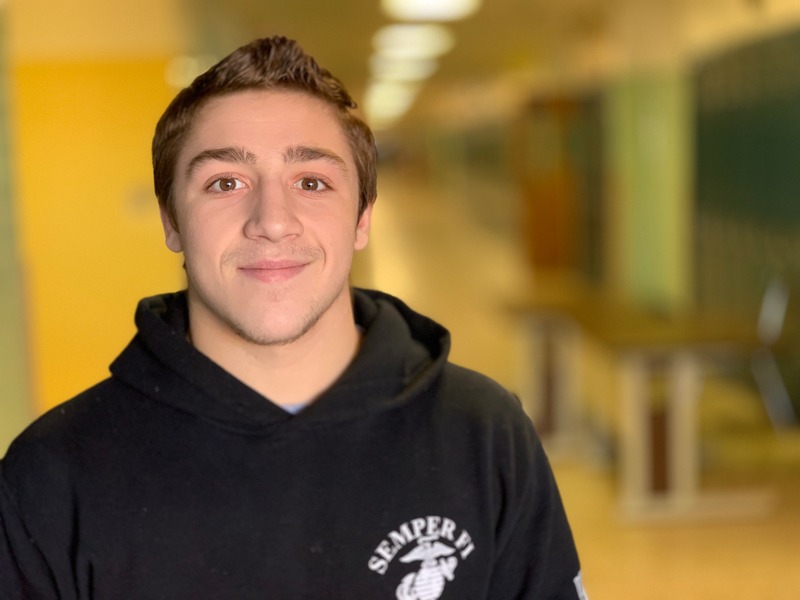 Nick and and his teammates, who are having an extraordinary season so far, are up against a tough Howell team tonight as they pursue the South Jersey Sectional State title. Go Mariners! Congratulations to Paige Peters on winning the Shore Conference Individual Bowling Tournament and to Kamerin Peters for placing second! Great Job Girls! On Saturday the team won their 3rd consecutive state sectional title! The girls won by over 300 pins and look to win the group and Tournament of Champions next week! Good luck girls!! 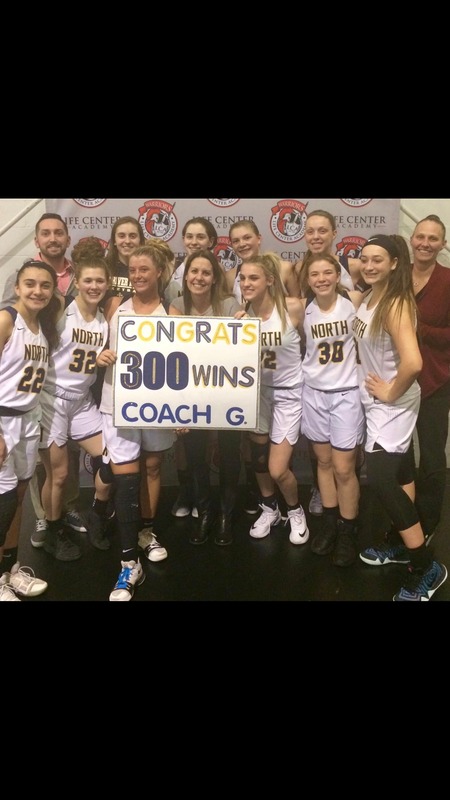 Congratulations to coach Vicki Gillan for for her 300th career win! The Lady Mariners basketball team takes on Central Regional 6:30 pm tonight at the RWJ Barnabas Health Arena. Congratulations to our February Students of the Month, Madison Turunen and Chad Payba! 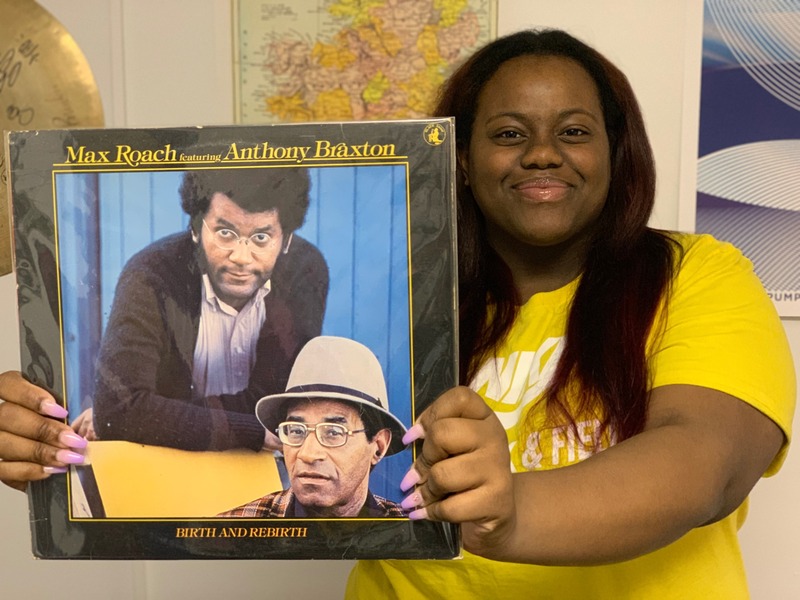 TRN began the month of February by celebrating Black History Month as a way for remembering important people and events in the history of the African diaspora. 1600 meters Shore Conference Winner! Congratulations to Javid Ridgeway for winning the Shore Conference title in the 1600 meters last Friday. 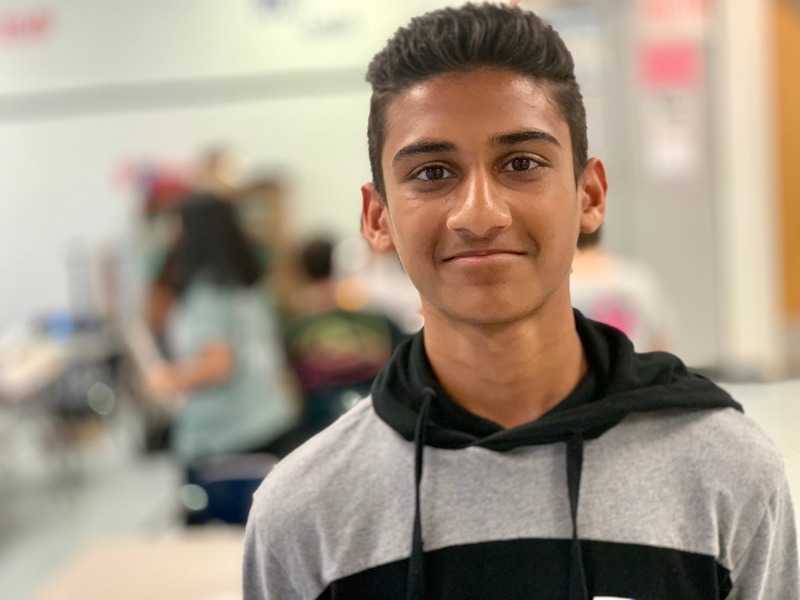 Javid has been on a tear since cross country season and looks to continue his success this weekend at the South Jersey Group 4 sectionals. Congratulations to sophomore Cole Schneider on being the fastest player in Toms River North Ice Hockey history to score 100 career points! 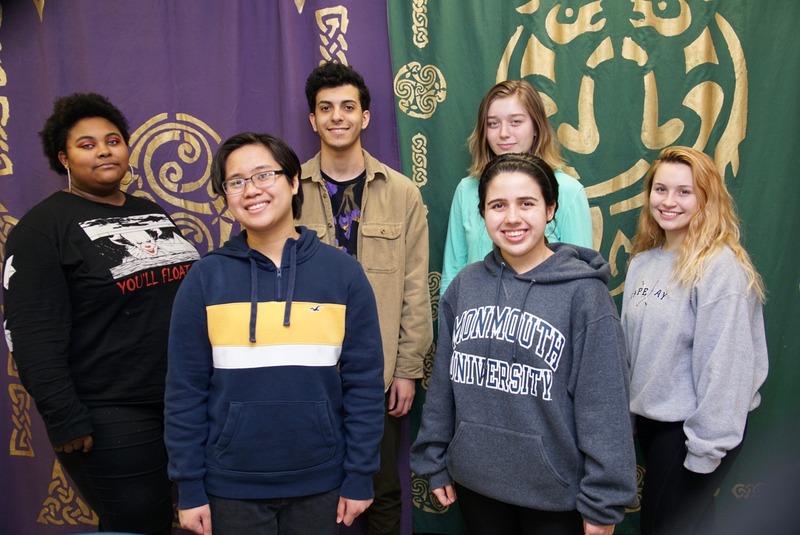 High School North 2019 Scholastic Art and Writing Award Winners! 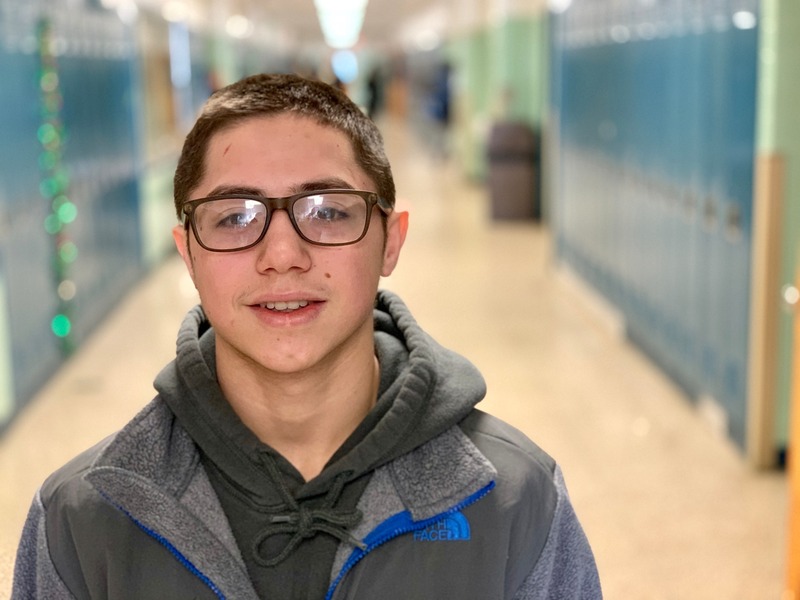 Michael Garcia has been awarded a prestigious Gold Key 2019 Scholastic Art and Writing Award for his acrylic painting Wilted. It will be featured in an exhibit of regional gold key artworks in Millville. His artwork is also currently being considered for a national award in N.Y.C. 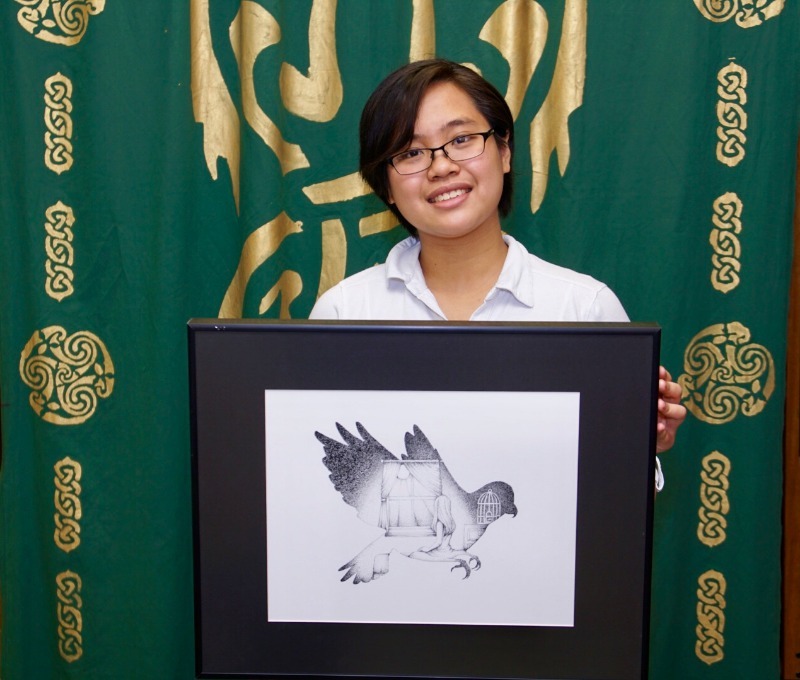 Caitlin Bonifacio has received an Honorable Mention in recognition for her pen and ink drawings Avis and Mannanggal. Both students are enrolled in Ms. Houlihan’s A.P. Studio Art class and completed the work as part of their portfolios. Their achievement is remarkable! Their artwork was recognized by a panel of creative professionals as outstanding among their peers. Both students will be presented with certificates and pins at a Regional Awards Ceremony in March. Congratulations to them both!! Congratulations to Kamerin Peters for being selected to join the "TEAM USA" bowling team. Known as the "Olympics of Bowling", Kamerin will travel the world competing against the top International bowlers. Over the weekend, the Mariner bowling team won the 38th Annual Central Jersey Winter Classic! Go Mariners! 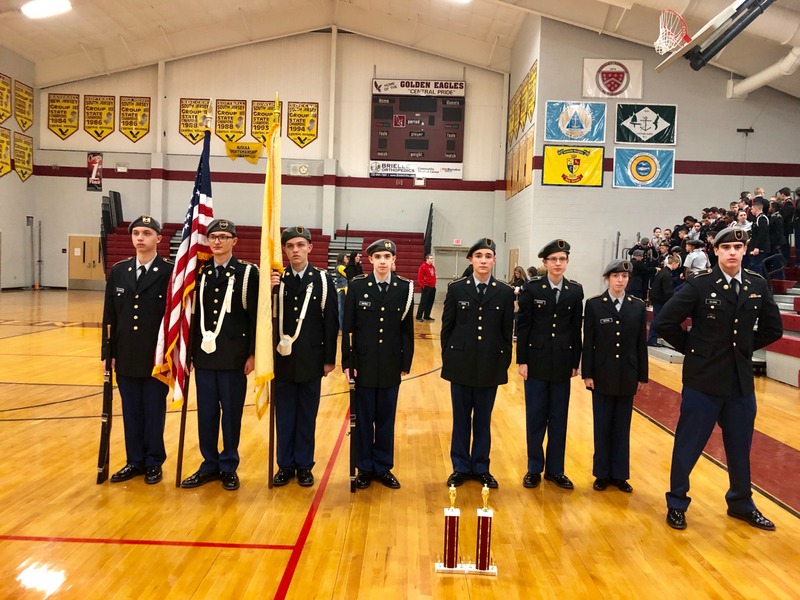 Toms River North Military Club participated in Drill Competition against 20 other drill teams from N.J. and PA. They placed 3rd in two categories: Inspection and Color Guard. 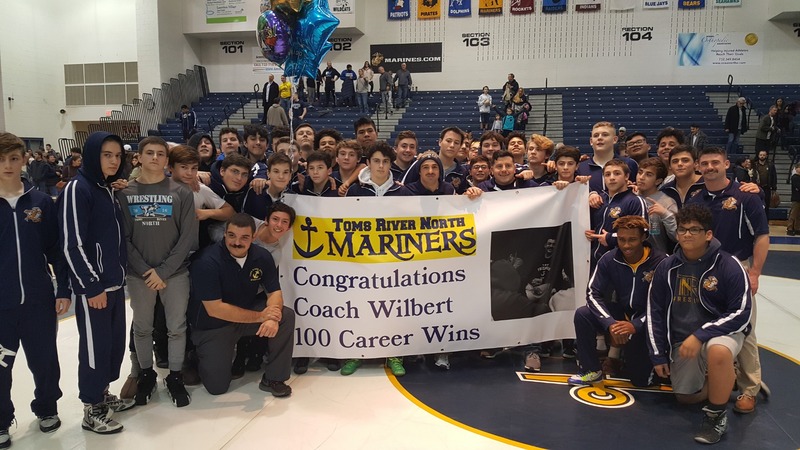 Congratulations to Mariner Wrestling coach Mr. William Wilbert for reaching his 100th career win milestone in last night's victory over Jackson Memorial. The members of "N Step" and the entire Mariner staff and student body wish everyone a Merry Christmas and a Happy New Year. 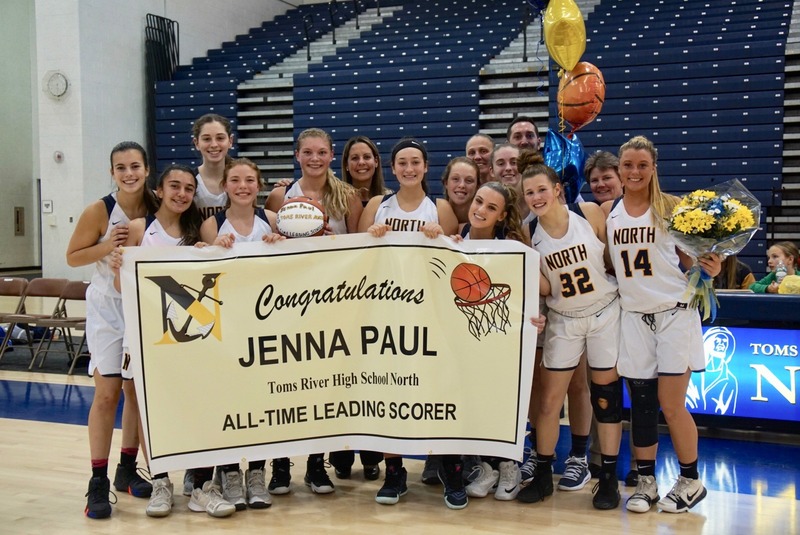 Congratulations to HSN senior, Jenna Paul for capturing the "All Time Leading Scorer" title during last night's hotly contested game against High School South at the RWJ Barnabas arena. 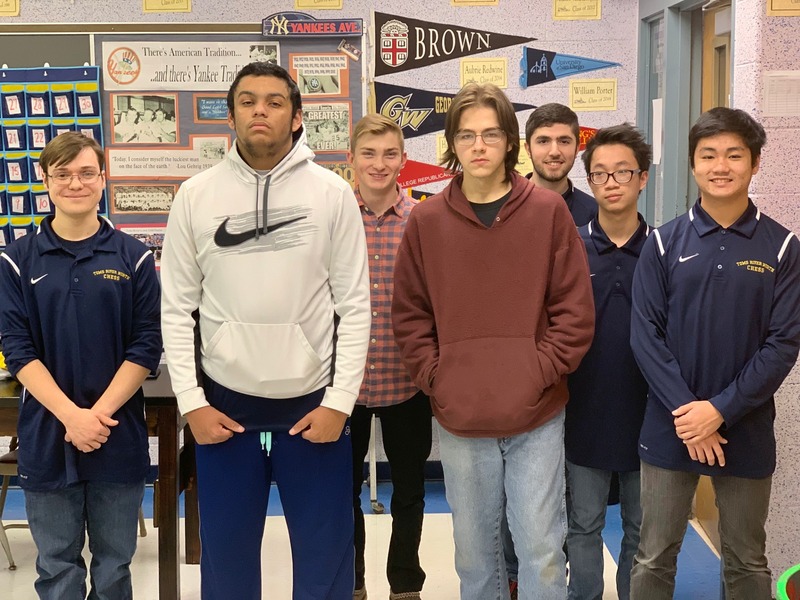 The Mariner Chess team is off to a terrific start posting a 4-0 record. 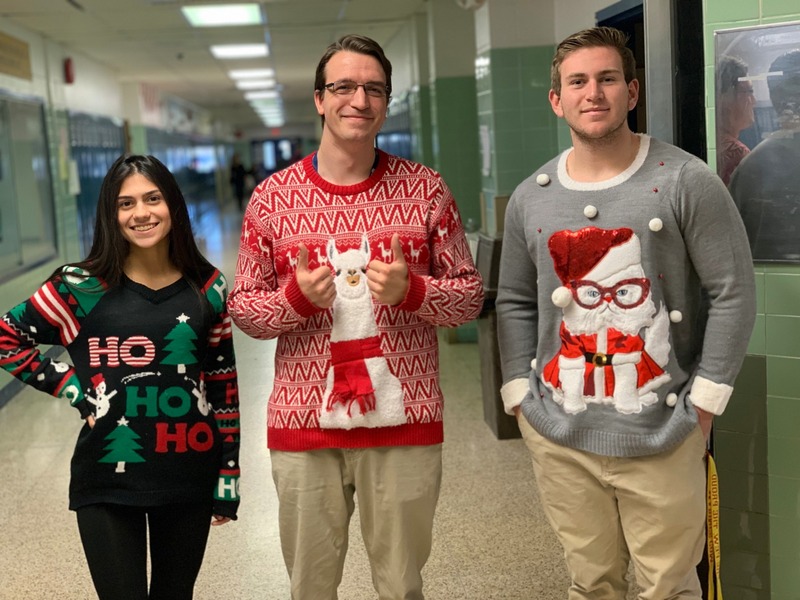 Staff and students showed their school spirit by participating in “Ugly Sweater Day”. 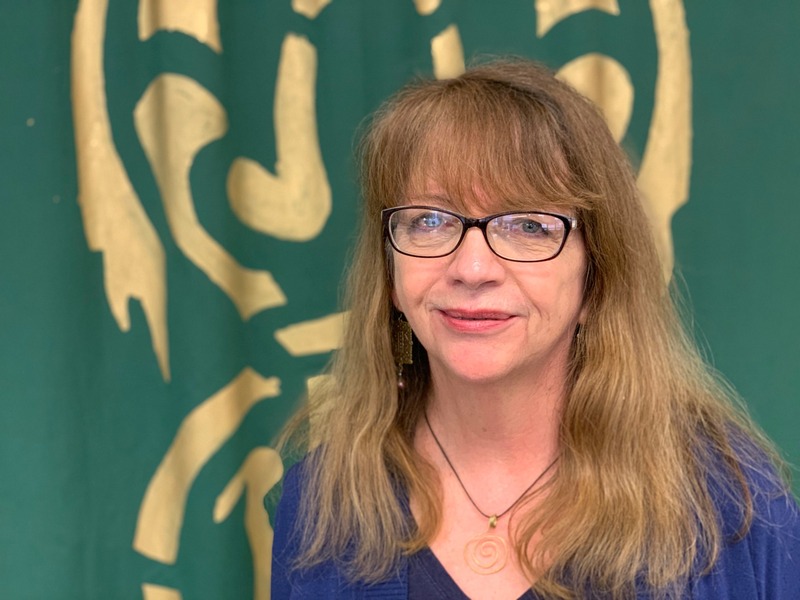 Congratulations to our 2018-19 Educational Support Staff Member of the Year, Mrs. Karla Ivarson! Mrs. Ivarson has been our media specialist for the last 3 years. 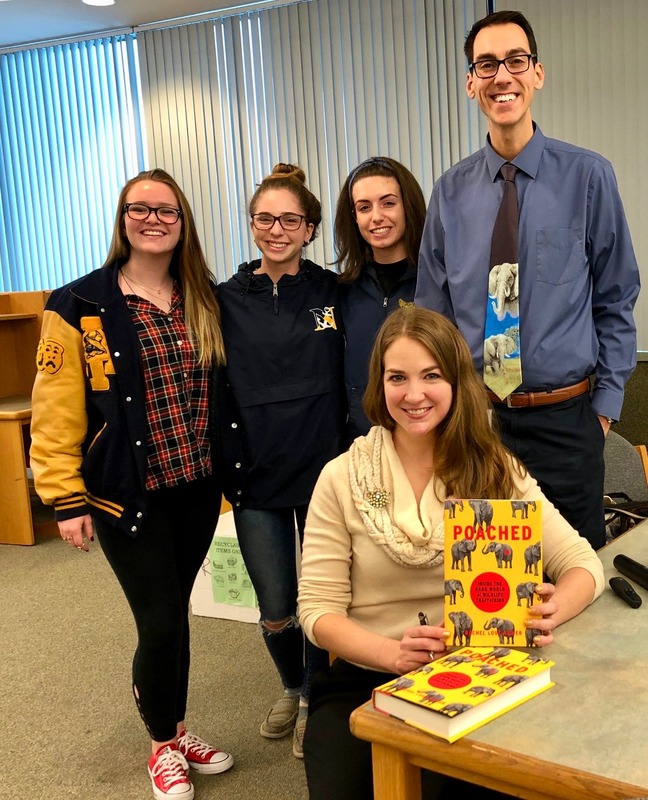 Prior to coming to North, she spent 10 years at the Ocean County Public Library and another 10 as a History /Political Science teacher at Brick Memorial. Karla enjoys the teamwork among our staff and was happily surprised and honored to be chosen by her colleagues. 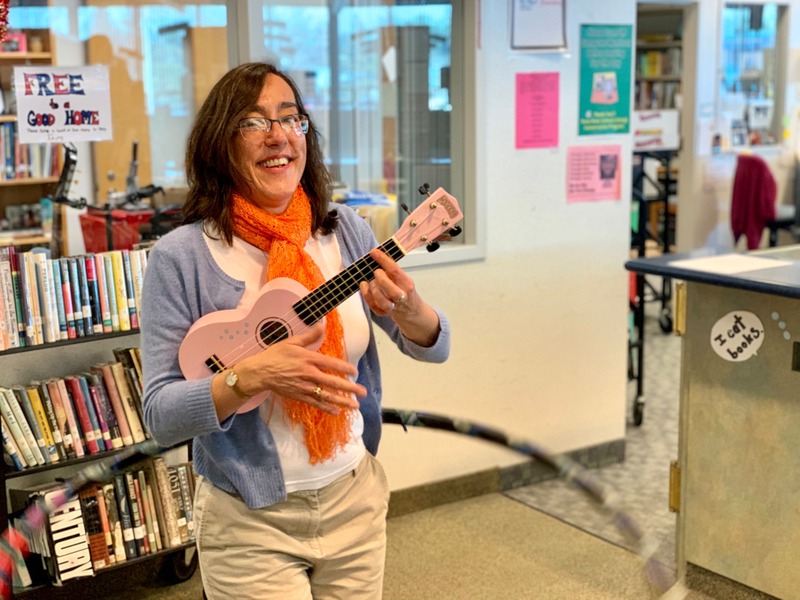 In her spare time (and in the media center) Mrs. Ivarson plays the guitar, banjo, and ukulele. She is currently learning to play the accordion. 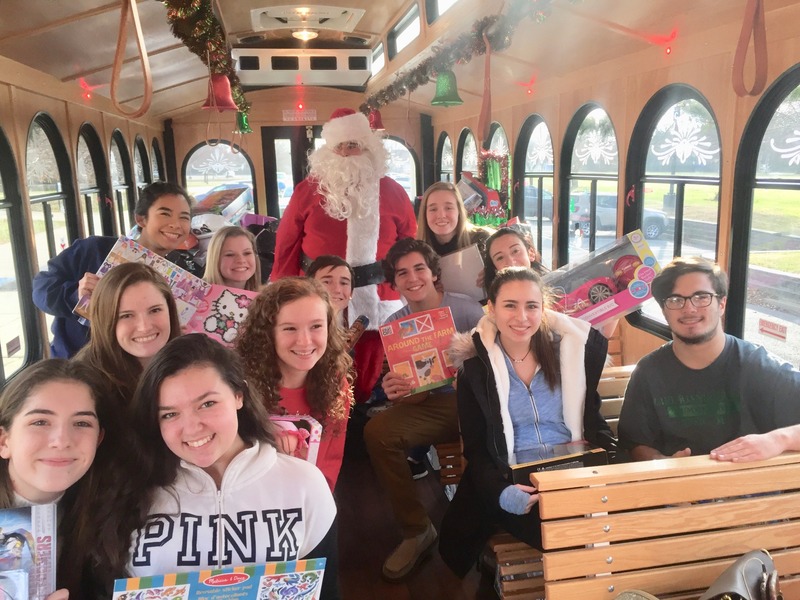 North’s NHS led a school wide effort to raise nearly $3,000 to purchase toys for the Salvation Army. All of the toys and gift cards go to underprivileged children so they can have a happy holiday! All of the homerooms that raised over $100 will be invited to a bagel breakfast as a way of saying thank you for their generosity. On Friday, the 18th annual New Jersey Model Congress got underway in Trenton. Nearly 300 students from across the state met at the State House Annex to write platforms for their political parties. Toms River North did particularly well at Party Day. Their Political and Legal Education Class was well prepared under the guidance of their advisor, Ms. General. 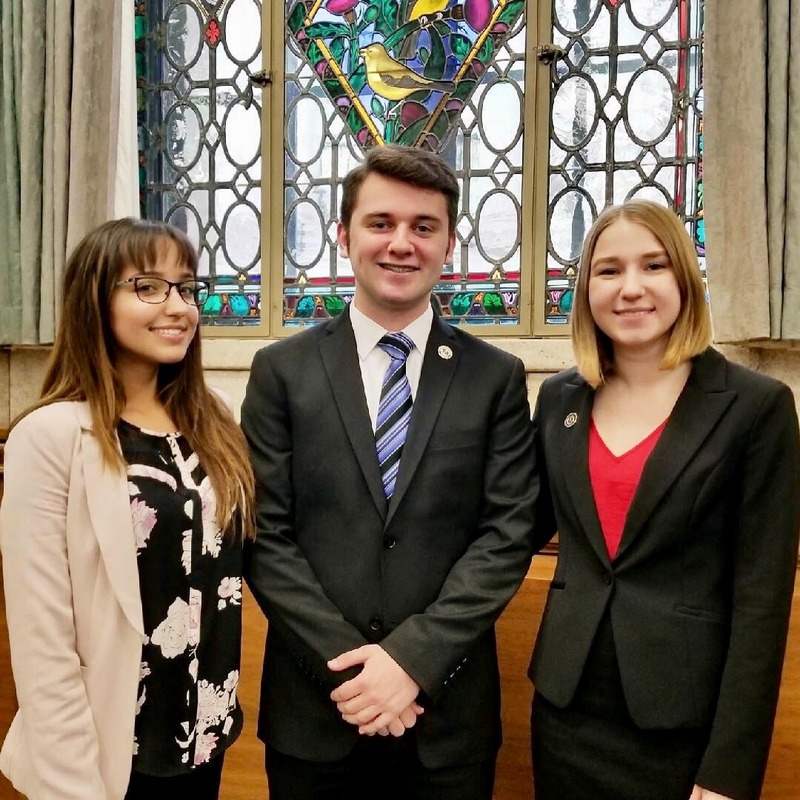 Chiara Feimer Independent), Zachary Dougherty (Democratic) and Gianna Daniele (Republican) won the three party leadership positions. 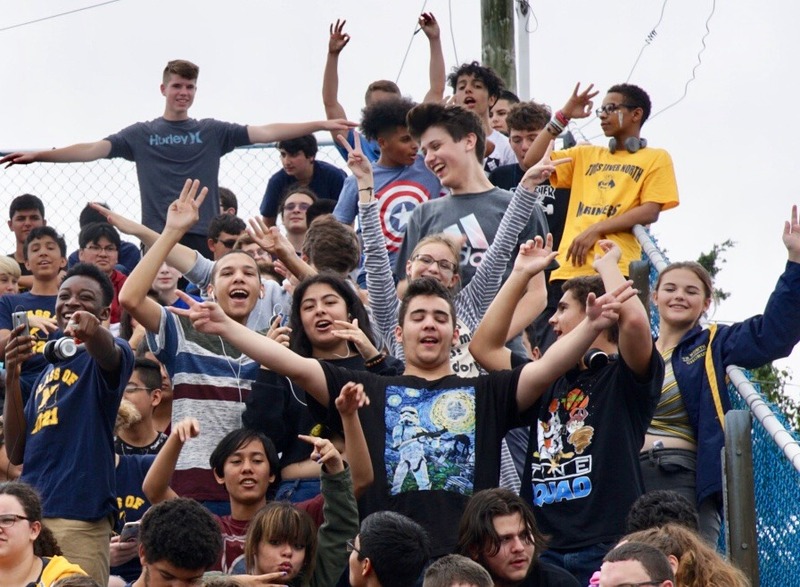 The Winter Pep Rally infused the student body with Mariner school spirit. Good luck to all Winter sports. 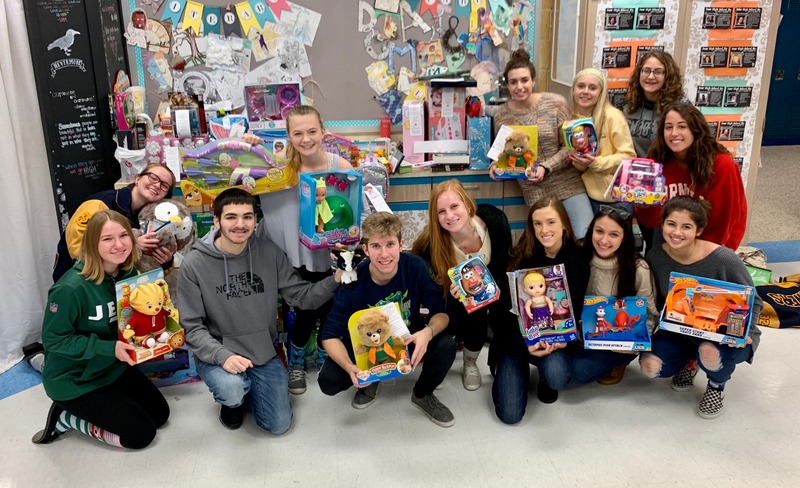 The Toms River High School North Thespian Troupe #7455 donated gifts to the Brick Pal and Toys for Tots. Santa himself came to collect all of the goodies. 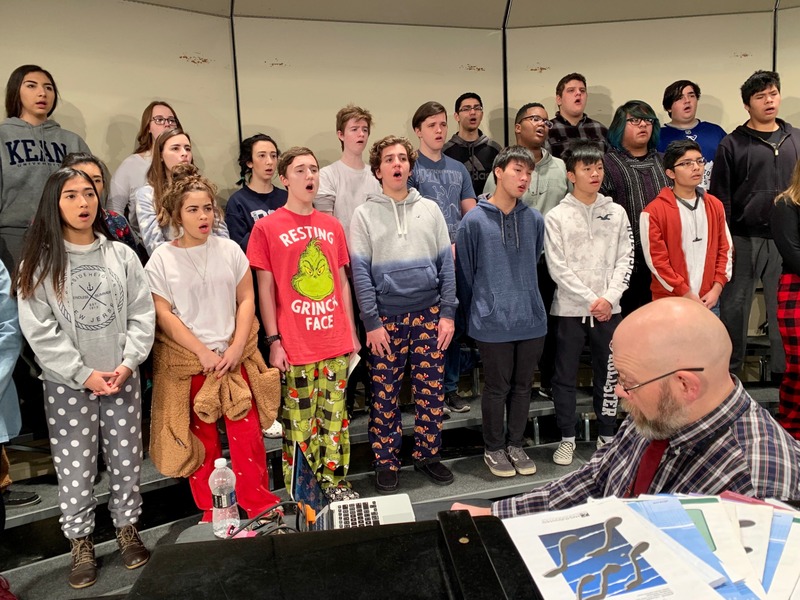 The TRN Chorus Director, Mr. Loeffler, prepares the chorus for the annual Winter Chorus Concert. The chorus will appear in complete attire tomorrow night at 7:00 pm in the auditorium. 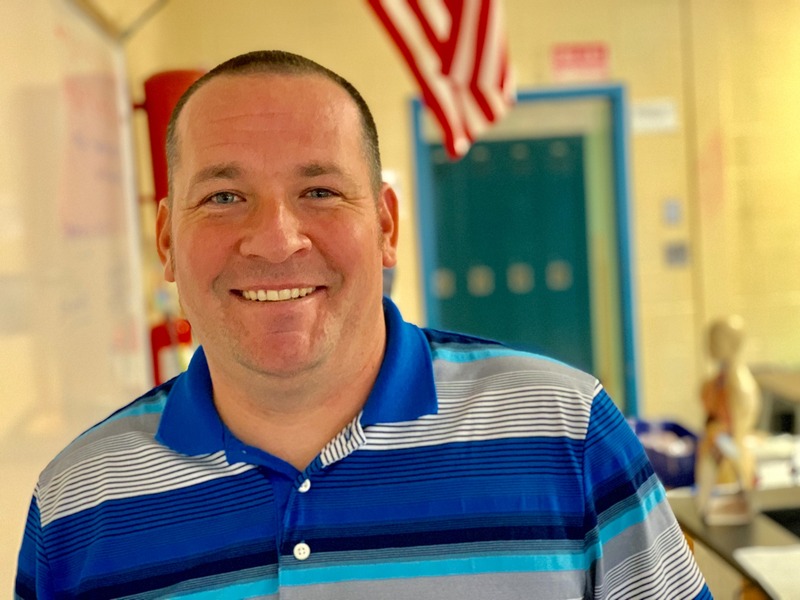 Mr. Jeff Gelnaw was recently selected by the NJSIAA to receive a NJ Award of Honor for coaching excellence in the sport of bowling. 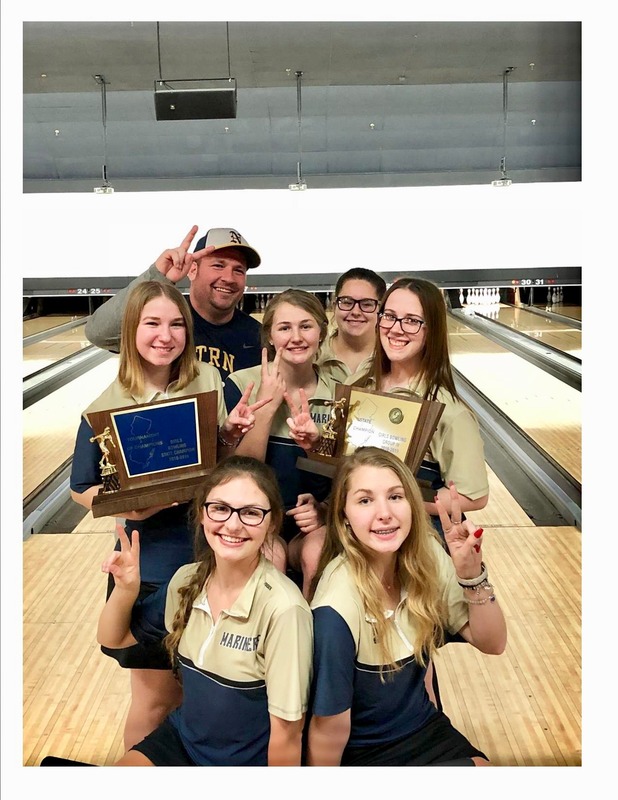 Congratulations to Coach Gelnaw and our girl’s bowling team. Go Mariners! 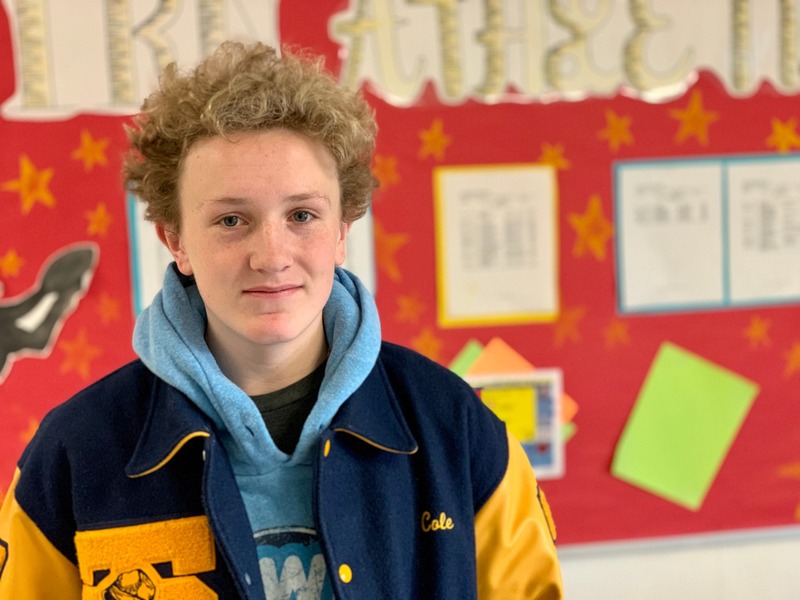 Congratulations to Boys Bowling Captain Robert Bartley on placing, 2nd out of 120 bowlers, in the South Jersey singles classic this past Saturday. Rob bowled a high game of 237 on his way to an impressive average of 210 throughout the course of the tournament. Great bowling Rob! 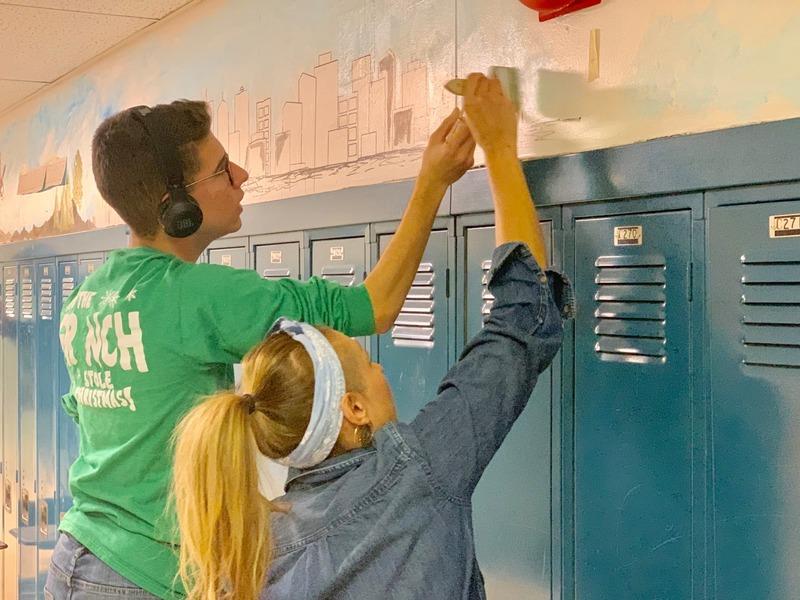 Ms. Hawthorne’s Visual Arts class is creating a college themed mural in C-Wing. Check it out! 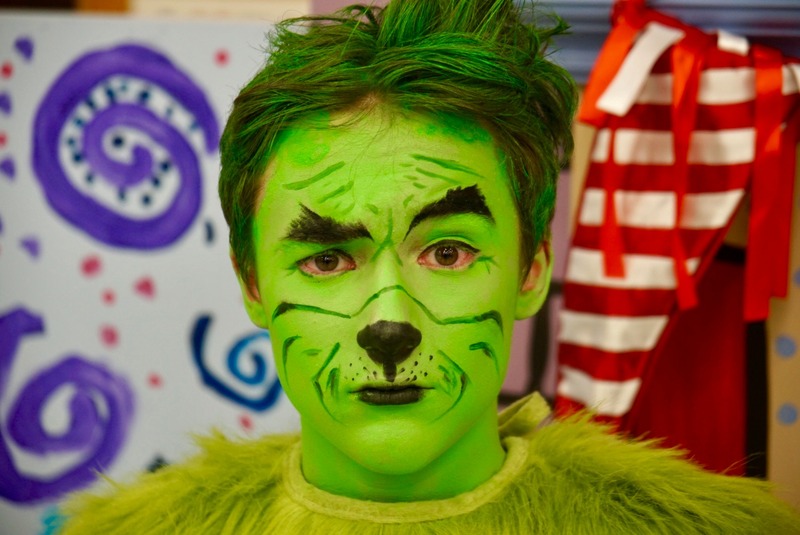 The Toms RIver High School North Nautical Star Theatre Company proudly presents: The Grinch, an interactive story time. The show opens on Saturday, December 8th at Intermediate North, 11:00 am and 7:00 pm. Tickets are $5.00. There will be a Character Meet and Greet following the 11 am show. Don't miss it! 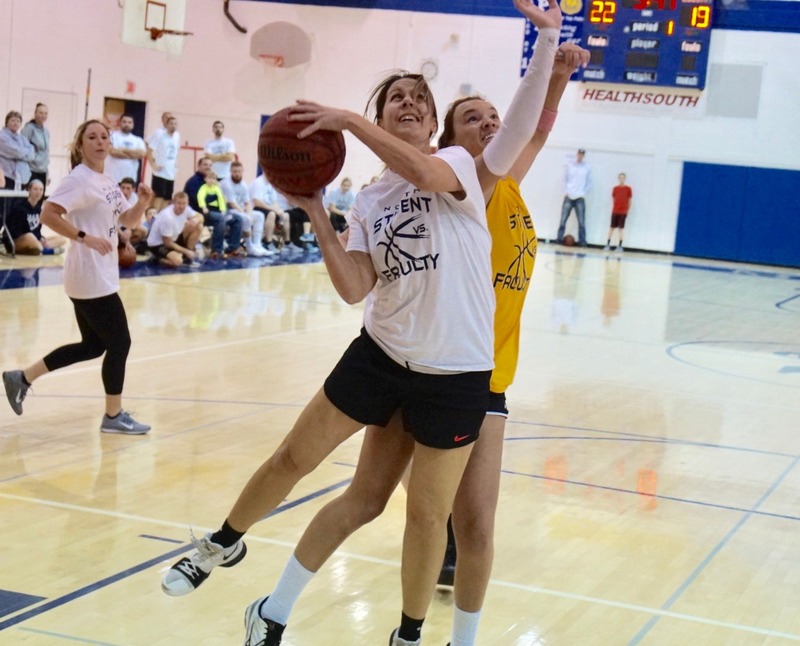 The TRN Girls basketball team had their annual Student/Faculty basketball game last night and what a great night of hoops in front of a packed house. Led by Faculty All Stars, Ms. Gillen, Ms. Mueller and Head Coach Mr. Barrett, the faculty came out on top 85-57. Art Academy Principal, Mr. Madigan and staff held an open house for interested parents and students. Opportunities to explore are Dance, Visual Arts, Vocal, Theater, Digital and Keyboards were presented to parents and students. After the presentation, the teachers provided break out groups for specific interests. Hillary Beckett, a Toms River Schools alumni spoke to the TRN Democratic club. 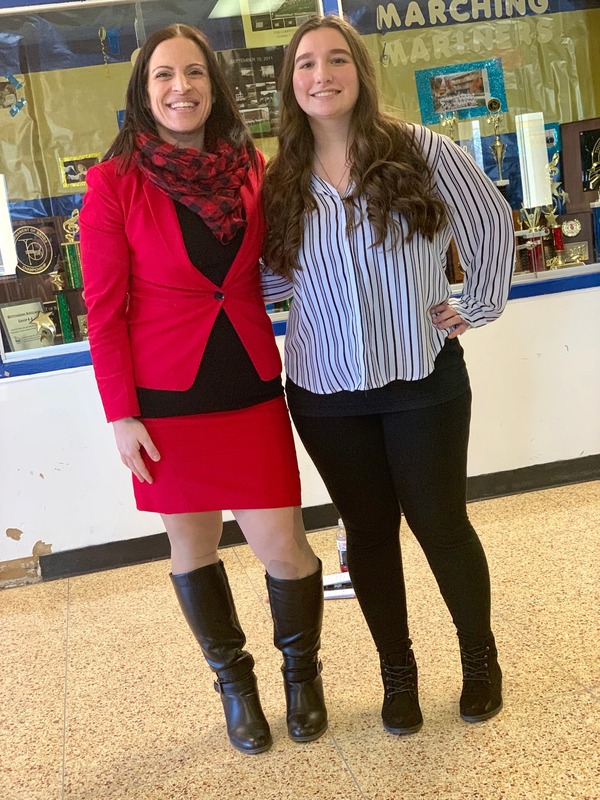 Ms. Beckett is the cabinet liaison for Governor Murphy, she shared her experience working with the Governor and how she is lobbying to have a law passed to ban the declawing of cats. Ms. Brooks encouraged club members to become involved in the political process to help create the kind of world we want to live in. Congratulations to our Staff Member of the Month, Mrs. Linda McBride! Mrs. McBride has taught here at High School North for the last 21 of her 26 year career. 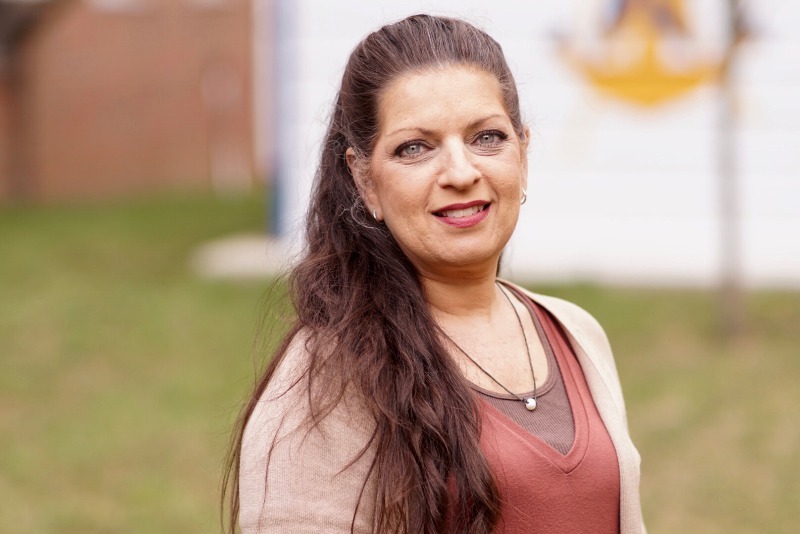 She taught Fashion Merchandising at Brookdale Community College before coming to Toms River. Currently, Mrs. McBride teaches Interior Fashion Design but has also taught both Family Consumer Science as well as Foods & Nutrition. Outside of school she enjoys sewing quilts and paddle boarding. Mrs. McBride enjoys working with her students because they are energetic and fun to be around. 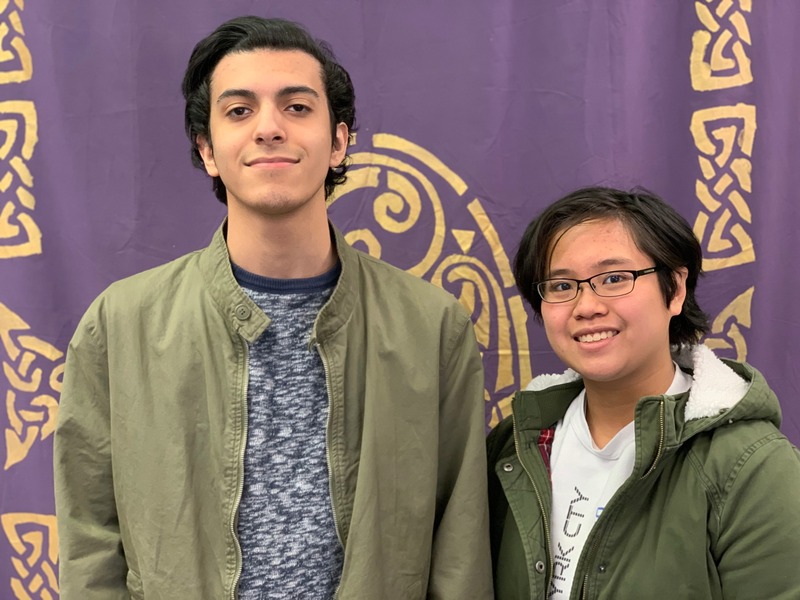 Congratulations to our December Students of the Month, Yna Tresvalles and Mohammad Ali Soltani! It is an exciting time to be in Mr. Seivard's Biology class. 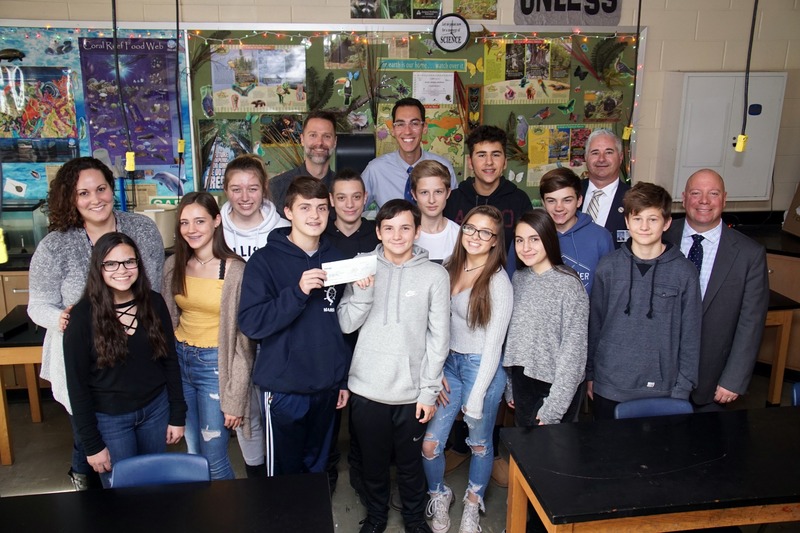 Ms. Ashley Whitehead stopped by yesterday with a grant check from First Energy The STEM Grant will be used in the freshmen environmental earth science classes at High School North to develop wind turbines. Utilizing the engineering design process, students will research, plan, develop, and improve their models. Aesthetic appeal and voltage generated will play a fundamental part of turbine development. Thank you to everyone who contributed to the NHS Thanksgiving Food Drive. Over 2000 cans of food were donated to help families in our area. Together three homerooms, C05 Mrs. Vargas, BB4 Mrs. Newman, and F105 Ms. Douress, collected over 400 items. They will receive doughnuts this Friday morning. Again, thanks to all for your generosity! 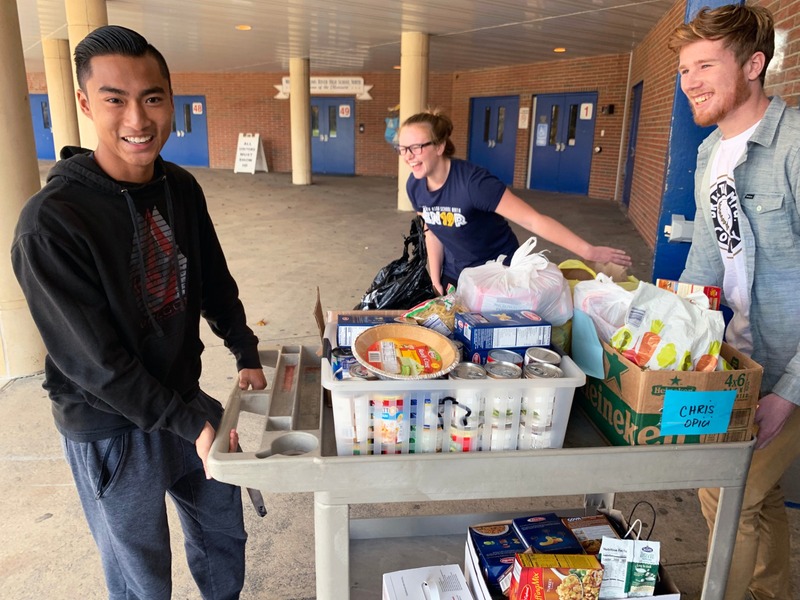 The members of Toms River North National Honor Society collected over 2,000 items for local food pantries in their annual Thanksgiving Food Drive. 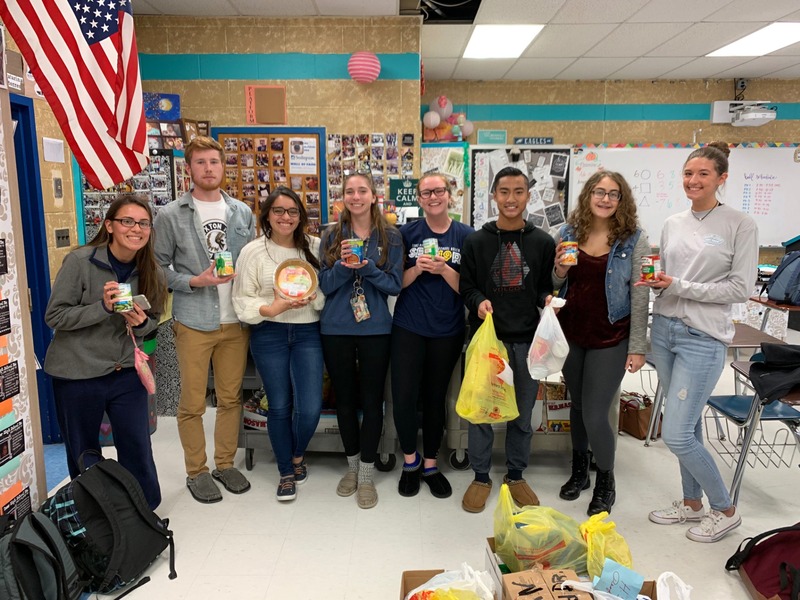 NHS would like to thank their classmates and the members of the Toms River community who all contributed and made the food drive a success! 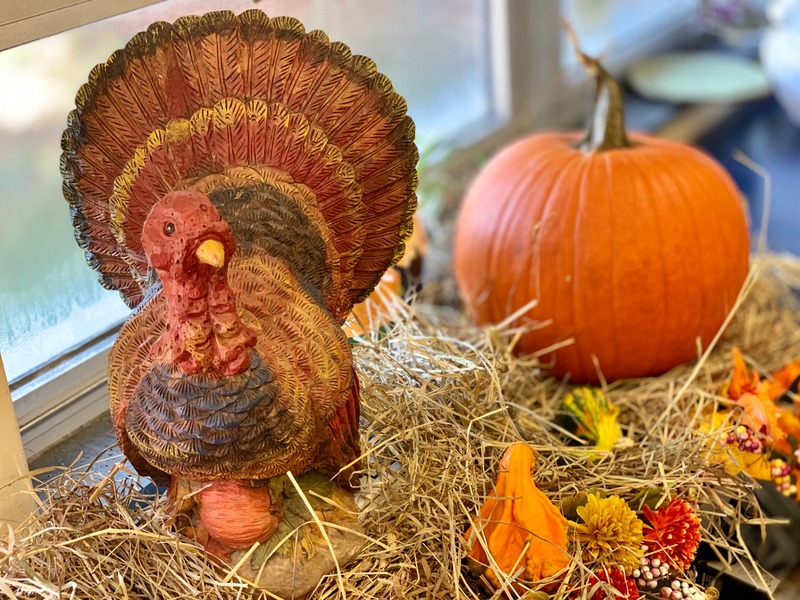 On behalf of Principal Keller and entire Mariner family, may everyone have a blessed Thanksgiving Day. The coaches at Monmouth University will be thrilled to learn that last night, Maggie Downs received the "Most Valuable Player" award at the Field Hockey banquet. Maggie's 63 goals and 47 assists this season made her the clear favorite. 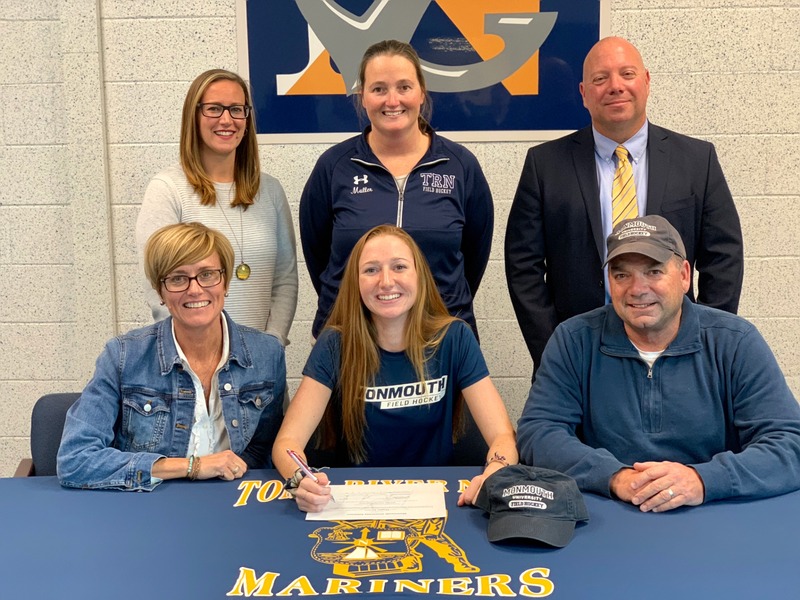 She will continue with her Field Hockey prowess next fall playing on a scholarship for the Monmouth Hawks. Maggie is also an outstanding student, and will most likely have a successful college career. Congratulations Maggie, all the best in everything you do! Go Mariners! 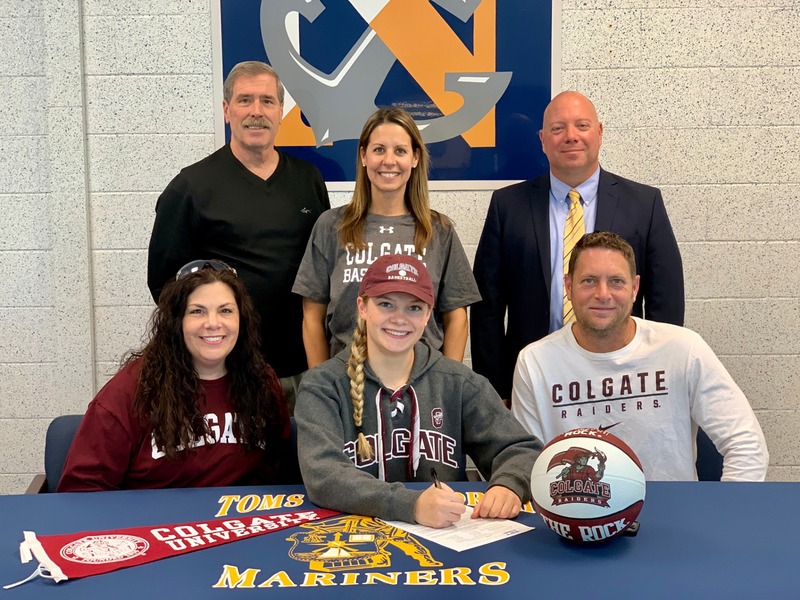 North senior, Jenna Paul received a full scholarship and signed a letter of intent to play basketball for Colgate University. Last season, Jenna scored her 1,000th career point and plans to continue adding on when basketball season begins next week. Jenna will be a biology major and plans on pursuing a career as a medical examiner. Good luck Jenna and thank you for all the exciting moments on the basketball court. 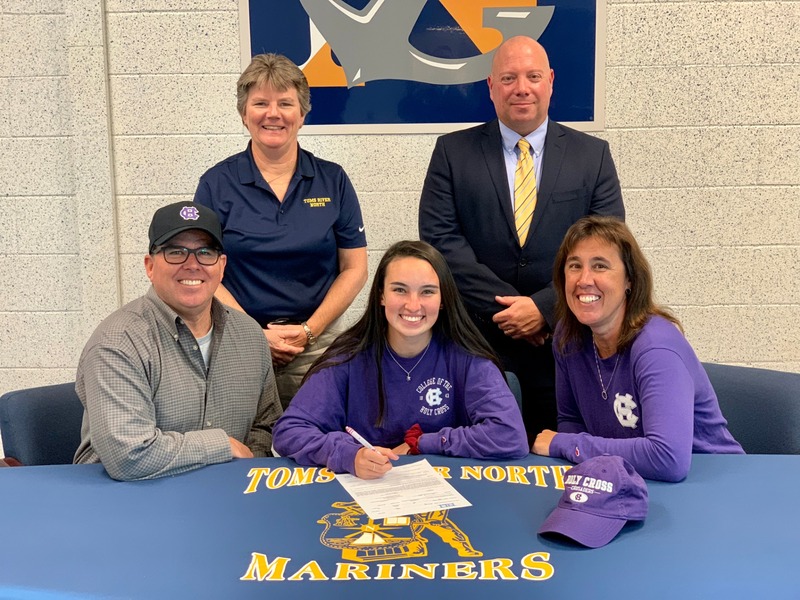 Congratulations to Kaci Neveling for signing a letter of intent to attend the College of the Holy Cross after graduation. Kaci, who is an excellent softball player, will receive a scholarship to take the field with the Crusaders. Kaci plans to continue her studies with a major in Psychology and aspires to be a sports psychologist. 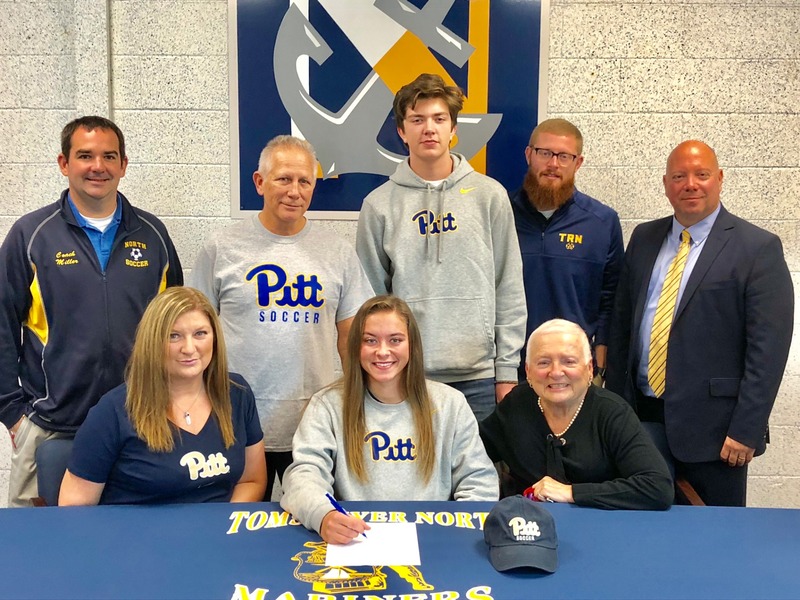 After being named "Player of the Week" and leading the Girls Soccer team to a Shore Conference title for the first time since 2012, Marisa Tava signed a letter of intent to attend Pittsburgh University in the Fall. "Roc the Panther", Pittsburgh's mascot will be cheering on Marissa on the soccer field, along with the countries top scholarship athletes. Marissa, who compiled an excellent grade point average over the past four years, and plans to major in Biology. Good Luck Marisa and Go Mariners! Go Panthers! 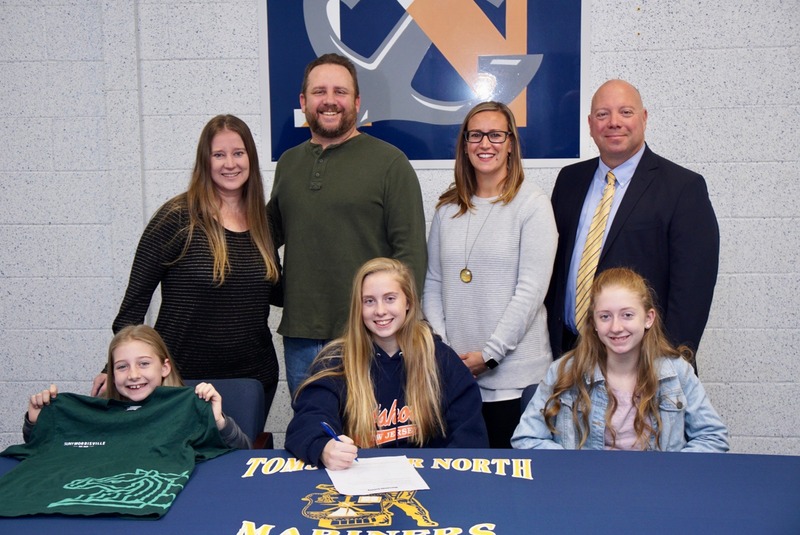 Congratulations to MacKenzie Braun who will be attending SUNY Morrisville State University of New York. MacKenzie signed a letter of intent and will receive a scholarship to play Softball for the Mustangs. 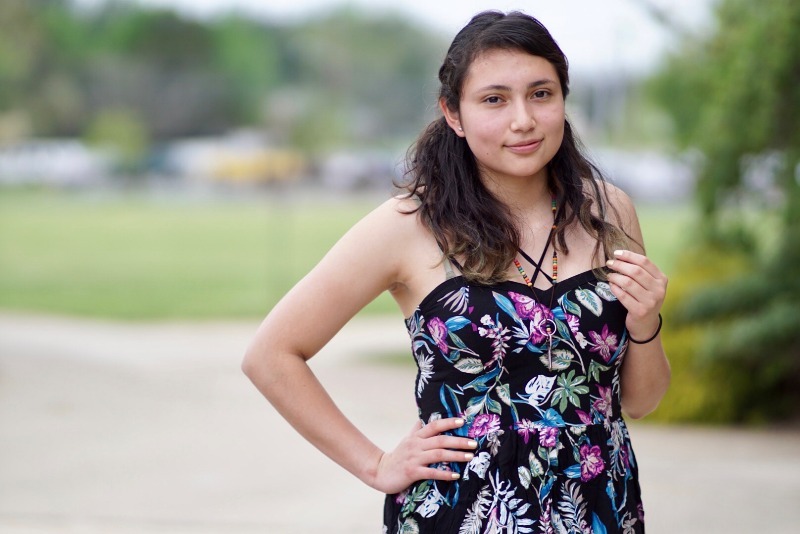 She plans to major in Criminal Justice with an emphasis on Forensic Science. Thank you MacKenzie for an outstanding four years at North and all your contributions! All the best as you embark on a new journey. 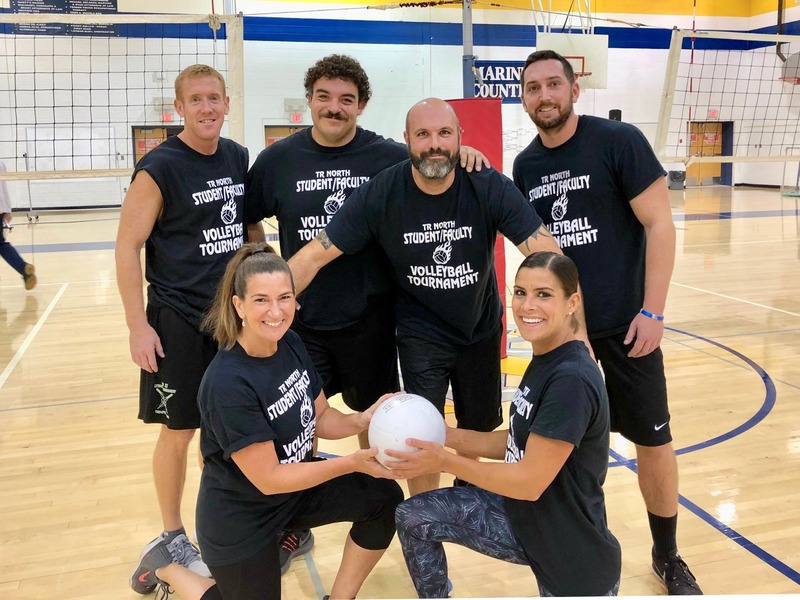 The class of 2021 held their Student-Faculty fundraiser last night and it was the Physical Education Department that came out victorious. Wiping the sweat from his brow, Head Coach Mr. Salvaggione beamed with pride for his team. "Between Ms. O'Connor's devastating serves and Ms. Silva's amazing digs in the clutch, it went pretty much our way all night." Congratulations to everyone who participated for making it a fun evening for all. Congratulations to our Staff Member of the Month, Mr. Jon Grill! Mr. 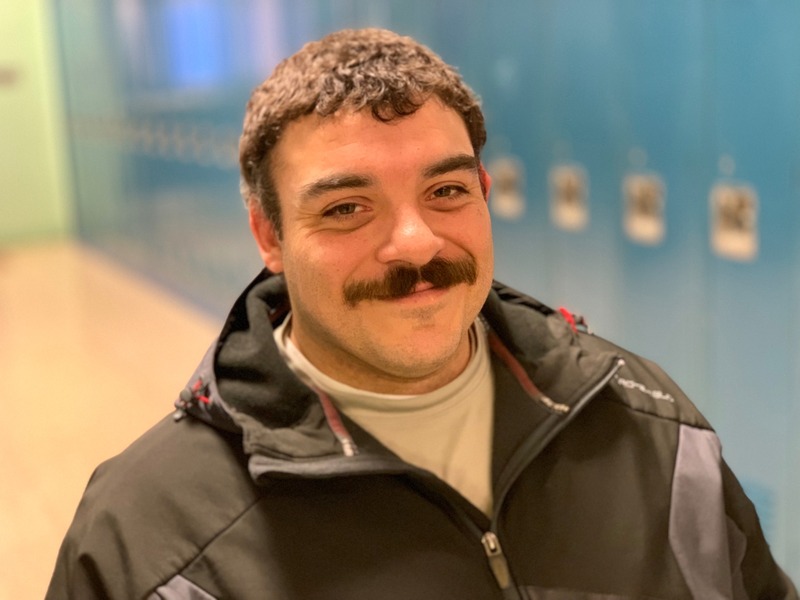 Grill has taught at HS North for the past nine years of his 13 year career. 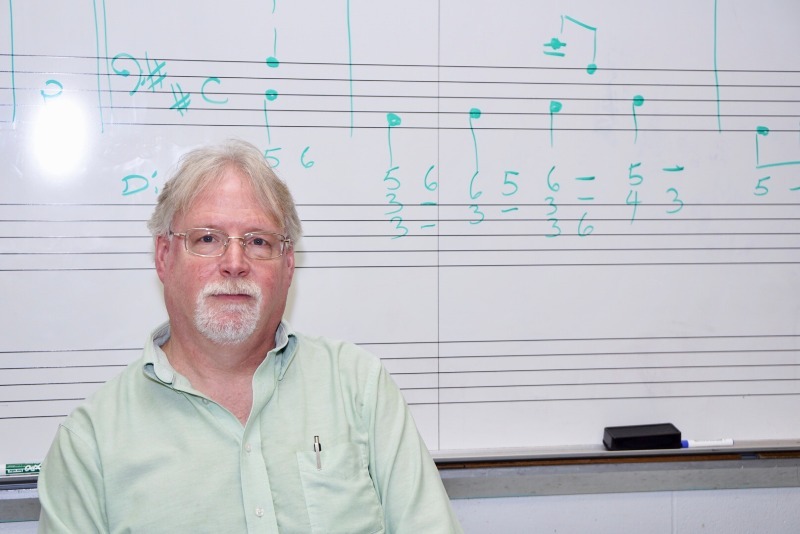 He currently teaches the History of Rock and Roll and Band. Each year he spends countless hours with our Marching Mariners, helping them to become the best they can be. During his spare time, Mr. Grill enjoys mountain biking and playing with his band, We’ll Be Fine. He thanks everyone who considered him for this honor and counts our staff and students among the things that make our school great. 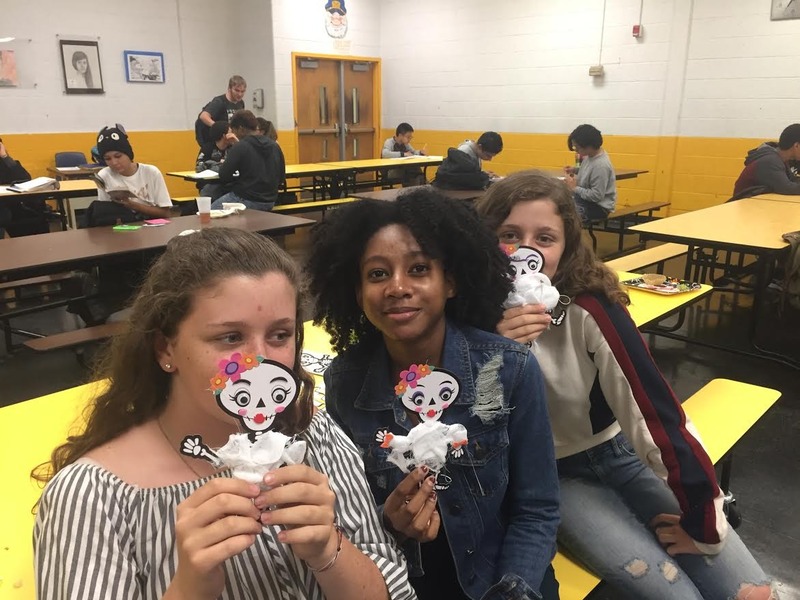 The TRHSN Spanish Club met on November 1st to celebrate the Latin-American celebration of "El Dia de los Muertos", or the "Day of the Dead" in the Gold Cafeteria. The Spanish Club students organized a fiesta, complete with all of the ingredients of a typical Day of the Dead ofrenda (altar), such as pan de muerto and pan dulce (sweet bread), as well as some Jarritos sodas and juices. While they ate their delicious snacks, the students enjoyed painting their faces as calaveras (skulls) and making craft skulls to take home to celebrate the holiday. The popular Latin-American holiday of el Dia de los Muertos celebrates the lives of friends and loved ones who have passed on each November 1st and 2nd. Paraprofessional Ms. Patricia Leverett, and the 2nd period media assistants test drive Ozobots. These small, programmable robots follow the paths created by students, performing different actions based on the color of the line. Amazing! 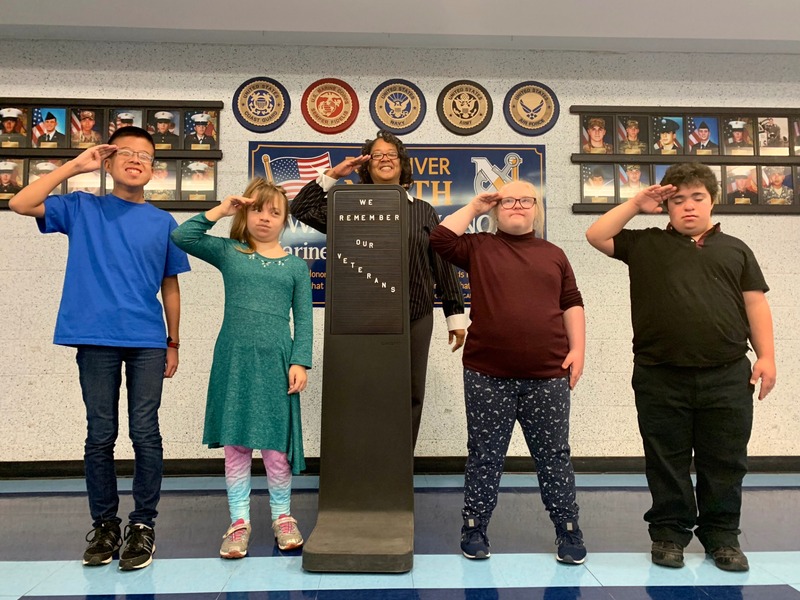 The Toms River North Media Center assistants created a display and salute to honor all the men and women who dedicated and even sacrificed their lives so that we may enjoy all of our freedoms. The Mariner Field Hockey team had great representation in this week's All Star game that included players from North, South, East and players from both A South and B South. 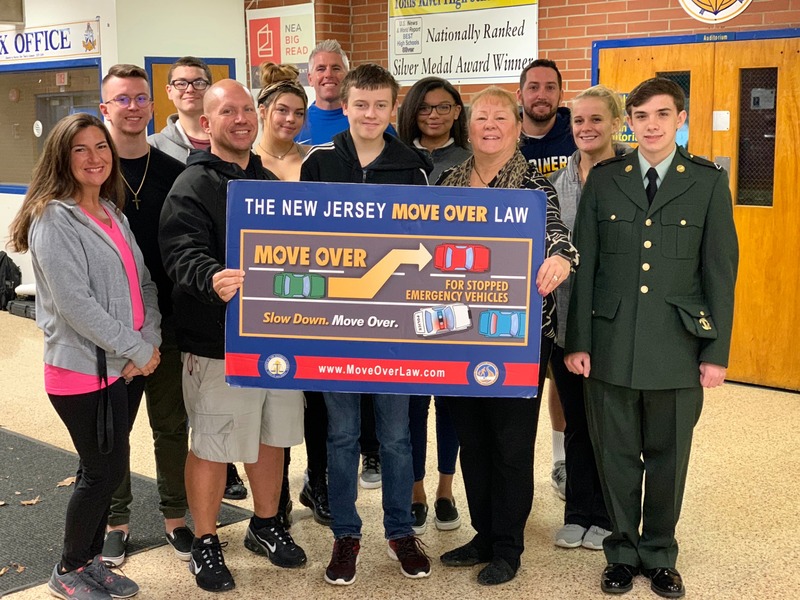 Mrs Donna Setaro spoke with the Sophomore Drivers Education class this morning about the importance while driving to move over for all stopped emergency vehicles. Mrs. Setaro was instrumental in passing the "Move Over" driving law to prevent accidents on our roads. 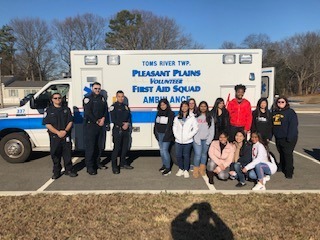 We are fortunate to have this life saving message presented to our students and look forward to having Mrs. Setaro be an integral part of the driving education program. A special thanks to Mr. Bowes for organizing the presentation. Congratulations to our November Students of the Month, Jordan Sammarco and Stavon Drew! 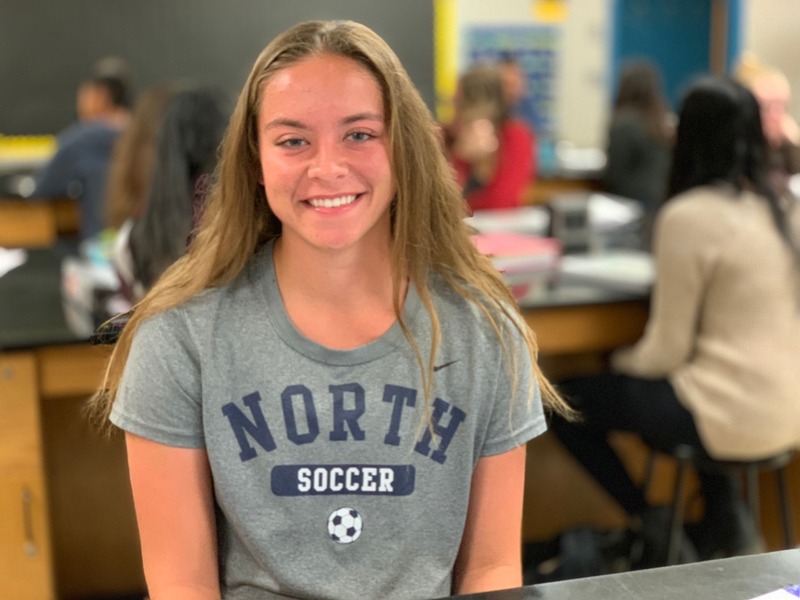 Congratulations to Marisa Tava for being selected as the girls soccer "Player of the Week". 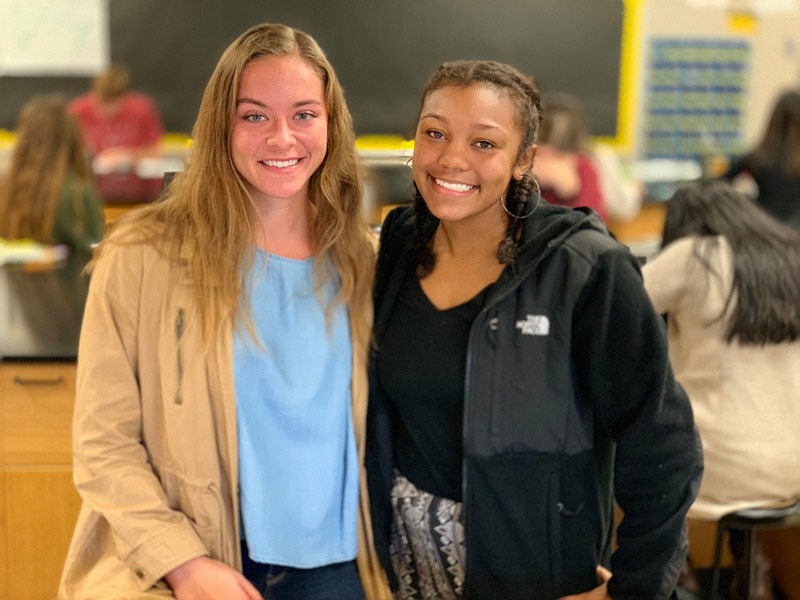 Pictured with teammate, Jazmin Brown (who was last week's POTW), Marisa was part of a total team effort for Toms RIver North to win the Shore Conference Tournament. Good luck in the States. 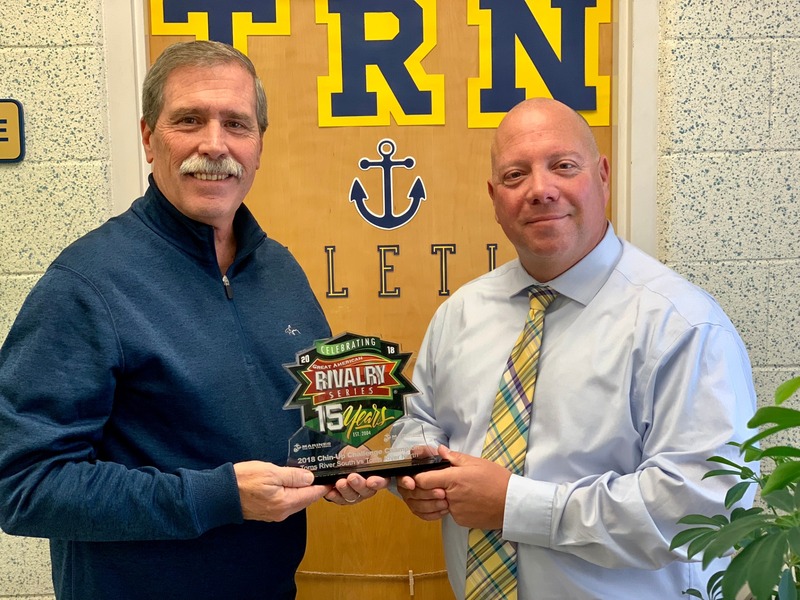 Principal Edward Keller "hands off" the Great American Rivalry Series Trophy to Athletic Director, Mr. Paul "Barno" Barnoski after the Mariners won the 2018 Chin-Up Challenge Championship during the North vs South football game. Sign up for the fan bus as the boys head down to Vineland High School this Friday to play in the first round of the South Jersey Group V State Championships. Senior Night and a Win! 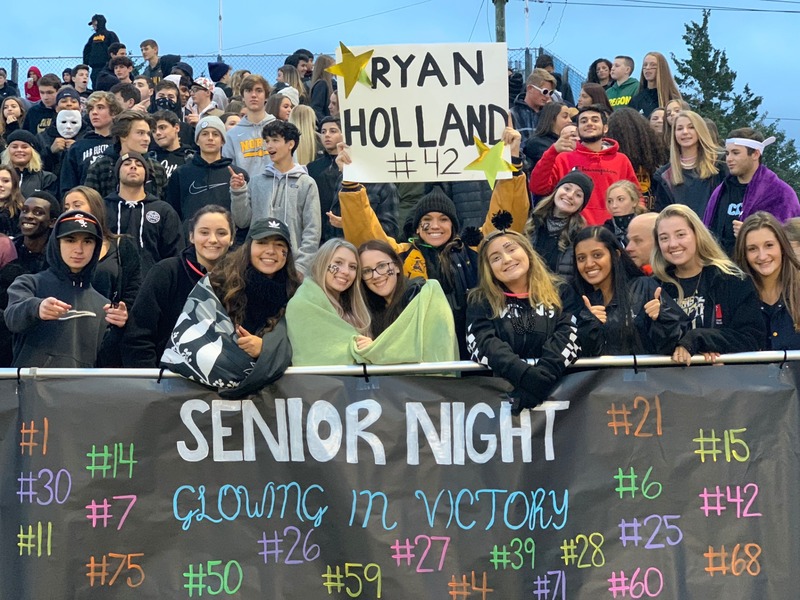 It was Senior Night at last Friday's football game and the enthusiastic Mariner student body kept the spirits high as our football team rolled on to victory defeating a strong Southern Regional, 31-21. Go Mariners! Congratulations to Jazmin Brown for being selected as the Asbury Park Press' "Player of the Week". 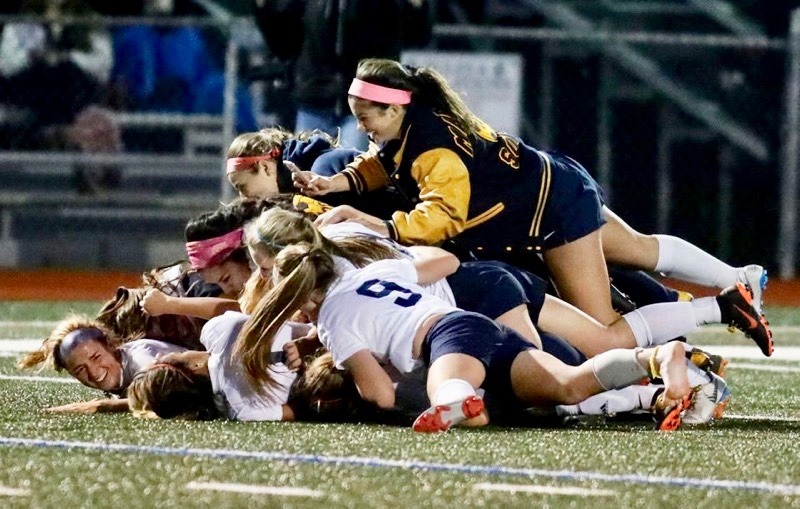 Jazmin's late scoring goal in the final minutes of the semi-final game, breaking a 0-0 tie, helped propel the Lady Mariners to last night's Shore Conference Title defeating a strong Red Bank team 1-0. Now, it is on to the States! Go Mariners! Congratulations to the Lady Mariner soccer team for becoming Shore Conference Tournament champions last night with their 1-0 win over Red Bank Catholic! Toms River High School North Thespian Troupe #7455 and the Mariner Orchestra put on their annual Safe Halloween event for the Toms River community. 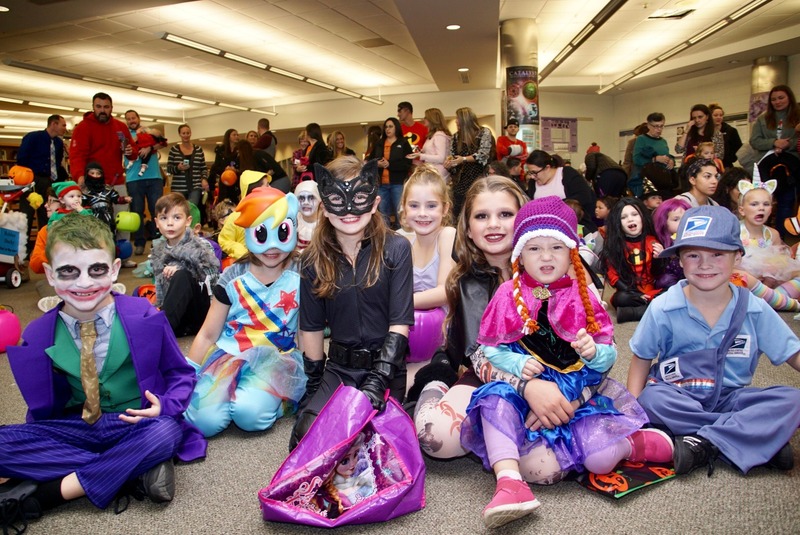 The event began with a spooky concert that delighted all the young children, followed by trick-or-treating throughout the Halloween themed decorated hallways . Over 25 clubs and sports participated by giving out candy and treats to the young children. A great time was had by all! 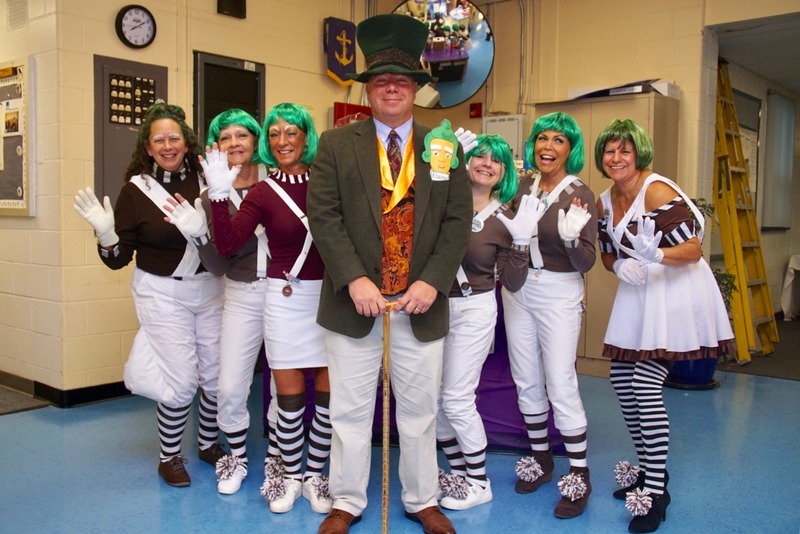 A special thank you to Ms. Carolyn Little and Ms. Susan DeGoey for making this year’s Halloween extra special. 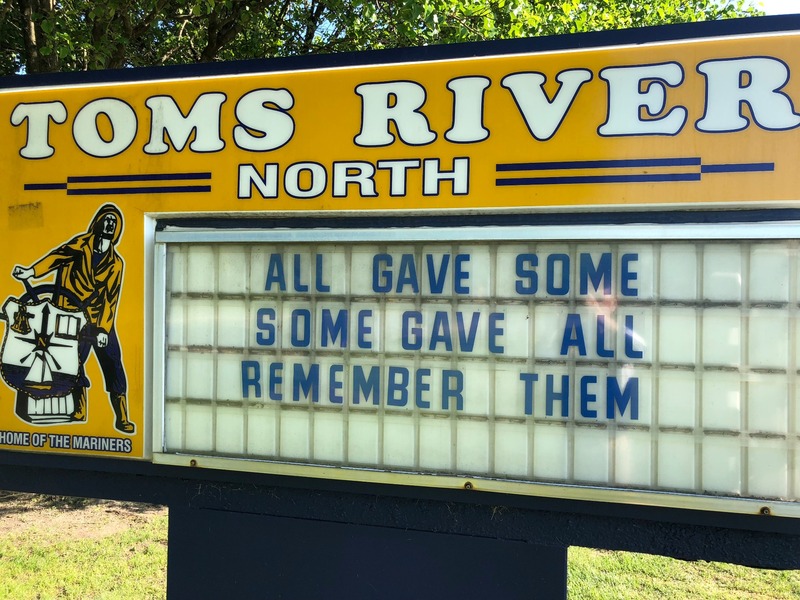 Toms River H.S. North’s A.P. 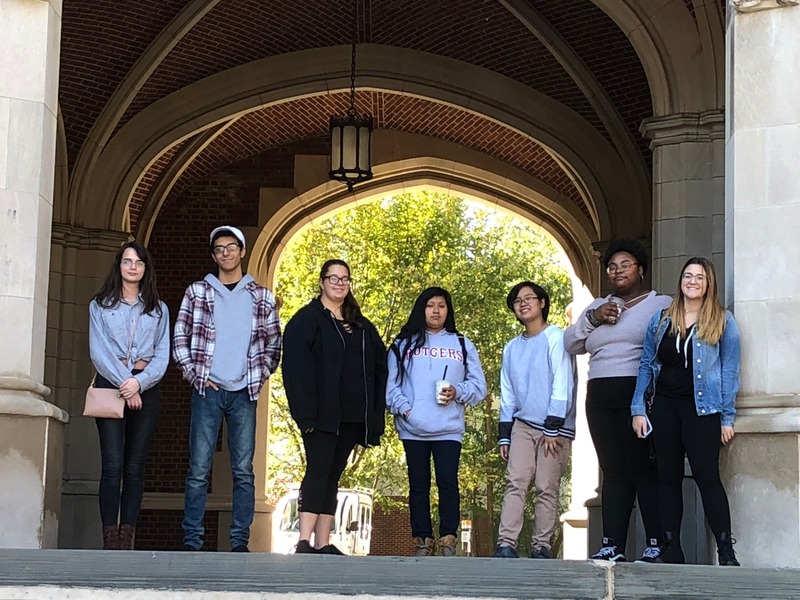 Studio Art and Senior Portfolio students (pictured) along with the Visual Arts Academy students visited the Princeton University Art Museum on October 23. Students went on a tour of the museum and were able to spend additional time exploring the collections on their own. A wonderful day was spent on this beautiful campus! 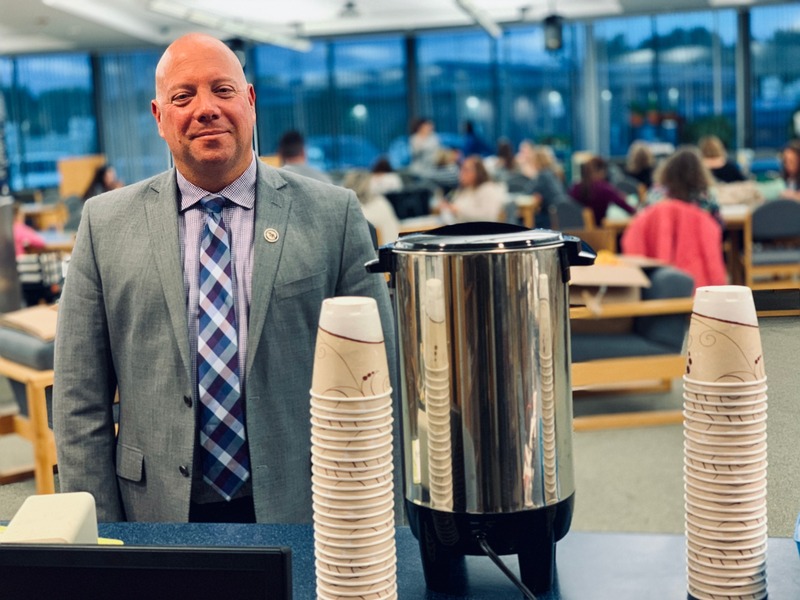 Mr. Keller hosted the annual “Coffee With The Principal” for the 12th grade parents. 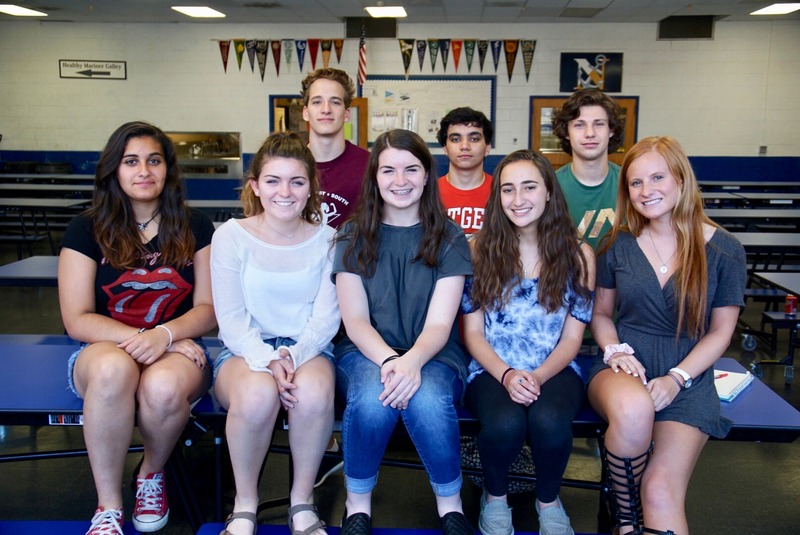 Parents had the opportunity to meet with the class advisers and student leaders to discuss the many resources available at North that will help ensure a memorable senior year and success in college. Congratulations to the Marching Mariners for capturing 1st place in the New Jersey State Championship. Also, for the 4th time in 5 years, they won the New York/New Jersey Regional 10 Championship. Dance Academy travels to "Egypt". 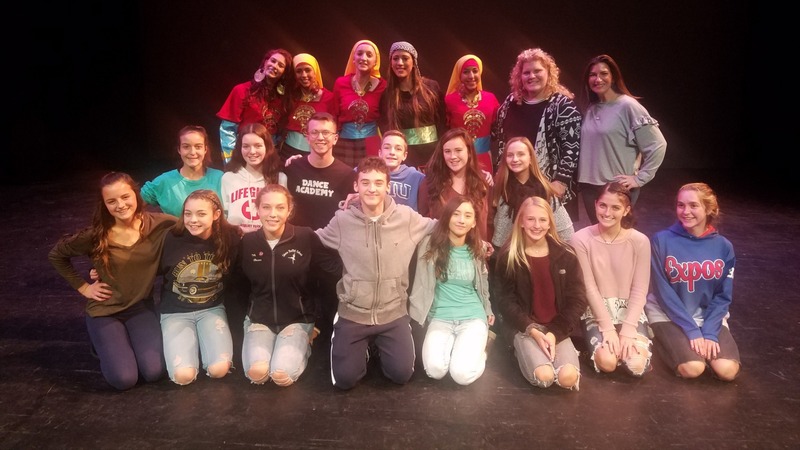 The Toms River North Dance Academy travelled to the Grunin Center to learn from the Alexandria Folk Dance Troupe of Egypt. The troupe's performance method is based on and influenced by Egyptian folklore. A highlight of the trip was being able to perform with the troupe on stage and participate in the finale. National Teen Driver Safety Week (NTDSW) is dedicated to raising awareness and seeking solutions to prevent teen injuries and deaths on the road. 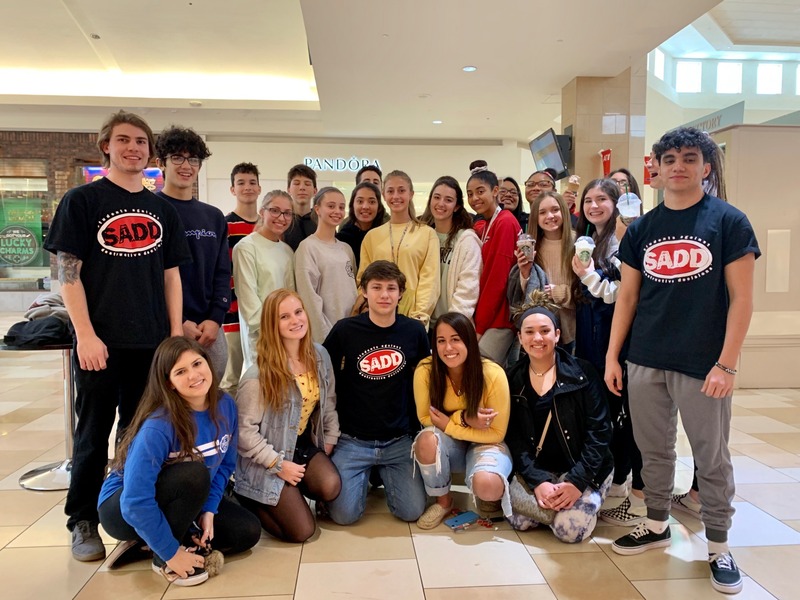 Members of Students Against Destructive Decisions (SADD) organized a teen safety driving program to help tackle this issue to help prevent car accidents. 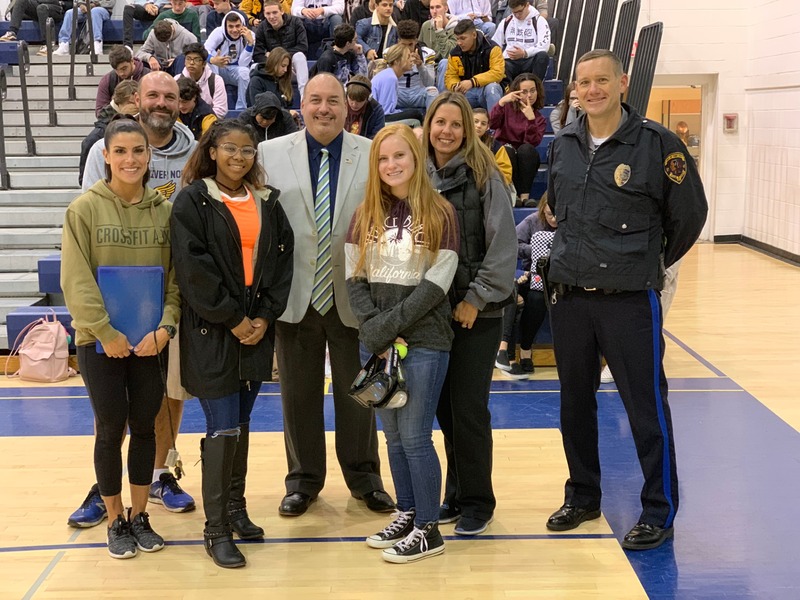 Students Against Destructive Decisions (SADD), Toms River Police, Ocean County Health Department and the Physical Education Department collaborated on bringing the “3 D’s- Drinking, Drugging and Driving program to the Junior and Senior class. The TRN Annual Coat Drive will be held from October 8th until November 2nd. Please bring any coats, hats, mittens, scarves etc. to the Main Office. There is a donation box in the main office hallway leading to Guidance. All donations will be given to needy families. The Student Council thanks you for your support and kindness. 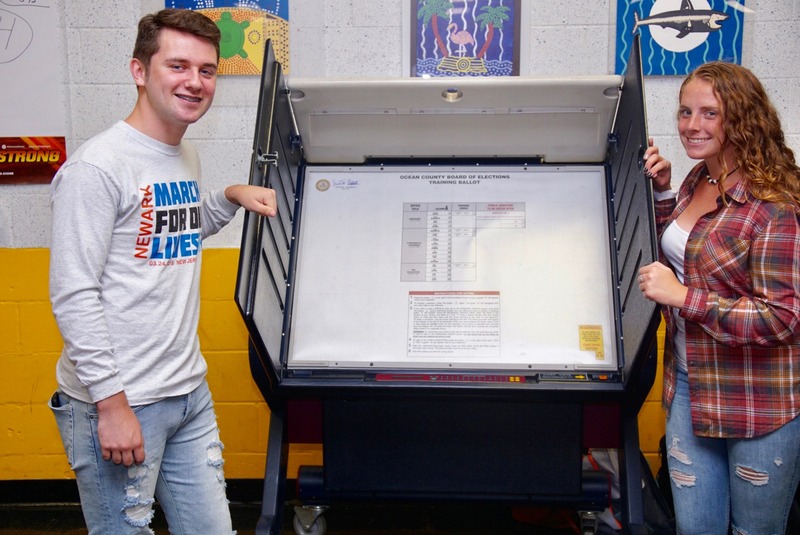 The Political and Legal Education class of Toms River High School North teamed up with the League of Women Voters to encourage seniors to take part in the democratic process by registering to vote. 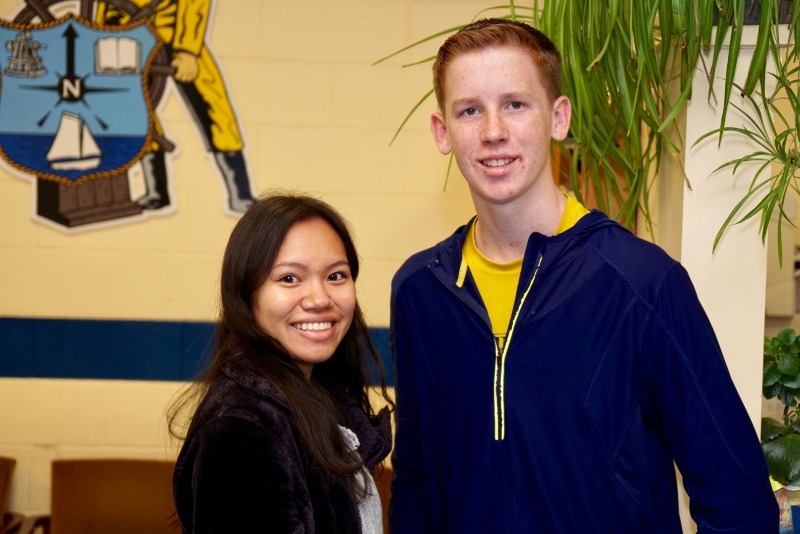 Congratulations to our Students of the Month John Green and Shannon Culbert! 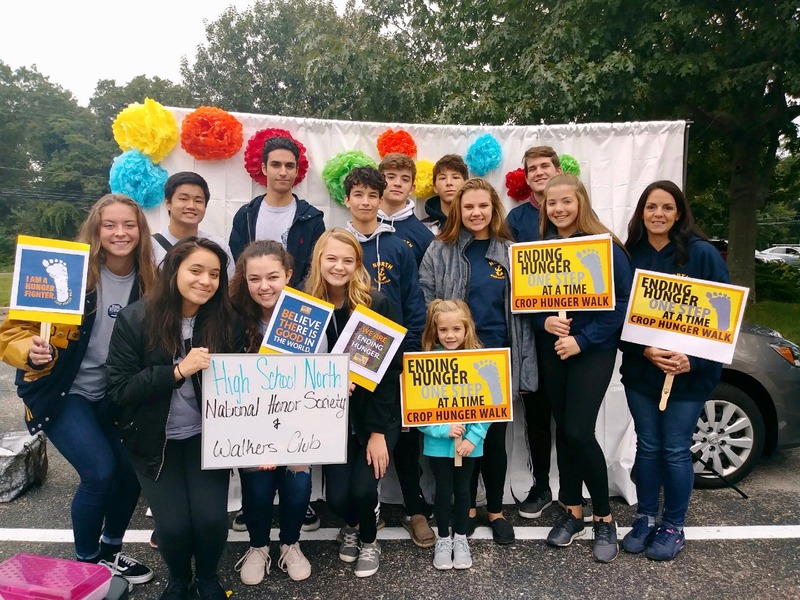 Toms River High School North’s Walkers Club and National Honor Society teamed up to serve at the Crop Hunger Walk. 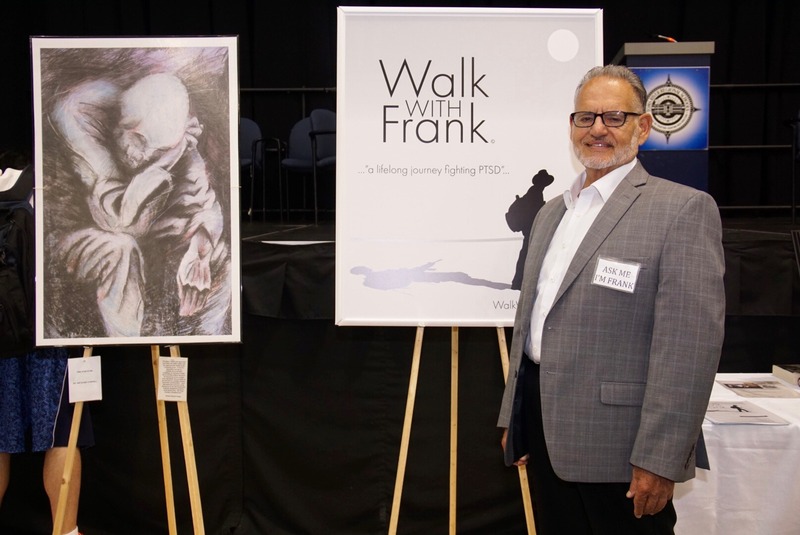 This event served to raise money and awareness to local and world hunger, as well as to support the House of Hope and Interfaith Hospitality Network. The Freshman “Constellation” class aka The Green Team, cheer on their classmates to victory. 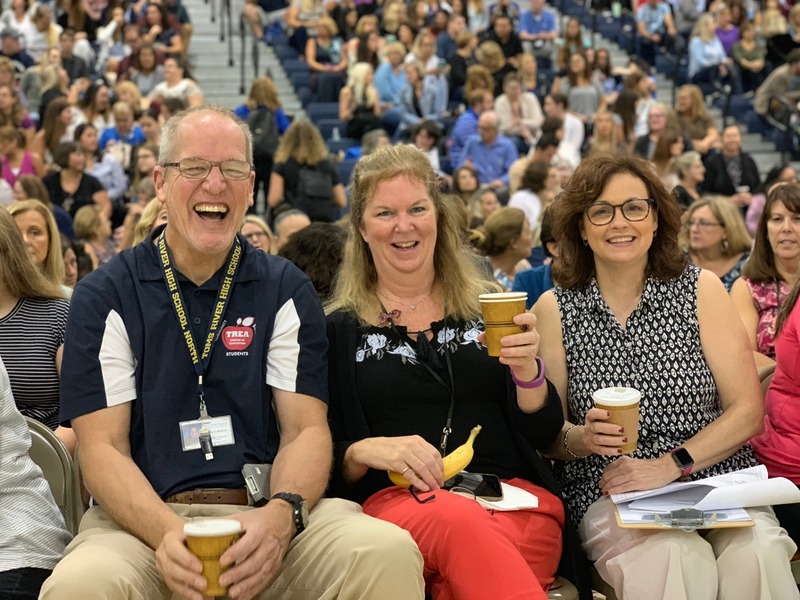 Yesterday, more than two thousand Toms River Regional Schools employees attended a professional development event hosted by the district with the theme of "Engaging the Whole Child." 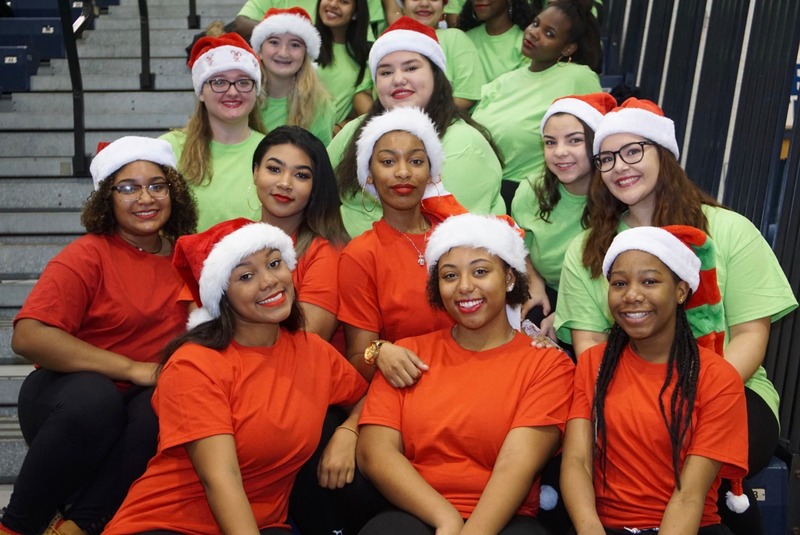 The event was held at RWJBarnabas Health Arena and throughout High School North. 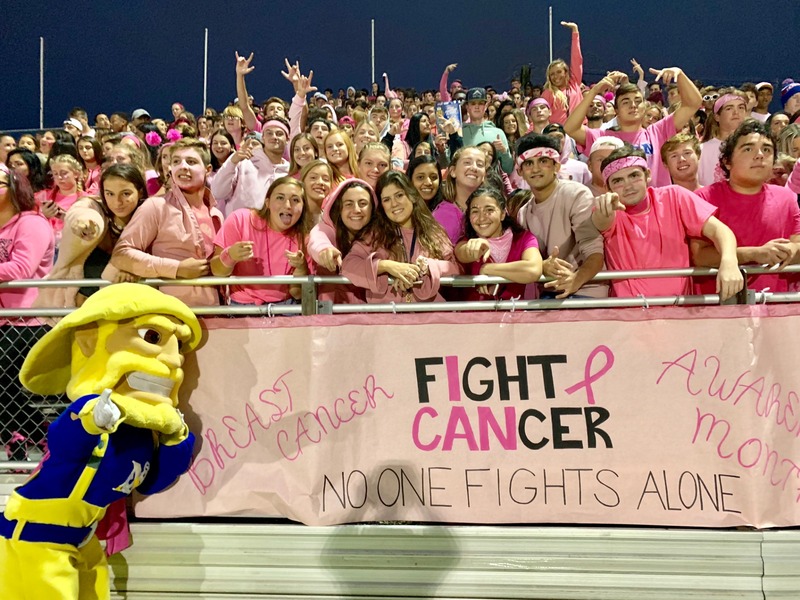 The Mariner Maniacs came out en mass during Friday's football game to show solidarity and help raise funds for October's "Breast Cancer Awareness Month,"
S.A.D.D. 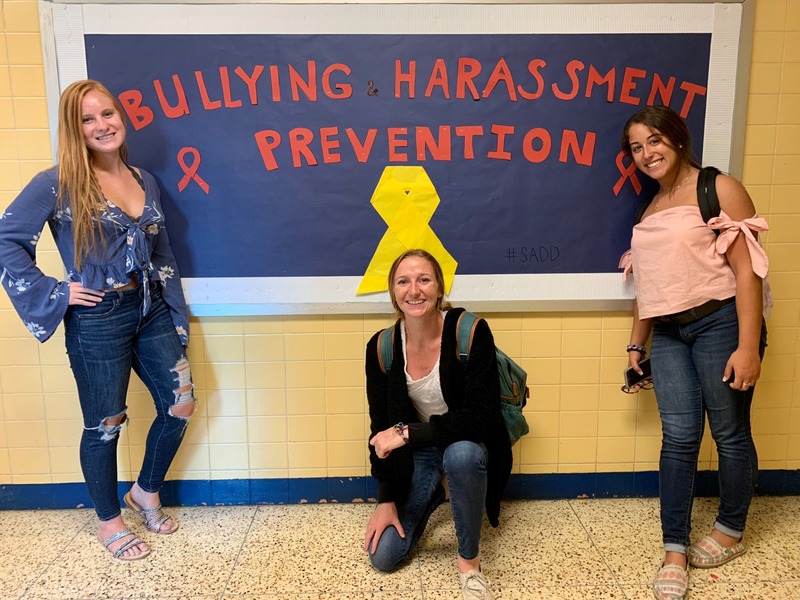 (Students Against Destructive Decisions) are busy raising awareness throughout the month of October in support of prevention programs geared towards eliminating, bully, harassment and intimidation in our community and especially at Toms RIver North...Go Mariners. Congratulations to our October Staff Member of the Month, Mr. Michael Pape. 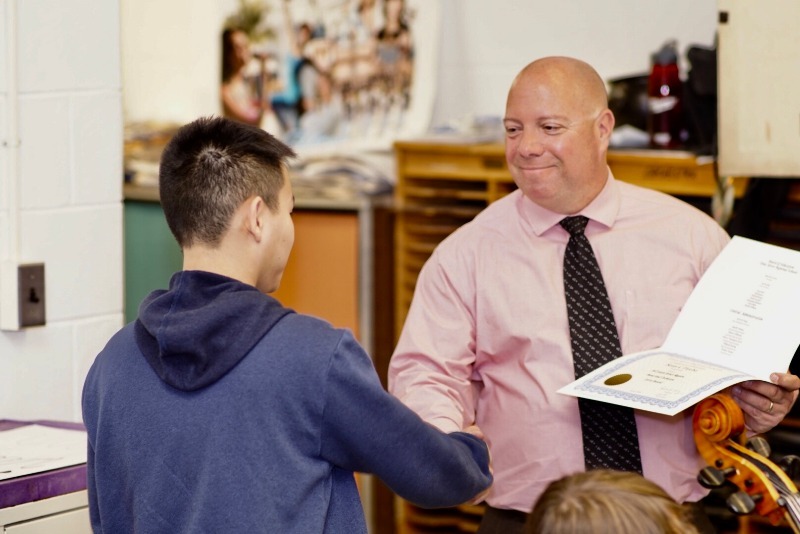 Mr. Pape has been teaching here at North for all four years of his professional career. He is a graduate of Toms River East and Monmouth University. 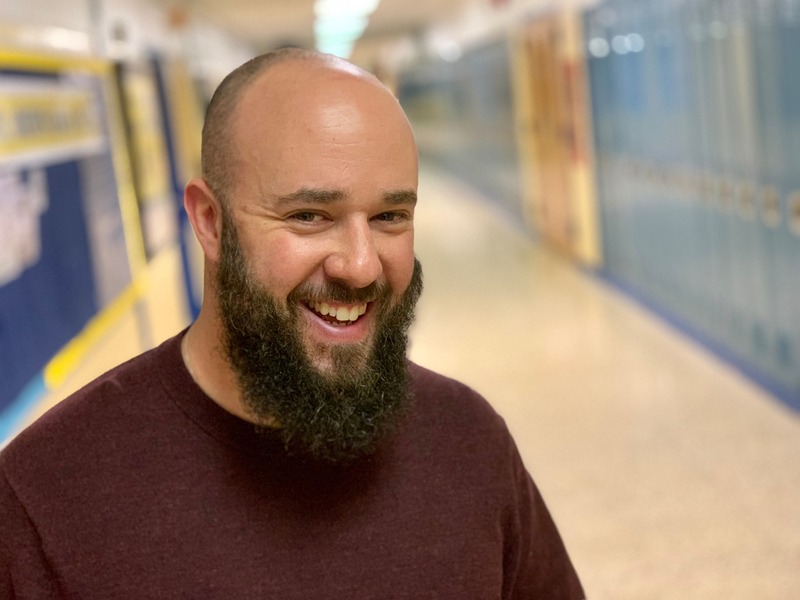 Currently teaching Sophomore English, Mr. Pape serves as the percussion tech for the Marching Mariners, the advisor to the Writing Center, and coached Boy’s Lacrosse last spring. His favorite things about our school are the support of our staff as well as the kindness and generosity of our student body. Art Academy principal, Mr. Madigan, demonstrates the skill of tile cutting. The tiny tile pieces will then be assembled to create a magnificent mural. 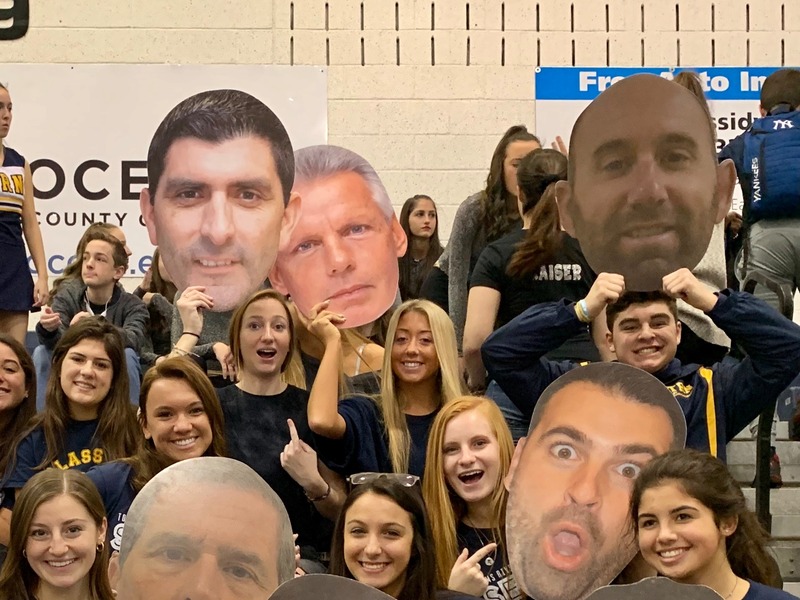 The Toms River North Captain's Crew were on hand last night and acted as hosts to the annual college fair that assembled over 100 colleges in the RWJ Arena. Students and parents were also invited to attend the college financial aid planning workshop. 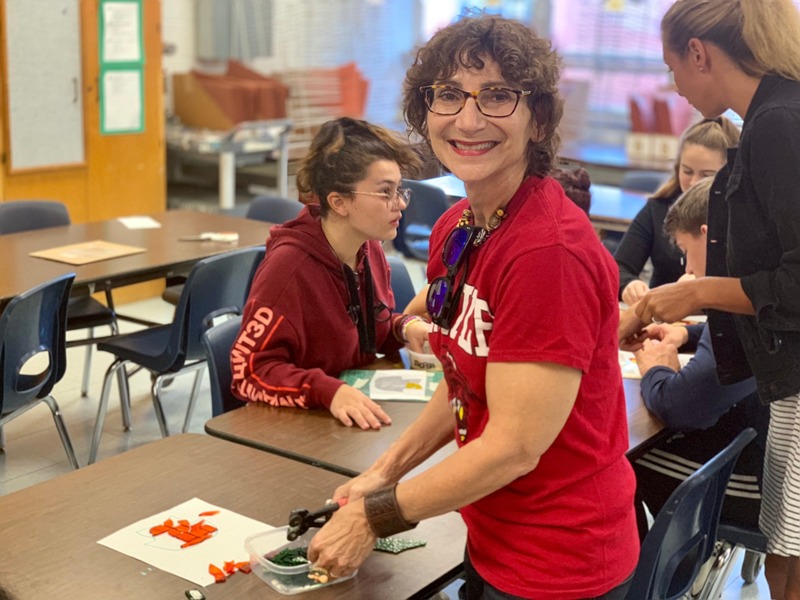 Ms. Yvonne Yarr, local artist who is famous for creating the stunning murals located in downtown Toms River, visited the Art Academy classes to collaborate with the Toms River "Art Heals" Community for Healing and Recovery project. Students learned the fundamentals of mural making. 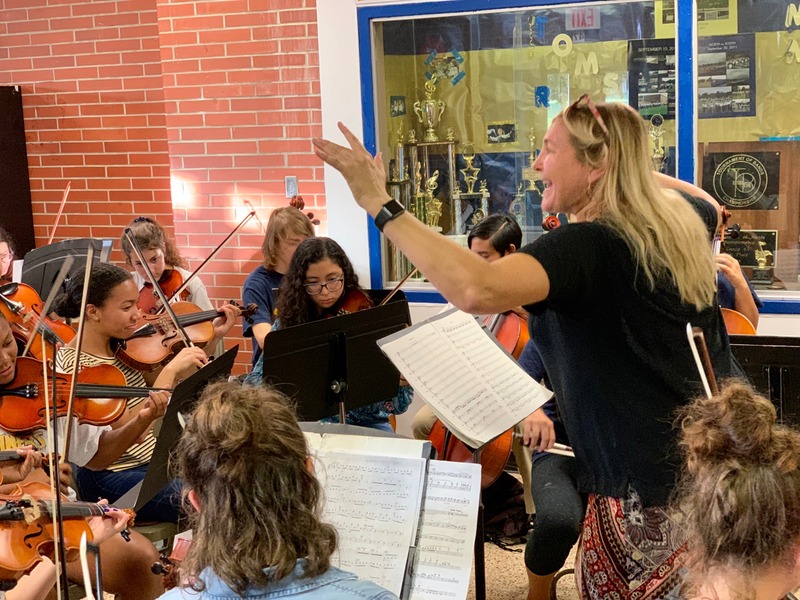 Ms. DeGoey conducts the Toms River North HS Orchestra welcoming incoming parents, friends and relatives to the annual "Back To School Night". 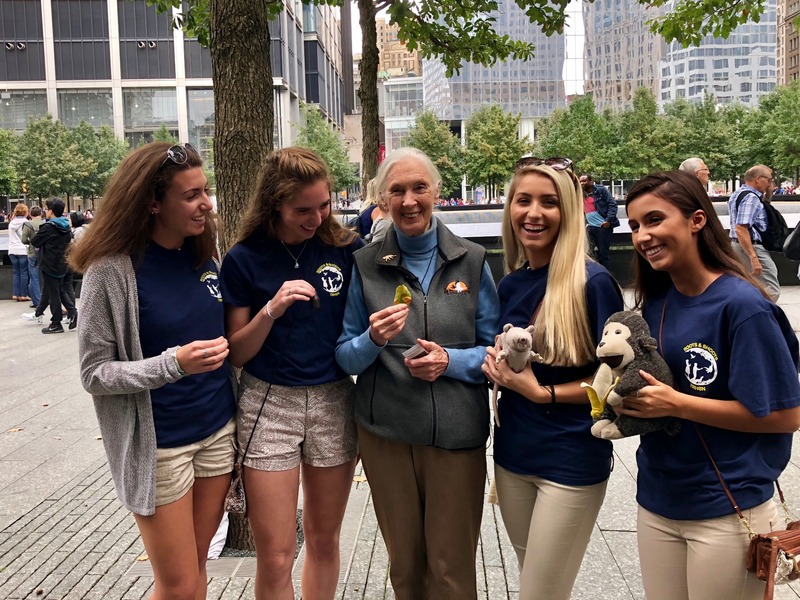 "On Friday, Sept 21st a select group of students from High School North's Roots&Shoots were invited to NYC to celebrate the International Day of Peace with Dr.Jane Goodall. Dr.Jane met with each student, shared her message of hope, and encouraged them to continue to make positive change happen. For more information about Dr.Jane Goodall's youth program Roots&Shoots, email Mr.Seiverd at kseiverd@trschools.com." 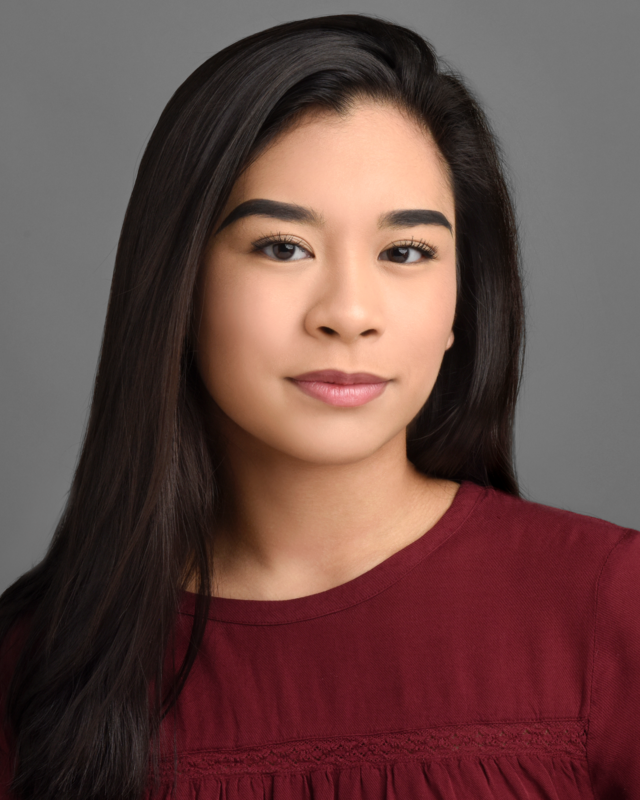 Congratulations to Yna Tresvalles on an incredible performance on Sunday, September 23 at 54 Below's Broadway Back to School event in New York City. She got to sing with a number of Broadway stars including Bonnie Milligan from Head Over Heels and and Caitlin Kinnunen from The Prom. 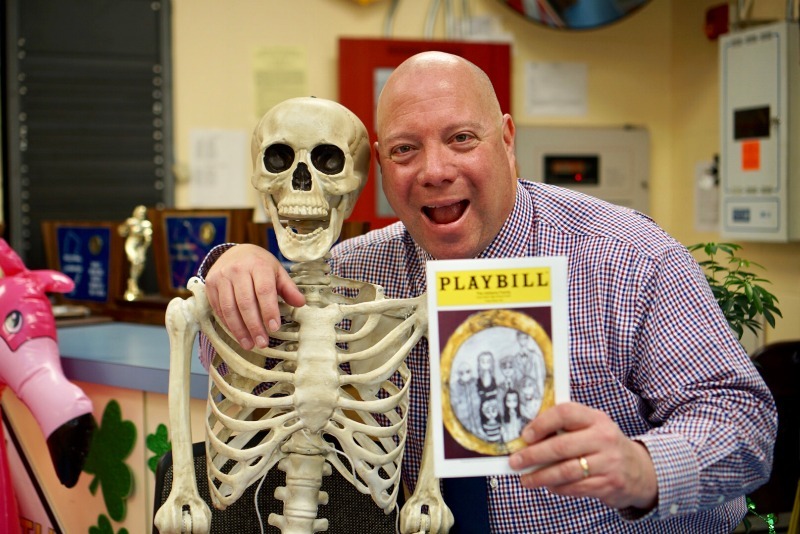 The show, co-produced and emceed by Hunter Bell (author of the Tony-nominated Title of Show), is a charity event that raises money for the Educational Theatre Foundation. 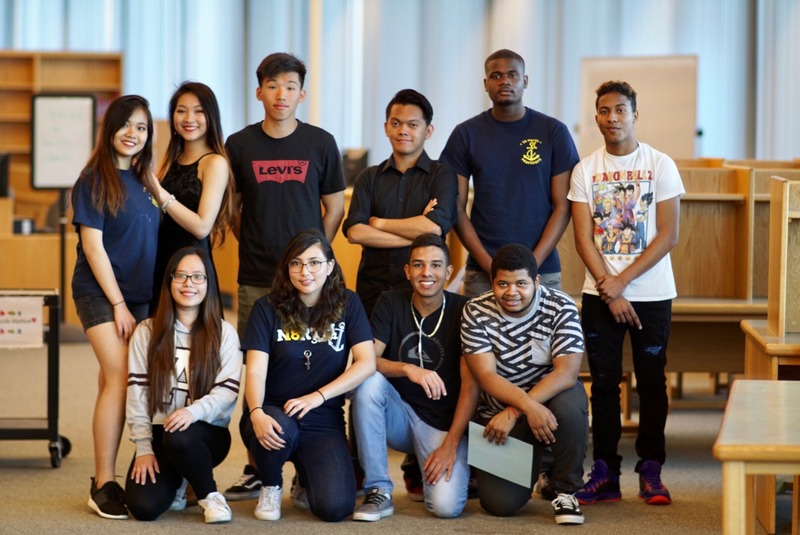 Yna was one of only 12 students selected to perform at this elite event. 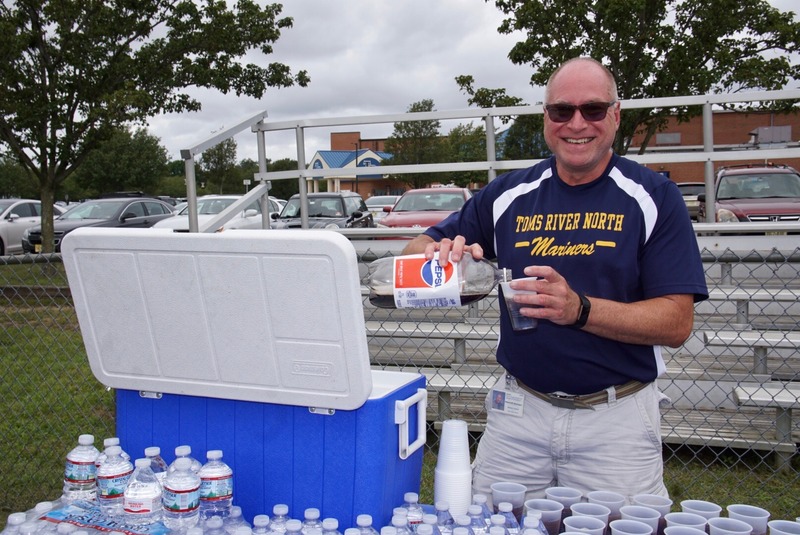 Mr. Baumgart was on hand at the Senior BBQ to ensure that the class of 2019 stayed hydrated! 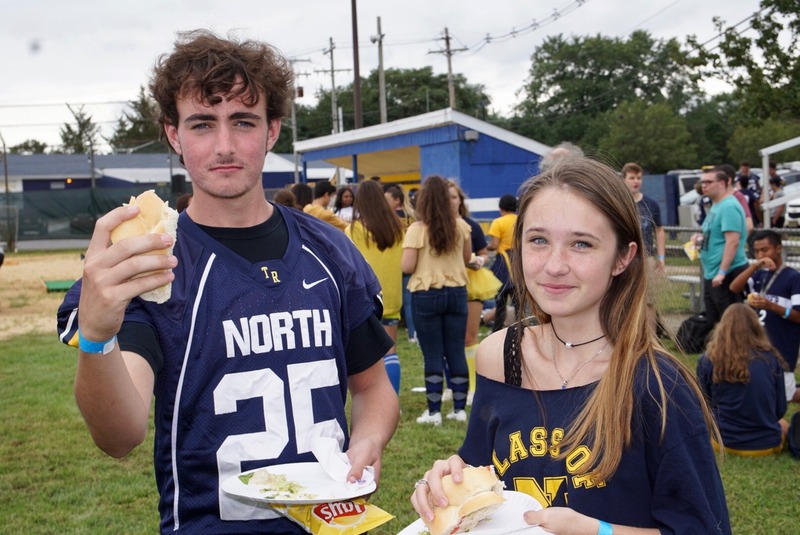 The annual Senior BBQ was held after school on Friday and the food was delicious! Friday's pep rally helped motivate the undefeated TRN football team to their third consecutive win beating Central 42-6. Sophomore quarterback Jake Kazanowsky threw five touchdown passes in the first half! The Girls Cross Country brought their enthusiasm to the Fall pep rally. Good luck to all the Fall sports teams! Go Mariners! T.E.A.M. (Together Everyone Achieves More) will be traveling to the elementary schools this week to educate 4th and 5th grade students about the dangers of drugs and alcohol, as well as refusal skills, how to deal with bullying and the importance of having a good character. 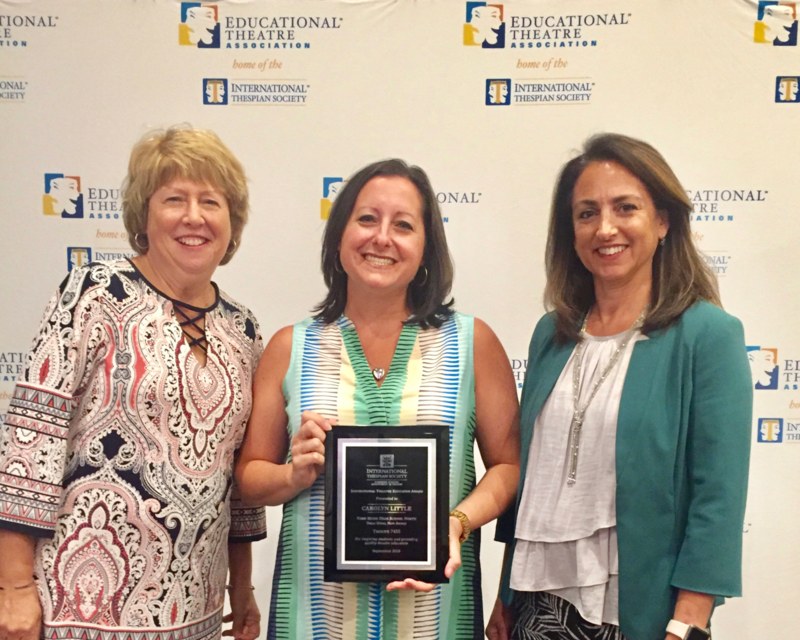 Carolyn Little received the Educational Theatre Association’s Inspirational Theatre Educator Award at their National Conference this past weekend in Denver, Colorado. 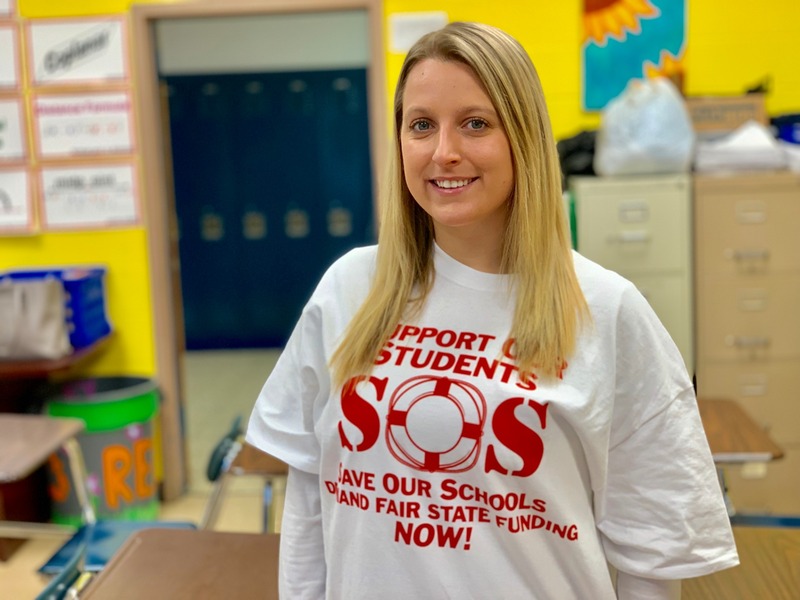 Little is an English teacher at Toms River High School North. 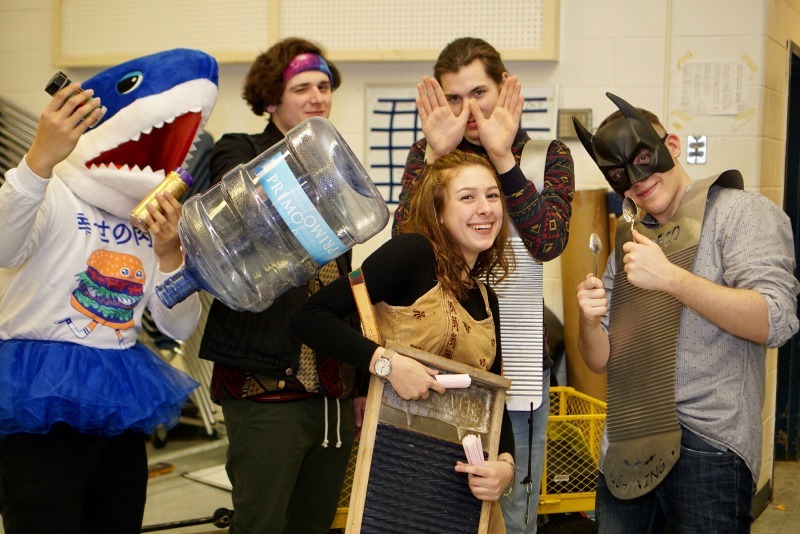 She has been directing their after-school theatre program for 16 years. She was nominated by her former student Luke Sulsenti, Class of 2018. In the photo she is joined by EdTA President Debbie Corbin and EdTA Executive Director Julie Cohen Theobald. 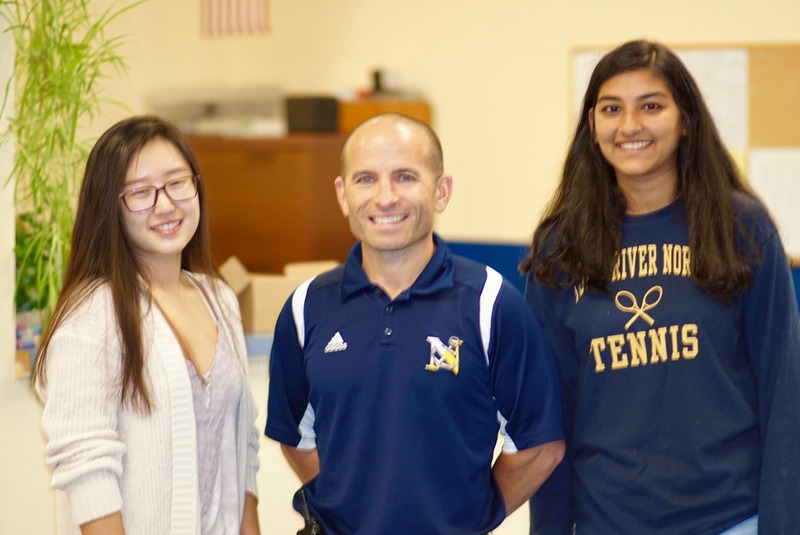 Congratulations to our Students of the Month Riya Shah and McKayla Yoo! I hope that all of you have had smooth and enjoyable first days of school. Last Wednesday, we opened our doors to 2068 students. Mr. Keller addresses the student body during a 911 memorial. 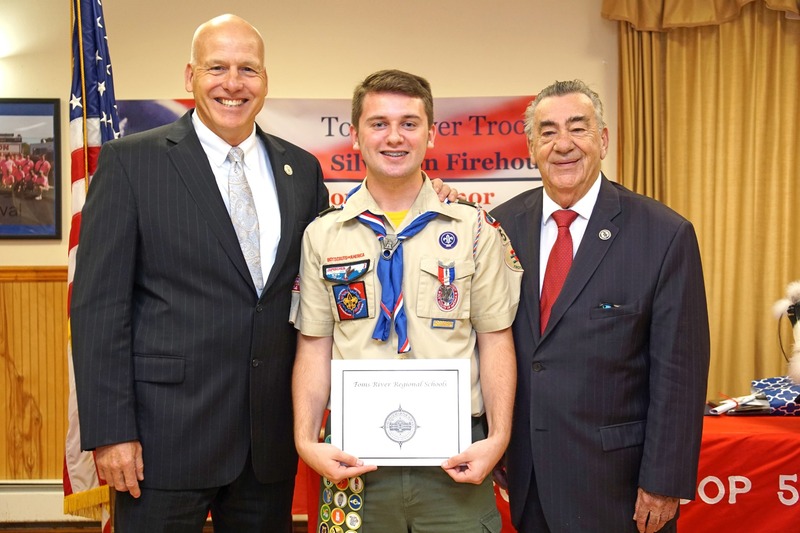 Toms River North senior, Zach Dougherty earned his Eagle Scout award last Sunday, He was honored by many dignitaries at the induction, including our Board of Education president, Mr. Russell Corby. Congratulations Zach on such an outstanding achievement! 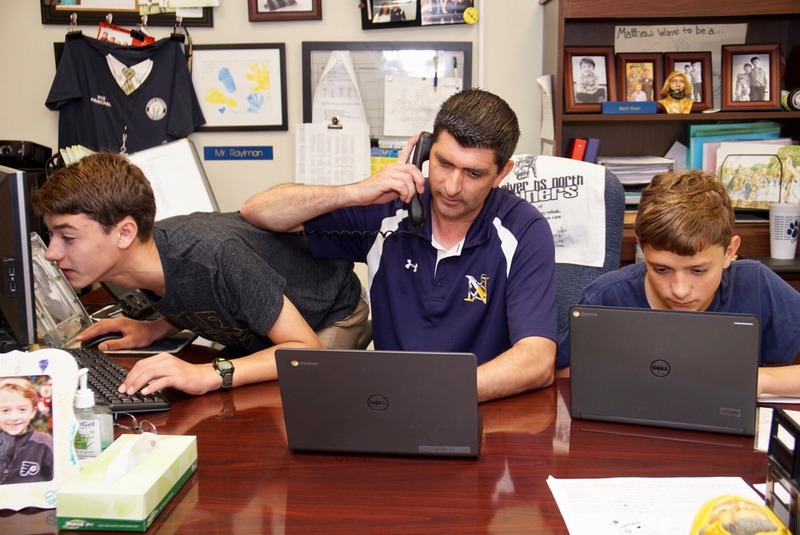 Assistant Principal Mr. Madigan will be at the Toms River North graduation this afternoon to send off his senior class and then race over to High School South to see his son, Christopher Madigan graduate with his own class of 2018. Congratulations to all Toms River Schools graduates, and a well deserved summer break for everyone. Have a safe and fun filled summer! 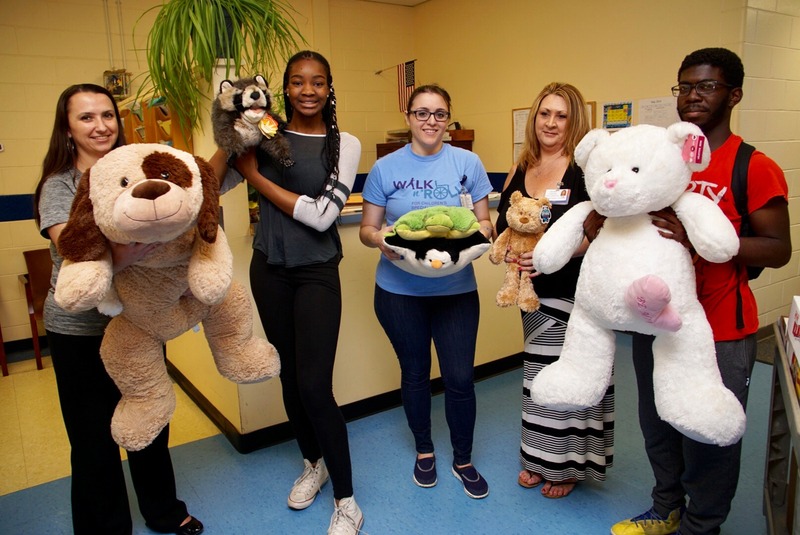 The Bible Study Club at Toms River High School North held a Stuffed Animal Drive to benefit Children's Specialized Hospital (CSH). 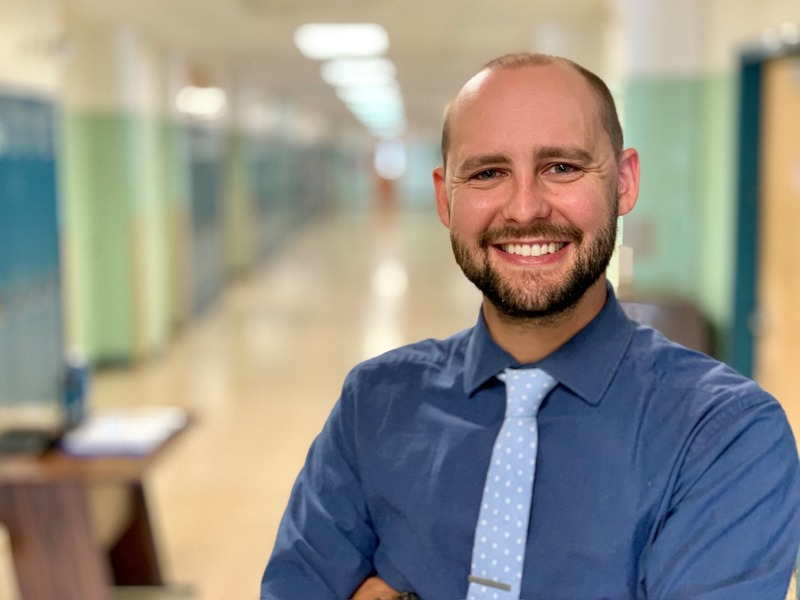 With only two days remaining in the school year, Assistant Principal Mr. Raylman brought in reinforcements to help with end of the year duties. 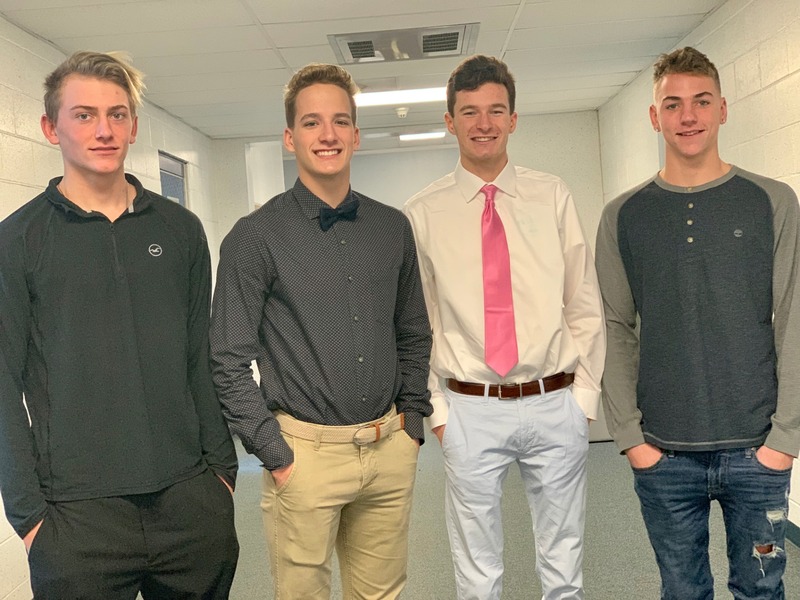 Nicholas and Matthew Raylman have already finished their requirements earning high academic achievement honors, along with successful cross country, track and hockey seasons. Well done lads! Today Juneteenth commemorates African American freedom and emphasizes education and achievement. Congratulations to the Class of 2018! You are an amazing class and we hope that you leave with many meaningful Mariner memories. Dear Parents, Guardians, I hope you all had a great weekend! See Important Information Below. Nautical Stars to the Rescue! 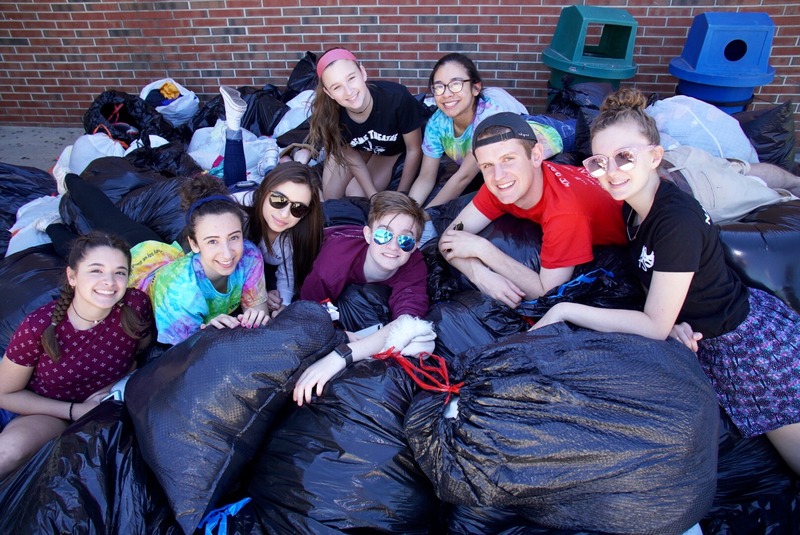 The TRN Nautical Stars Theater Troupe sponsored a clothing drive over the weekend and collected hundreds and hundreds of pounds of donations. The Toms River North PAWS club held their annual end of the year event this week. 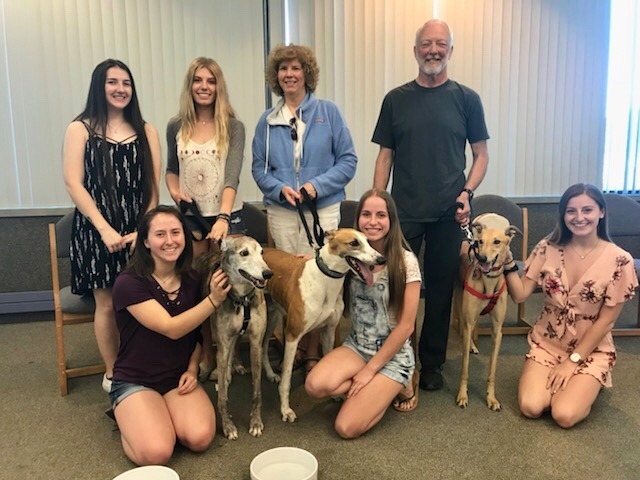 The club hosted several Greyhound rescue dogs from "Make Peace With Animals' who then accepted a $300.00 donation from the club's fundraising efforts. This collaboration will help to find peaceful solutions to the many problems facing animals in today's society. 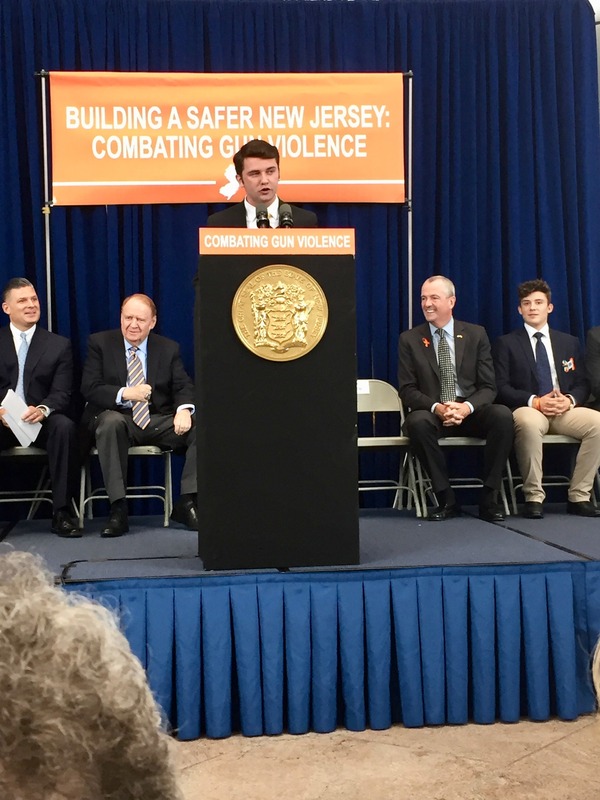 Congratulations to TRN junior Zachary Dougherty who had the honor of introducing Governor Phil Murphy for the ceremonial signing of new gun law prevention legislation at the Richard J. Hughes Justice Complex in Trenton. John Green and Joe Klock are sending you a personal invitation to participate in the "Kicks For Dreams" kickball tournament after school today on the TRN softball field. All proceeds will be donated to the Field of Dreams. Hurry limited space, $5 to play and $2 to watch. Each year, the West Point Society of NJ recognizes our nation's outstanding high school juniors who have demonstrated exceptional performance in academics, athletics, community service, leadership, and moral character, and who promote the values of national service as exemplified by Dwight D. Eisenhower. 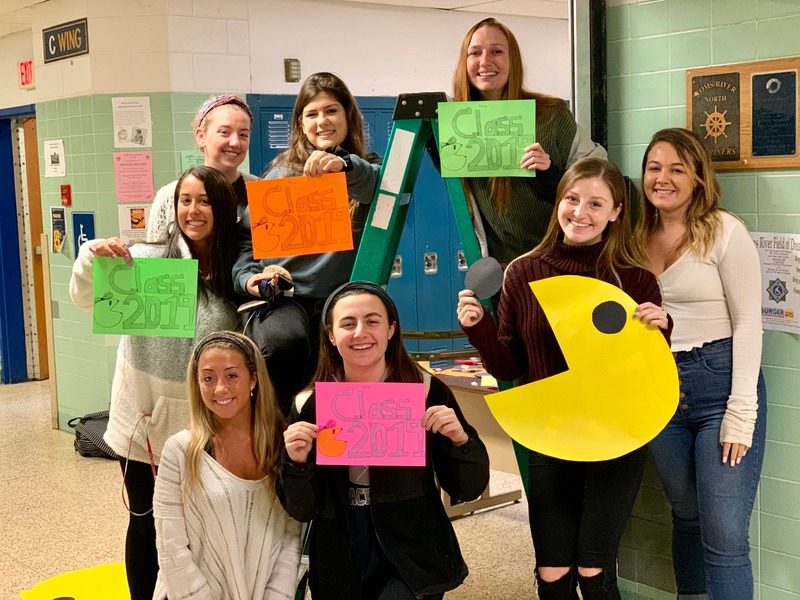 Students from TRN "Students Against Destructive Decisions" participated in a "Trivia Night" sponsored by Toms River Family Heath & Support Coalition. Our "Dream Team" walked away with a first place trophy, free playa bowls and gift cards. 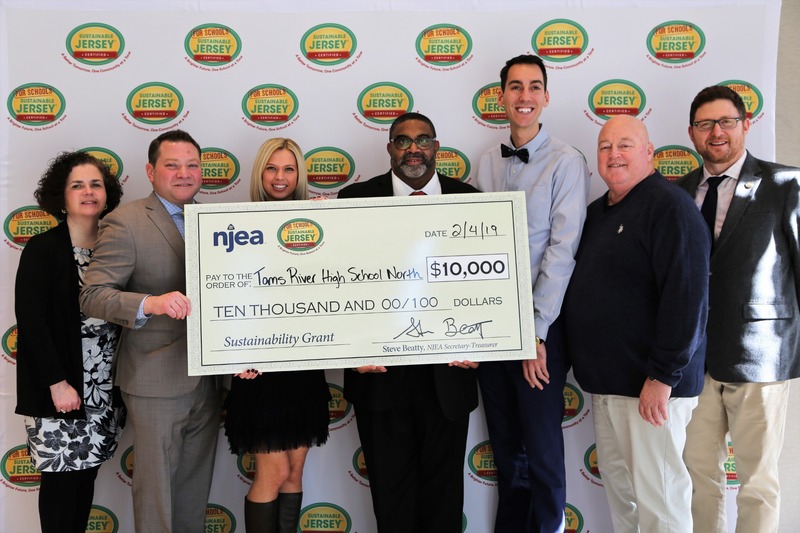 TRFHSC is made up over 50 partners spanning the public, private and non profit sectors who are working to improve the health of all Toms River residents. Congratulations to the Boys Track team for winning first place in the 4X400 relay at the Meet of Champions. It was a tremendous effort by Connor Sauers, Abdolahe Diawara, Zach Hankins and Jordan Grey. Go Mariners! 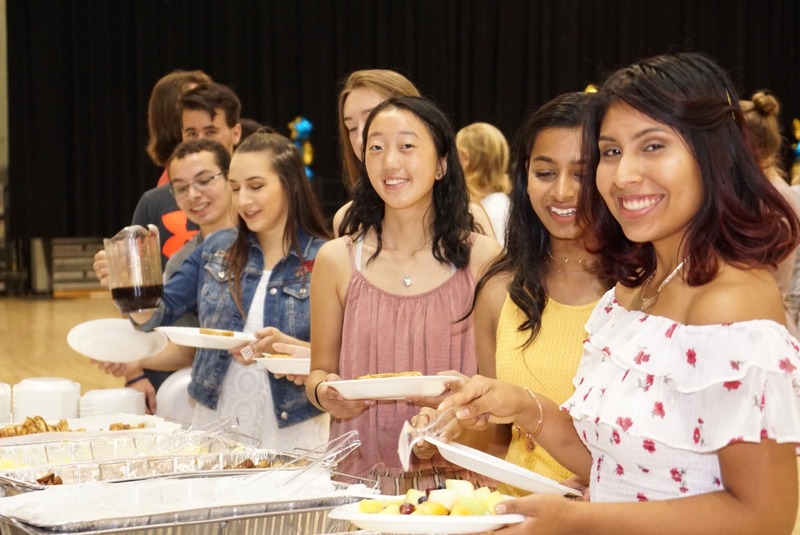 The annual Senior Breakfast was held this morning and our class of 2018 were treated to a buffet of delicious food. 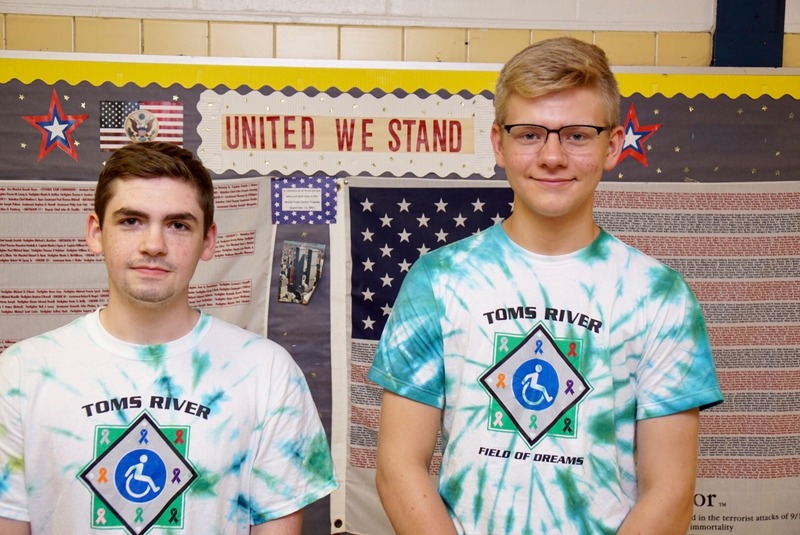 The Toms River North Boys track members participated in the Torch run to support Special Olympics. 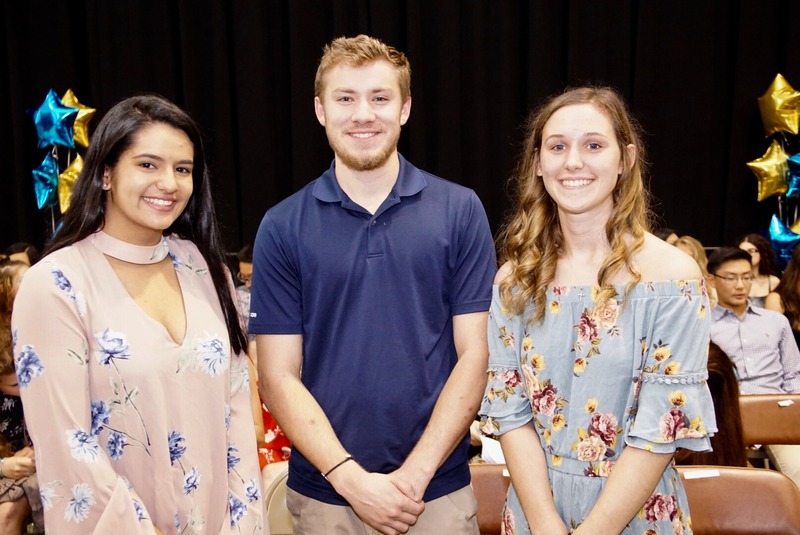 Last night, over $200,000 was awarded at the 2018 Senior Scholarship Awards Ceremony held in the RWJ Barnabas Heath Arena. 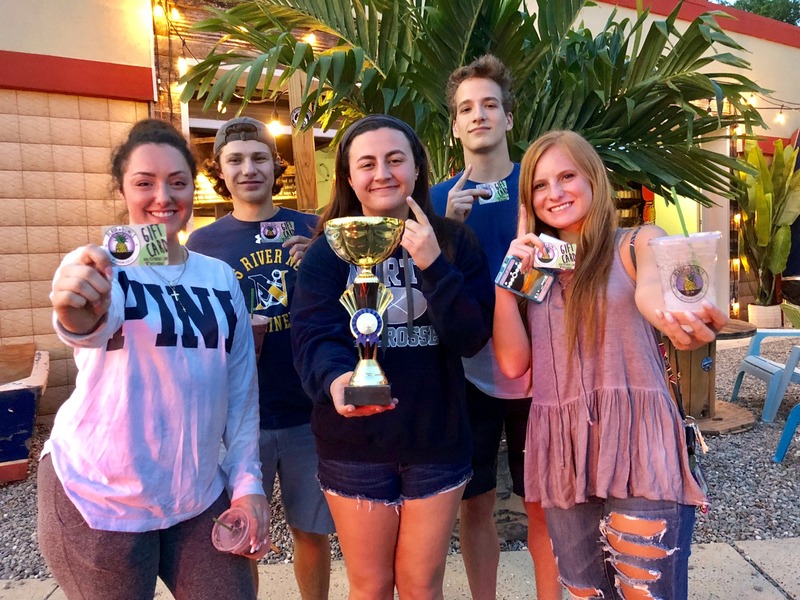 Students Against Destructive Decisions will be competing against HS South, East and Donovan Catholic for the coveted trophy at a fun night this Saturday at Playa Bowl. Come out and support the SADD Dream Team and meet new friends, new members are welcome! The event runs 7:00 pm to 9:pm at the Playa Bowl on Route 37 West. across the street from K-Mart and adjacent to the Kentucky Fried Chicken) It shall be a grand evening! Today we held the 41st Academic Awards in the RWJ Arena where scores of students received academic letters and academic pins. A bagel breakfast was provided for all! 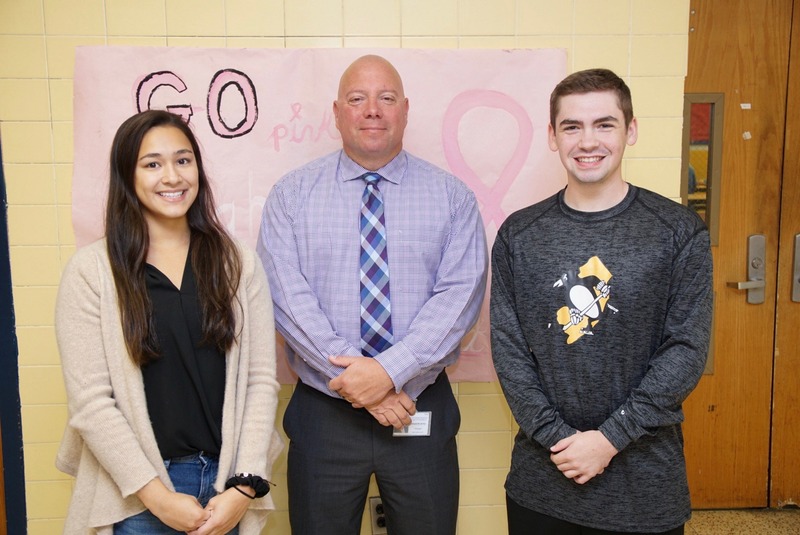 Pictured with Principal Keller and Chemistry teacher Merrell Newman is senior Riyah Shah. Riyah received an Academic Science Award and will be enrolled in the prestigious Governor's School of Science over the summer. Well done Mariners! 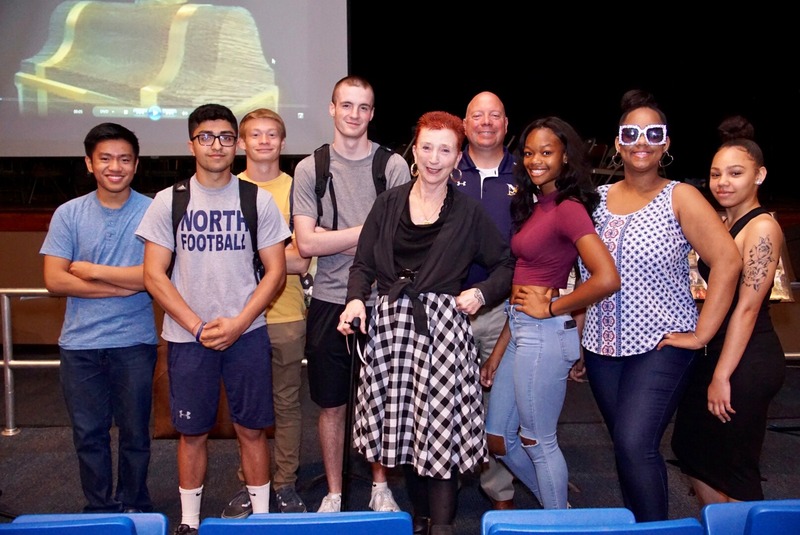 Ms. General's Political and Legal Education classes would like to extend a special thank you to NJ Superior Court Judge, Marlene Lynch Ford for presiding over their annual event of holding a mock trial at the NJ State Courthouse, Trenton, New Jersey. Congratulations to our June Students of the month, Leena Domadia and Devon Shapiro! 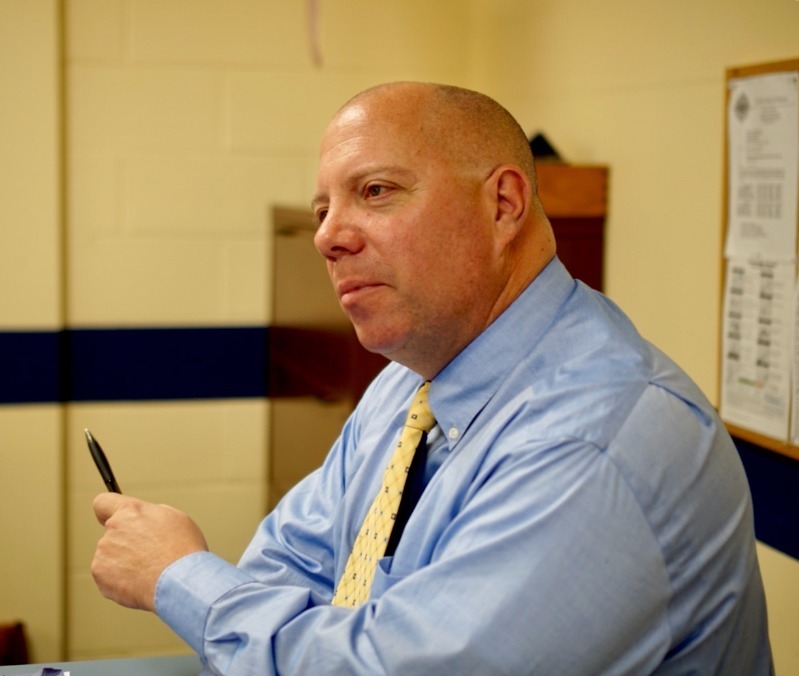 On June 4 and 5, Toms River High School North will be hosting Mr. Frank Romeo of "The Art of War". Mr. Romeo is a Vietnam Veteran who was part of a small Special Forces group that was ambushed in August of 1969. 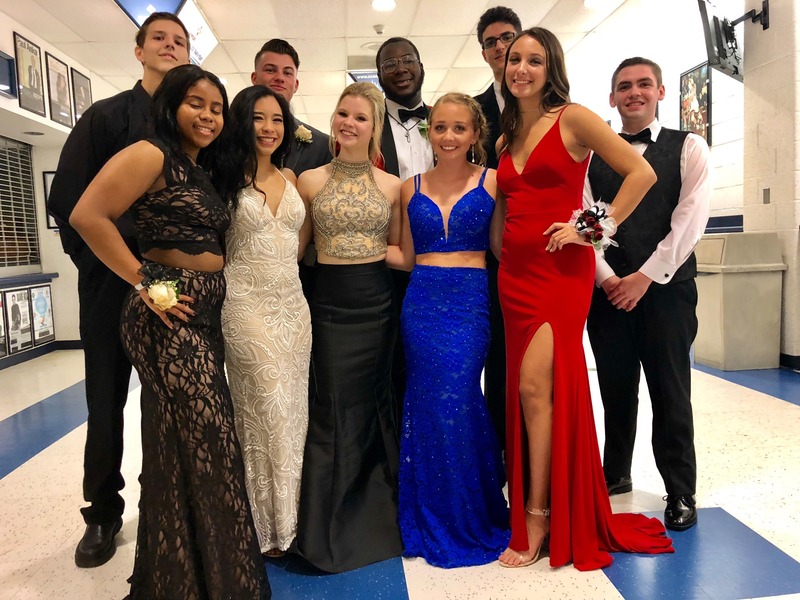 The Junior prom was a smashing success as Mariners showed up looking their very best! 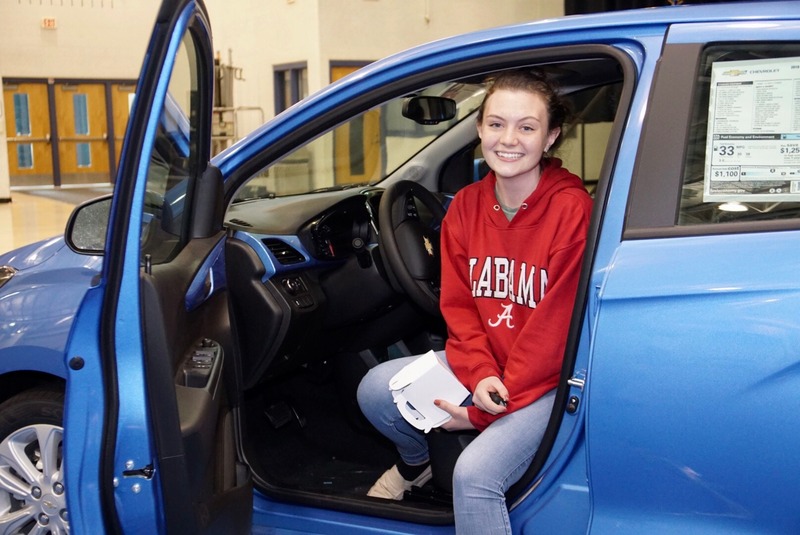 Congratulations to Junior Jessica Ruppert for drawing the lucky key fob that unlocked the door to a brand new Chevrolet Spark, the grand prize for the Driven To Excellence program sponsored by Pine Belt Chevrolet. Many happy driving miles to Jessica! 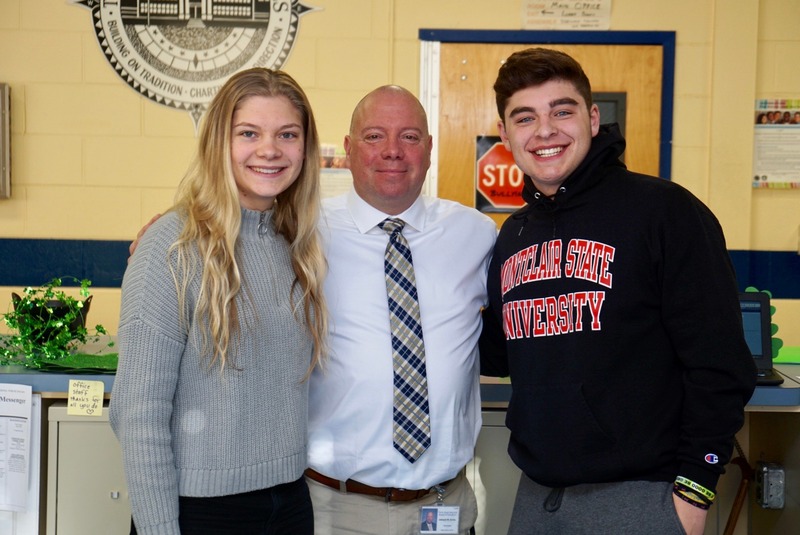 Ms. Kelly Toner, a State of NJ Public Defender and Assistant Municipal Prosecutor, Mr. Robert Greitz are making presentations throughout the District's High Schools emphasizing the legal aspects of turning 18 and becoming adults under the law. 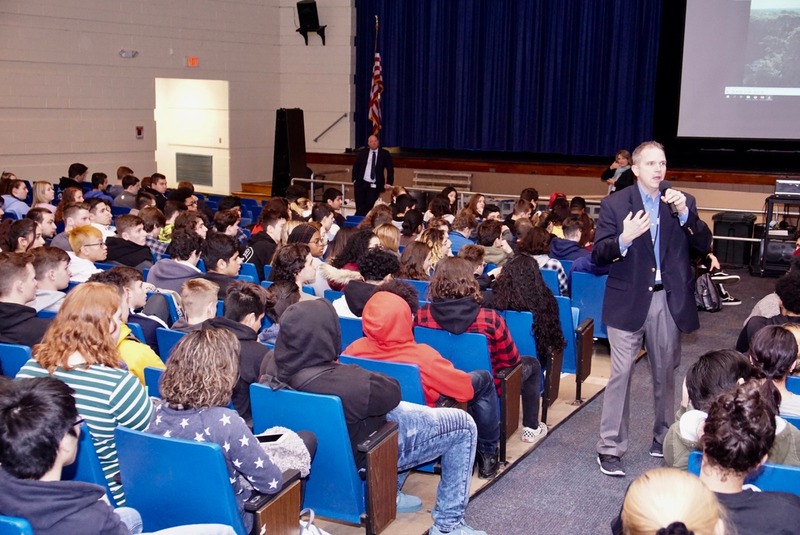 Students learned "What you need to know" about your legal rights concerning important topics such as: employment, motor vehicles, driving under the influence and internet safety. 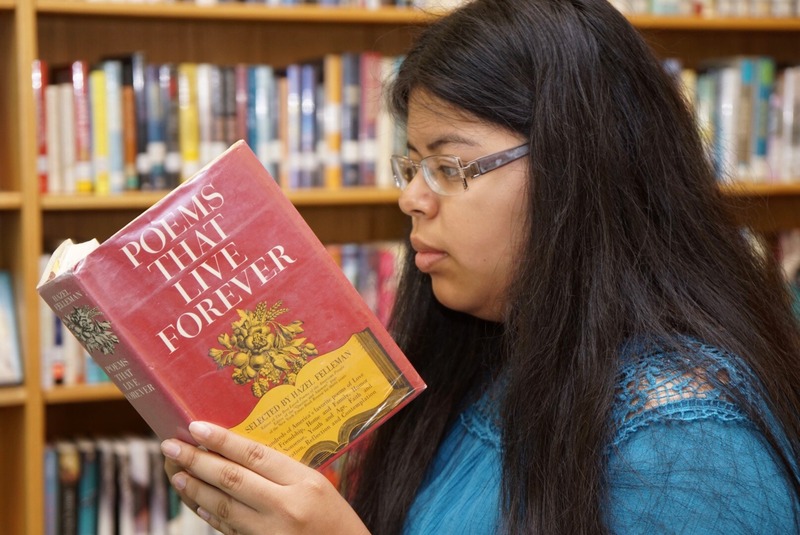 Mr. Reynold's Advanced Placement English class held their annual Literary Festival in the media center. 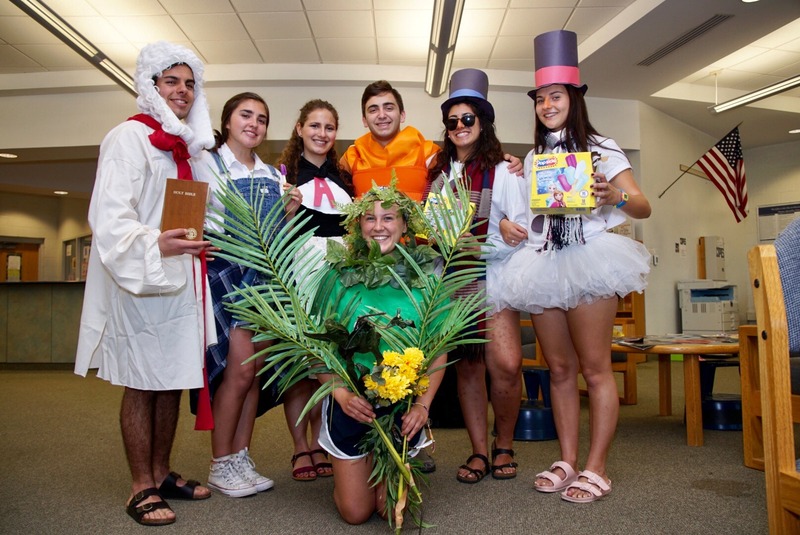 Students donned costumes and attire to emulate the characters from the novels and poems they studied throughout the year. Congratulations to Gianna Daniele for receiving Congressional Recognition and earning 3rd place in the 2018 Congressional Art Competition. Surprisingly, the piece titled "Walk a Mile in Mine", is Gianna's first attempt using the medium of charcoal. Art teacher Ms. Houlihan remarked that this a 'bold piece, using a full range of tonality." It is currently on display in Congressman Tom MacArthur's office located on Washington Street, downtown Toms River. 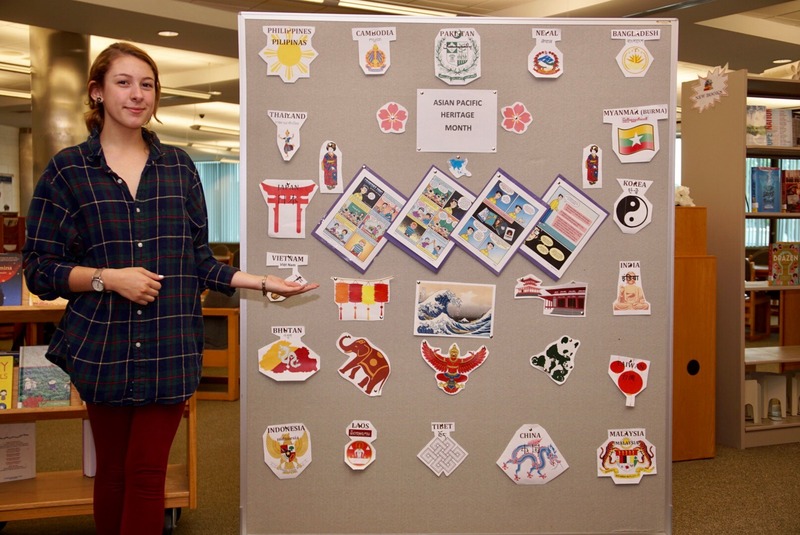 Belle Burns created and designed a display located in the media center celebrating "Asian Pacific Heritage" month. As we express our gratitude we must never forget that the highest appreciation is not to utter words, but to live by them. May your Memorial Day be reflective of those who have made it possible. Today, members from the American Academy for Dramatics Arts visited our Theatre Arts classes and our Thespian Troupe #7455. The students participated in a workshop with Susan Pilar, a master acting instructor at the conservatory. 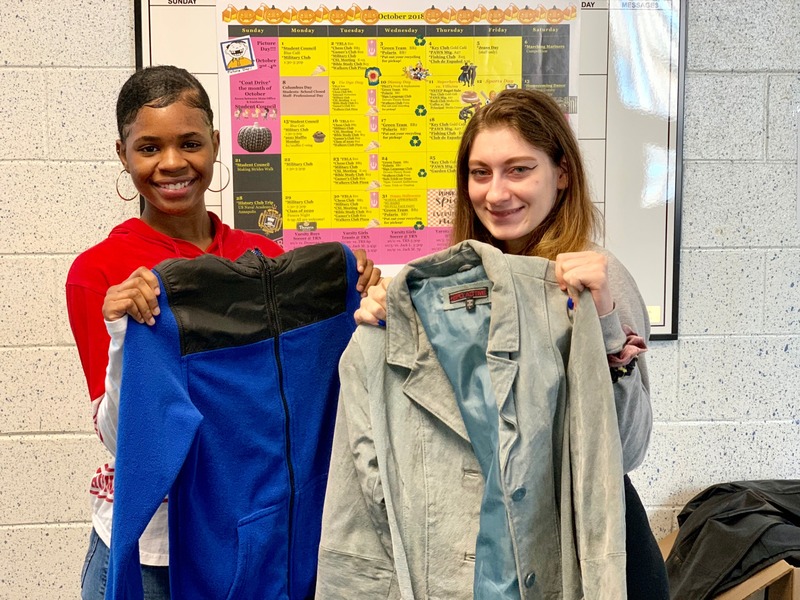 Mrs. Mcbride's Interior and Fashion Design Technology class invited guest speaker Tenaya Hurst to work with the students and teachers to help learn about integrating fashion with technology. Ms. Hurst's presentation was made possible through the Toms River School District's Tech Ready: Office of Naval Research Grant. The Mariner Freshman baseball team is having an outstanding season, playing longer into the year than most schools. Pictured before practice, it is all business as they prepare for the upcoming Monmouth and Ocean County Tournament. The future of TRN baseball is in good hands. 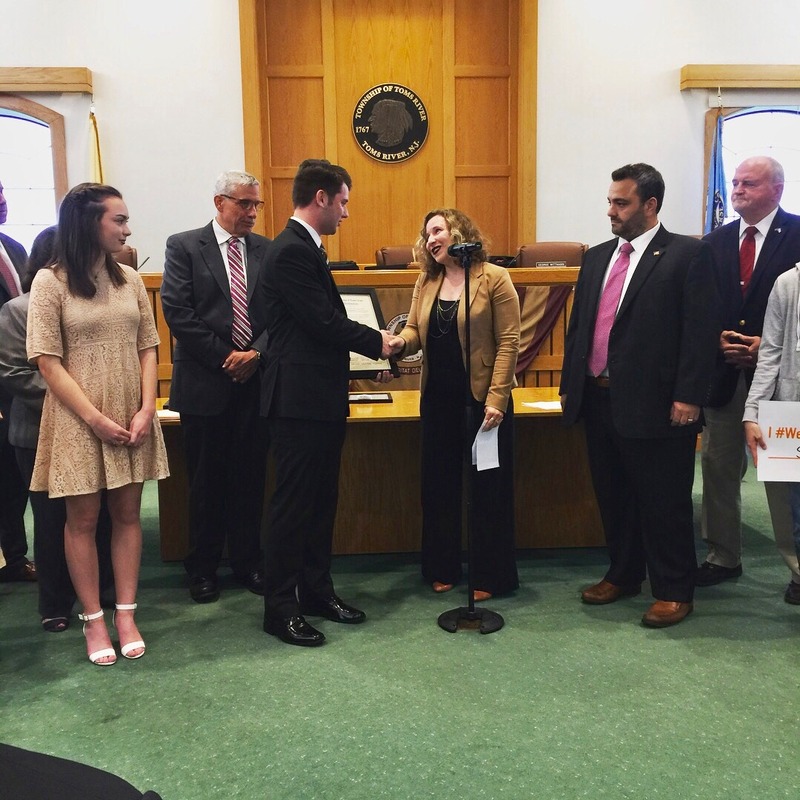 Zach Dougherty received the Township's proclamation declaring June 1st as "Gun Violence Awareness Day: Zachary has been very active with finding solutions to prevent violence in our schools by organizing student led marches along with news articles in major publications. e.g. The New York TImes. Presenting the proclamation is Toms River Councilwoman, Laurie Huryk. May is Deaf Awareness month and the perfect opportunity to lean to sign. You can find helpful hints and more information when you stop by our media center. 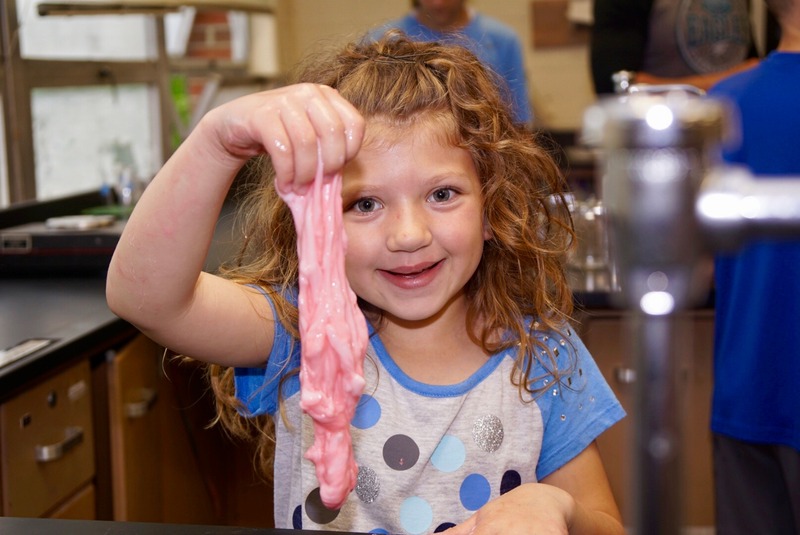 Kate Snowden demonstrates that when you mix borax + H2O and glue it produces a polymer based,non Newtonian fluid through hydrogen bonding, otherwise known as SLIME! 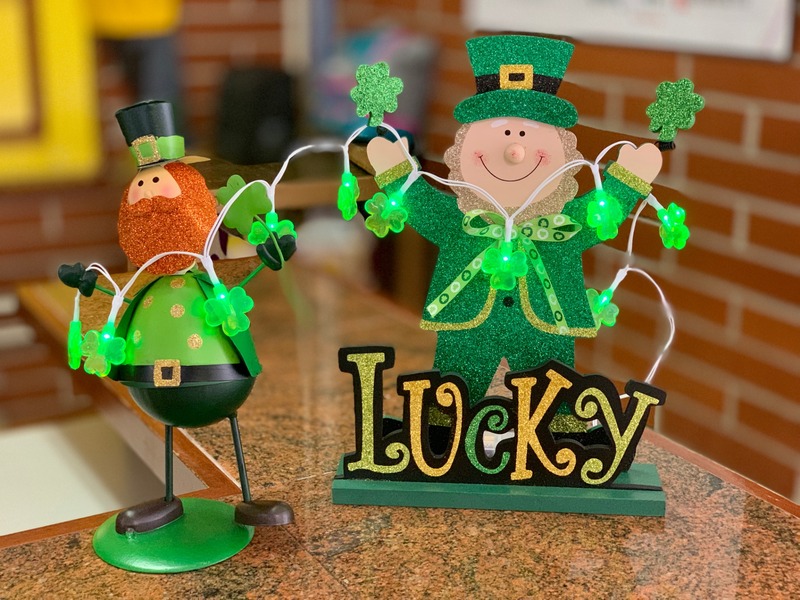 This and other fun through chemistry projects were provided by Mrs. Riccardi's chemistry class for all the young children during this year's "Bring Your Child To School Day." 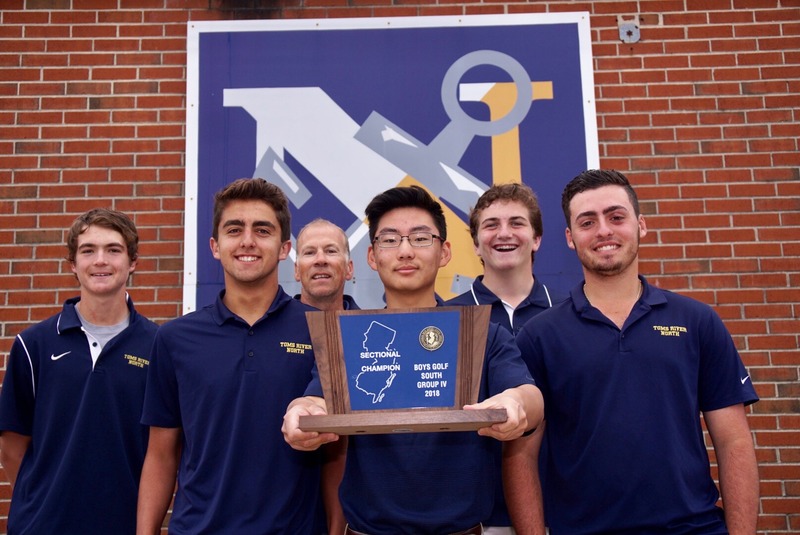 Congratulations to the Boys Golf Team for winning the 2018 New Jersey State Sectional Title! 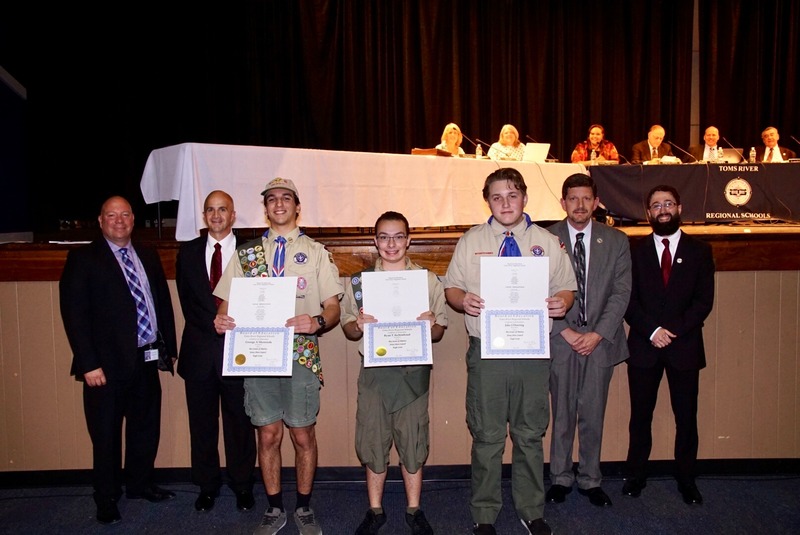 The Board of Education recognized three Mariners at last night's Board of Education meeting for receiving the prestigious Eagle Scout award. George Shendouda, Ryan Archimbaud and Jake Doering hold their awards with proudly looking on Principal Keller and Board Members. 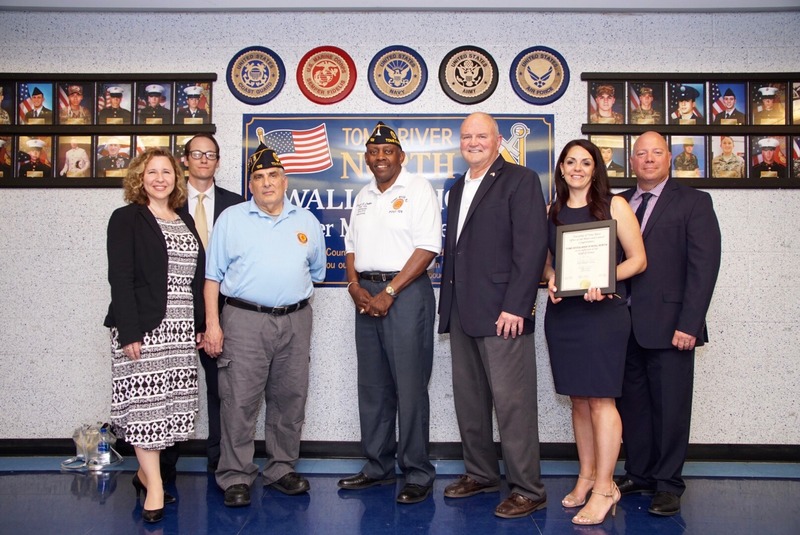 Toms River North unveiled the Military Wall of Honor located near the Media Center. Mr. Keller introduced the distinguished guests of Toms River Council, Central Administrators and family members of TRN alumni who served our country. A special thanks to Mrs. Daniel Stolz and Mr. David Bender for organizing the event. 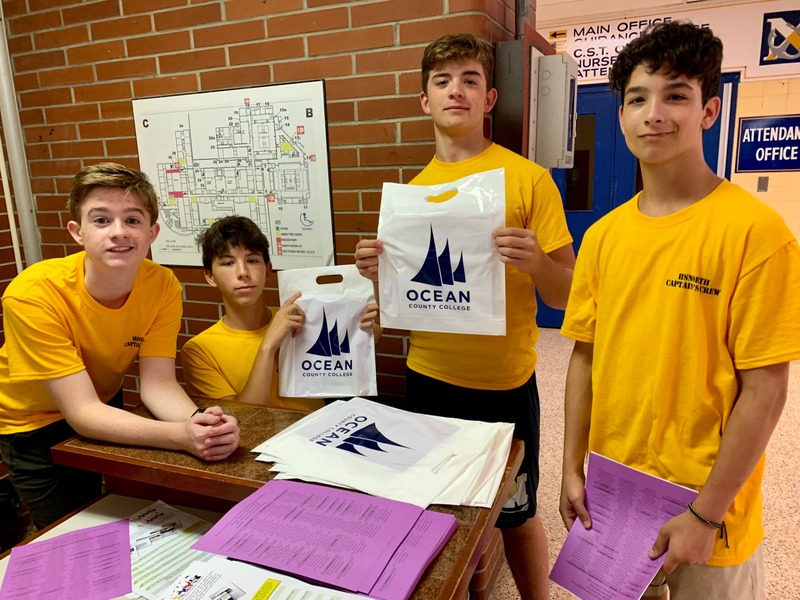 It was all hands on deck last night as the Mariners welcomed the incoming class of 2022 during last night's "Transitions" program. 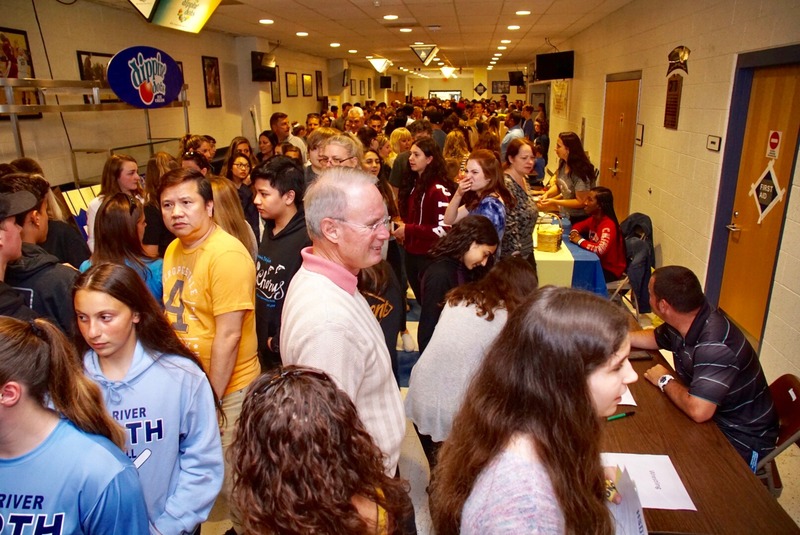 It was a big turnout and all the club advisors, coaches and students were on hand to encourage the new freshman class to become involved with the many wonderful activities Toms River North High School has to offer to our students. Ms. Ellen Lurig spoke to the senior students about the importance of making sober decisions while operating a motor vehicle. Congratulations to Ms. Jennifer Huey, our May Staff Member of the Month. 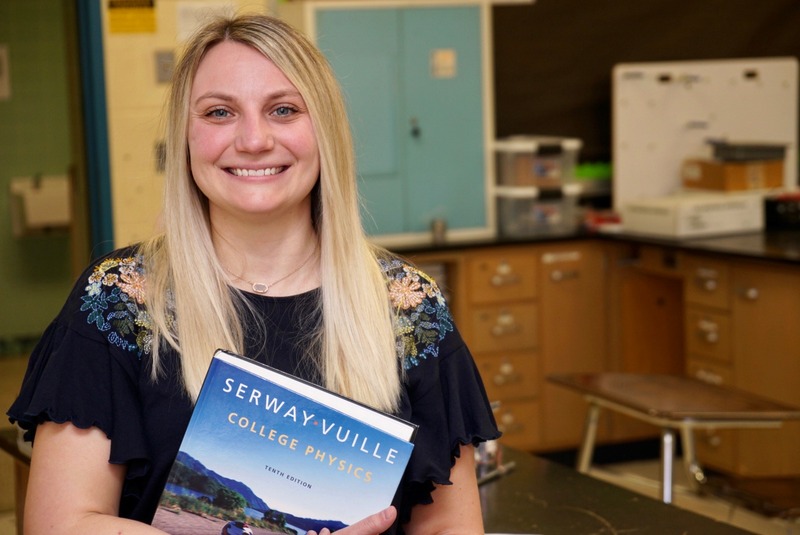 Ms. Huey has been teaching Earth Science at High School North for three years. 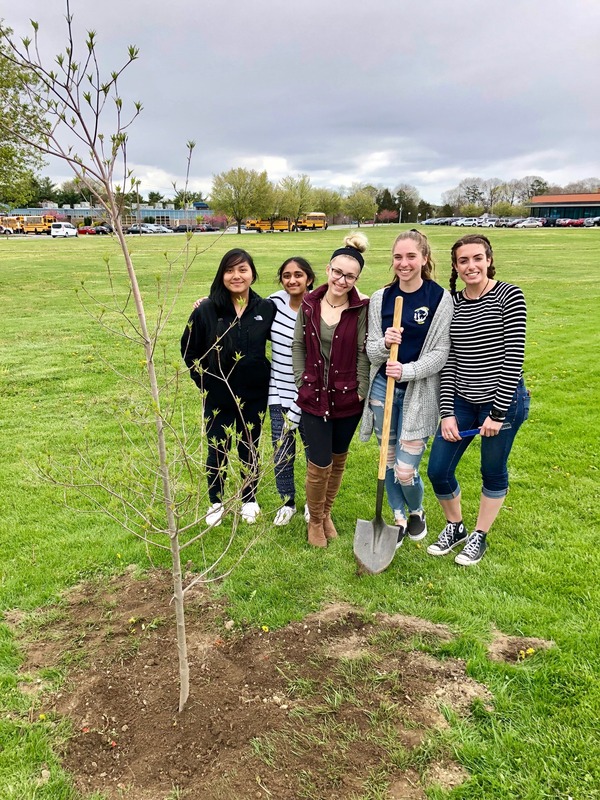 Members from the "Roots and Shoots" environmental program at TRN, planted several trees during an Arbor Day celebration last week. In the past three years, over ten trees have been planted, replacing many of the trees that were lost during Superstorm Sandy. 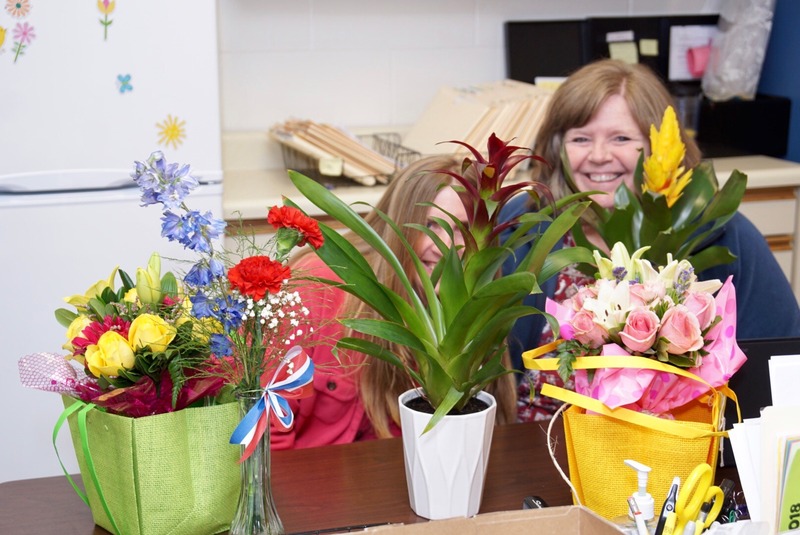 To celebrate and recognize the tremendous job they do each and every day, TRN nurses, Ms. Rizzo and Ms. Sincavage were showered with floral arrangements and delicious pastries on School Nurse's Day. Plants and People: Happy Together! Ms. Kat Schaffer, a TRN School Social Worker, is also a Master Gardener! 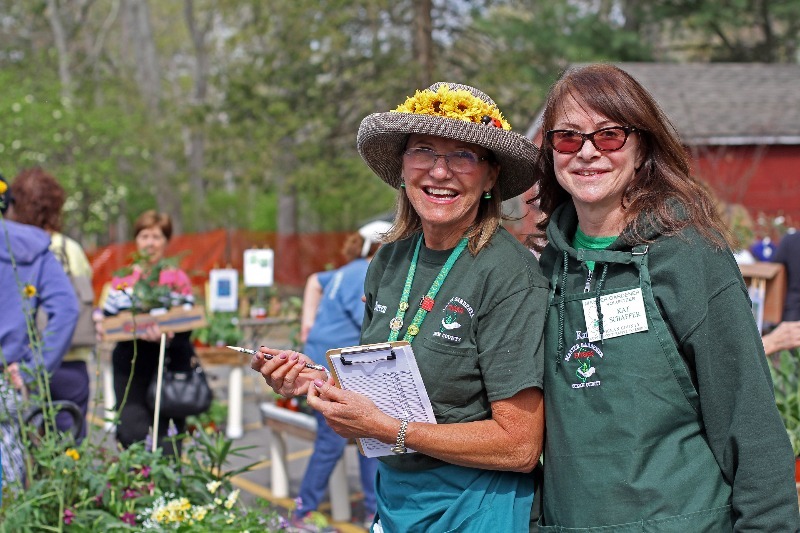 Last Saturday, the Ocean County Master Gardeners held their annual plant sale: "Plants & People: Happy Together!" 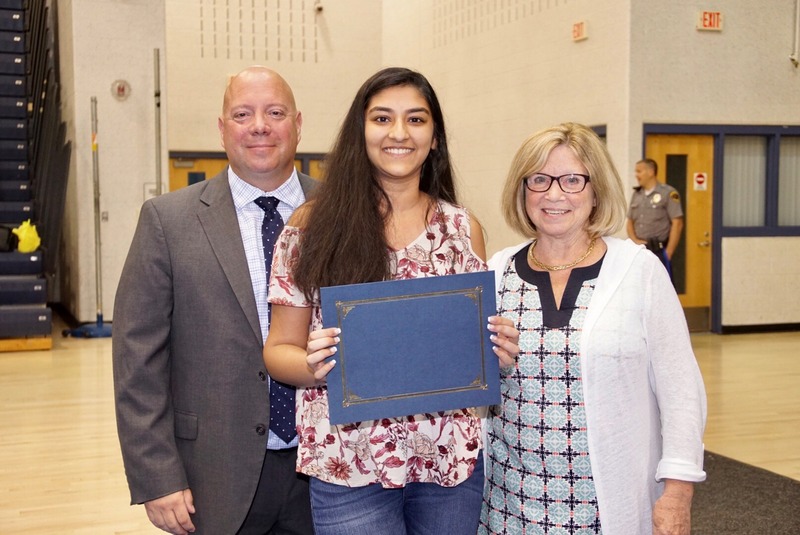 The evening of Wednesday May 2, Ocean County Prosecutor's Office hosted a Student Recognition Awards event at Frog Pond Elementary School in Little Egg Harbor Township. 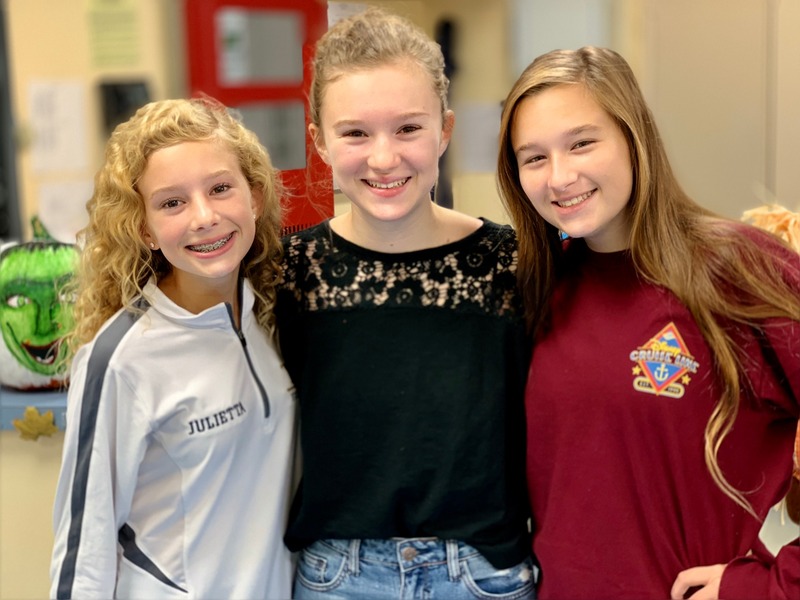 The TRHSN Spanish Club met on "el tres de mayo" (5/3) to celebrate the Mexican/American celebration of "Cinco de Mayo" (5/5) in the Gold Cafeteria. The Spanish Club students organized a taco-building party, complete with all the ingredients needed for some delicious beef tacos or nachos, as well as some Goya juices and Mexican Jarritos sodas. While they ate their delicious creations, the students enjoyed the new Disney movie, "Coco," which also celebrates the Mexican culture The popular Mexican and American holiday of Cinco de Mayo celebrates Mexico's defeat of the French army in 1862 at the Battle of Puebla. Congratulations to Caitlin Bonifacio whose beautiful pen and ink artwork “Avis” was selected for the N.J. State Traveling Art Exhibit at the Ocean County Teen Arts Festival. 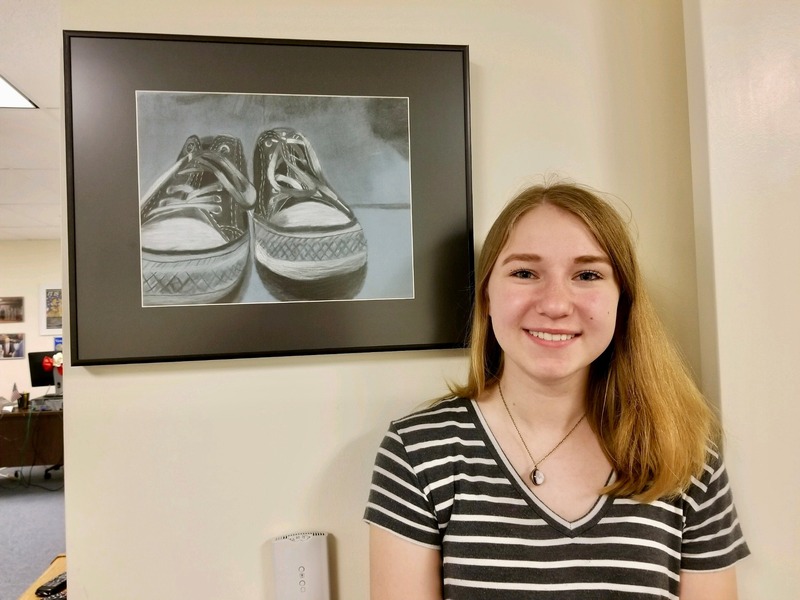 Her artwork will first be shown at the N.J. State Teen Arts Festival and then travel the state to different venues during the upcoming year. Caitlin was one of only four students whose artwork was chosen from the festival to represent Ocean County in the prestigious exhibit! 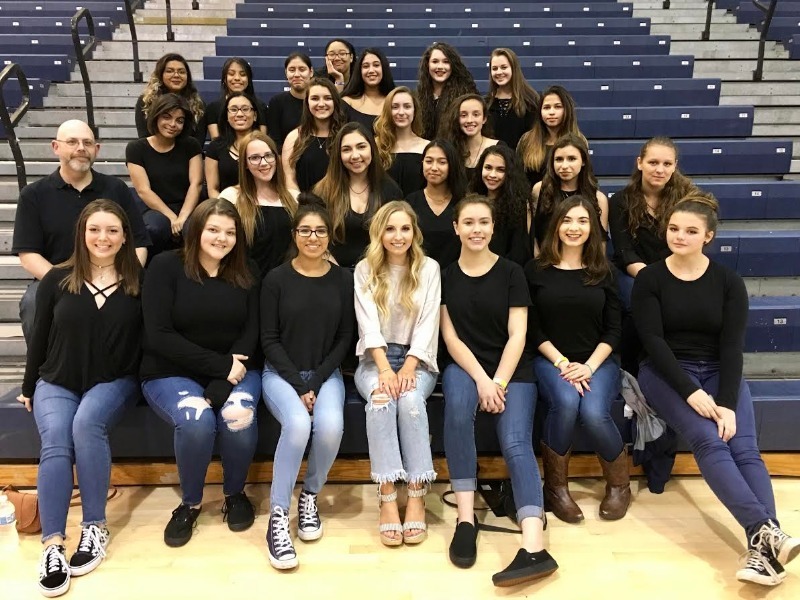 The Toms River North Concert Choir had a thrilling time last Saturday performing the National Anthem at the Jessie Chris concert. Ms. Chris is an American country musician who was named 2018 BillBoard Artist To Watch and TODAY Show Artist of The Month. 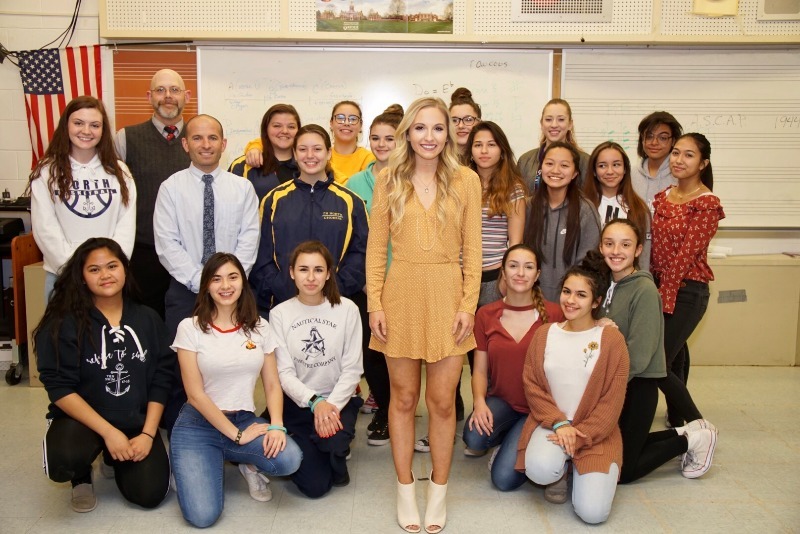 Jessie was kind enough to speak with the class two weeks ago and the students had the opportunity to ask questions about her life as a Country music performer. 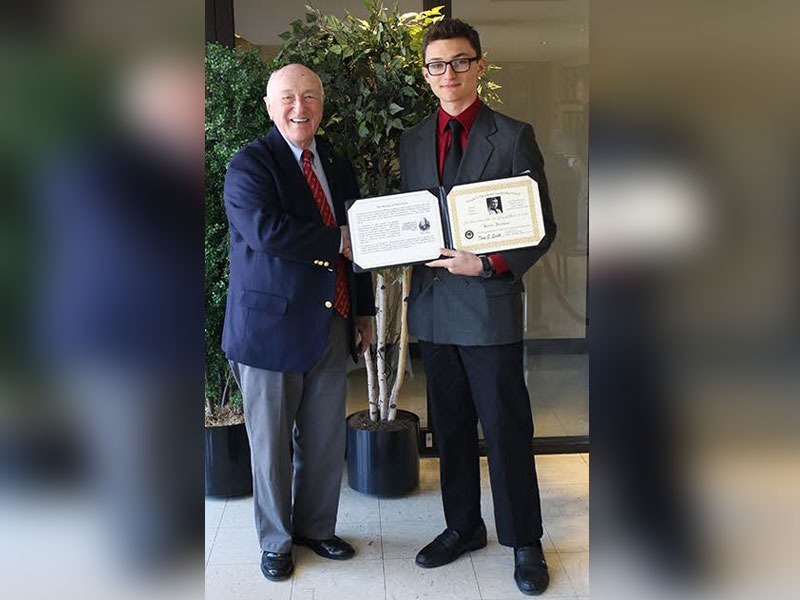 Mr. Keller proudly gives Sean Payba the Board of Education's certificate of achievement for being named to the All South Jersey Region Band and Orchestra. Congratulations Sean and Go Mariners! 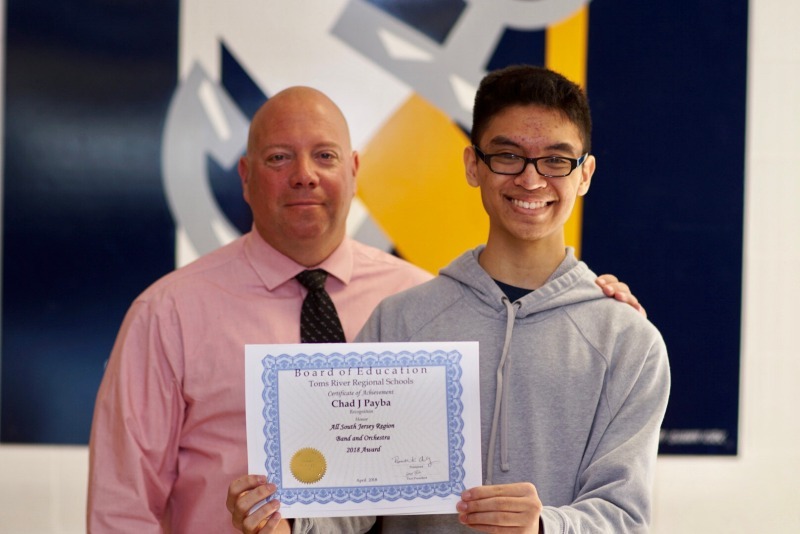 Congratulations to Chad Payba for receiving a certificate of achievement from the Board of Education for being selected to the All South Jersey Region Band and Orchestra. 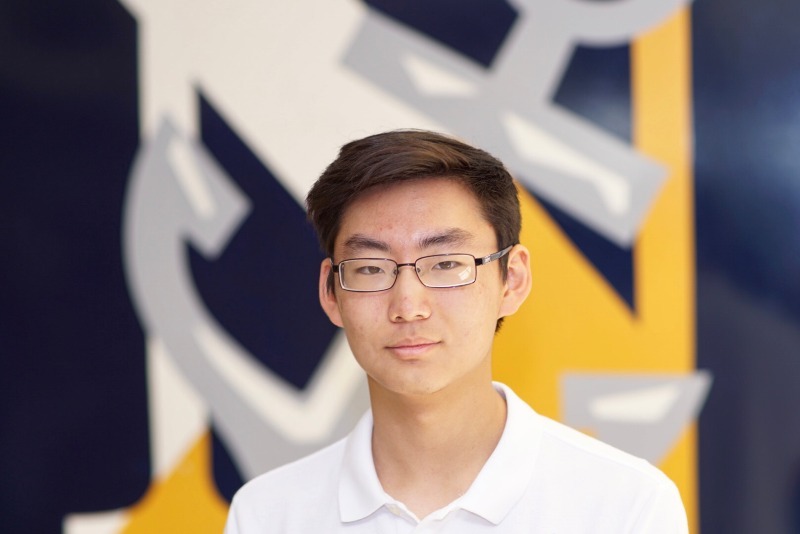 Congratulations to senior Daniel Lee who was selected as one of 630 semifinalists to advance to the final round of the 2018 U.S. Presidential Scholars competition. Over 5300 students from all over the US were originally identified as candidates in the program. 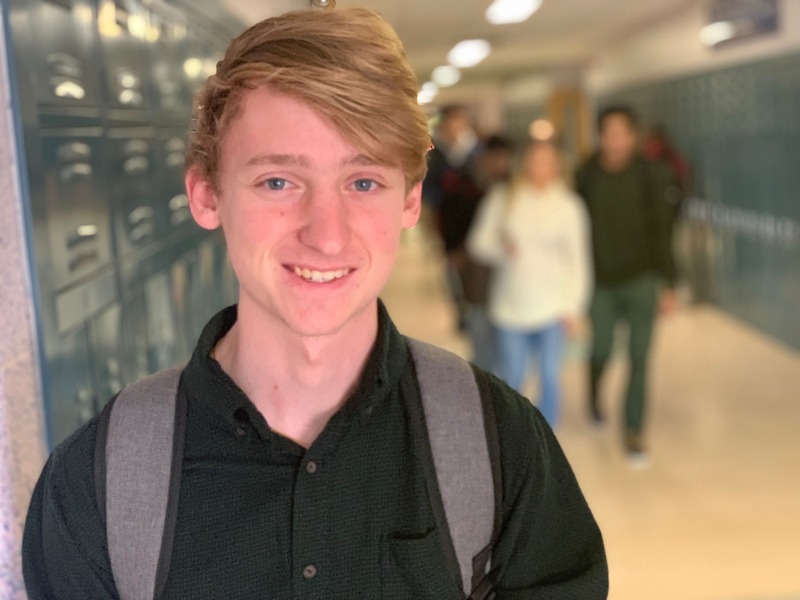 Dan is one of only twenty semi-finalists from New Jersey and is currently making his final college decision among Princeton, Yale, and Brown Universities. The Art Academy had a special instructor visit the North Dance Studio. Ms. Krista Ponti, who began her training at Salsa Fever in two Dance Academies in Jersey City under the direction of Mario Gonzales, demonstrated some of the finer points of Latin Salsa Dancing. 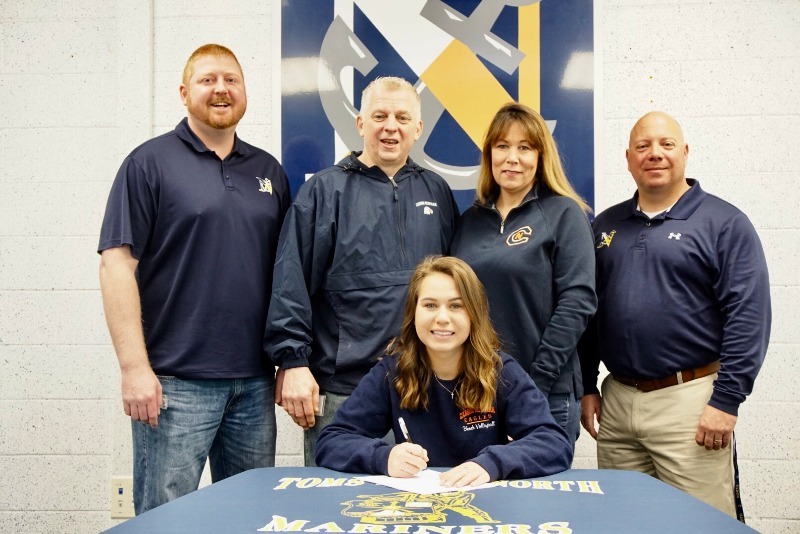 Congratulations to Morgan Siwiec who signed a letter of intent to attend Carson-Newman University in the Fall. The Volleyball coaches in Tennessee took notice after Morgan set the school dig record (639) and she will receive a scholarship to play for the Eagles. Also impressive is her outstanding academic record over the last four years at North. Congratulations Morgan and we all wish you much success in all that you do! 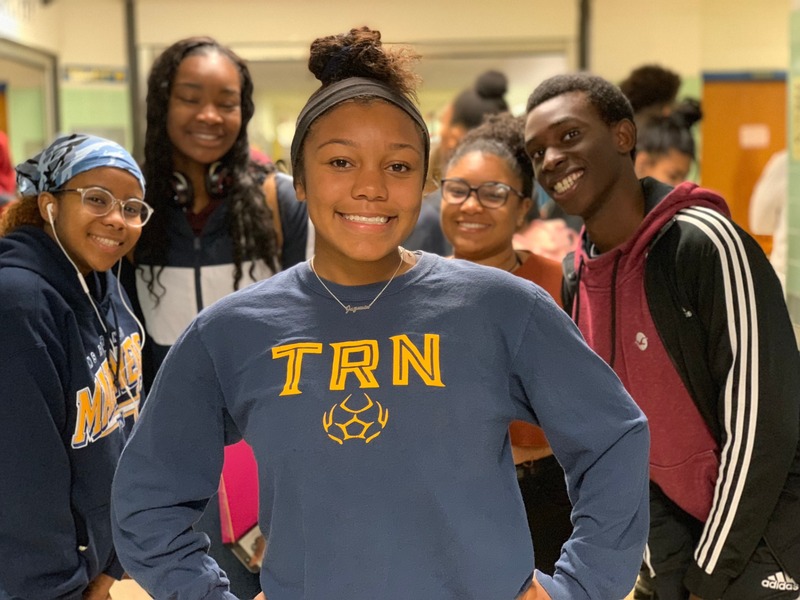 Sophomore Jada Williams is having a spectacular year at Toms River North. 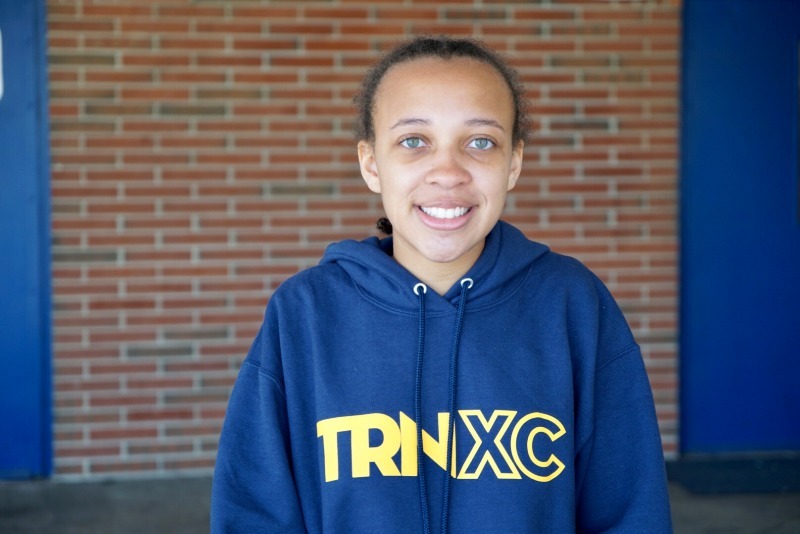 Jada, a bona fide 800 meters runner, won her heat in the 400 meter dash at yesterday's tri-meet. The Boys Golf team fought through windy and wet conditions and came out on top breaking Southern Regionals four year winning streak as Ocean County Champions. It was a closely contested match with the score tied at the end even after going to two tie breakers. It was Junior Connor Bekefi's lowest score of 78 that decided the championship. 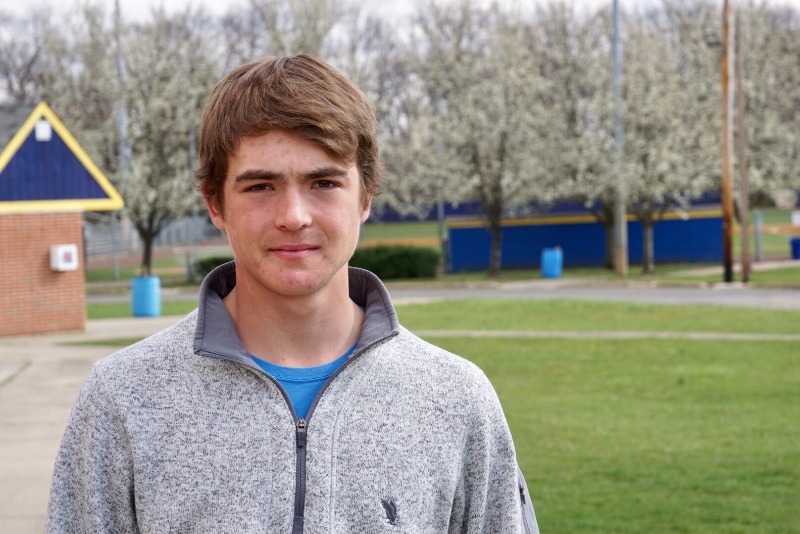 Coach Tommy Blackwell said that Connor is one of the best golfers we have ever had at North. "Connor is constantly working on his game, if he has a bad round, he goes immediately to the range to improve, if he has a good round, he still goes to the range. Senior Mike Mazzola stepped up and played one of his best games with an 86." Bill Fleury, John O'Donnell and Emilio Emace all contributed to this historic win. 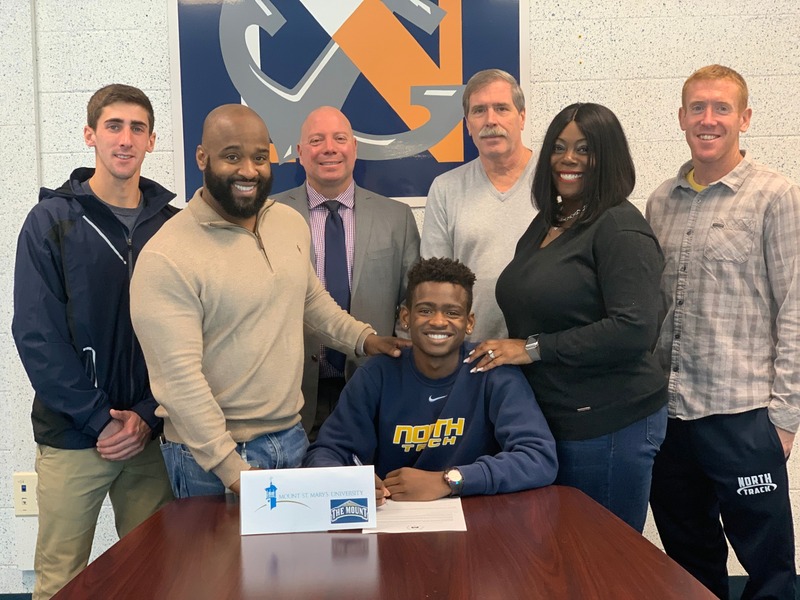 High School North's Emeron Mayers signed a letter of intent and will be attending Georgian Court University on an academic scholarship. Emeron was the leadoff leg on the shuttle hurdle relay team that captured sixth place at this year's Nike Indoor National Championships in NYC. 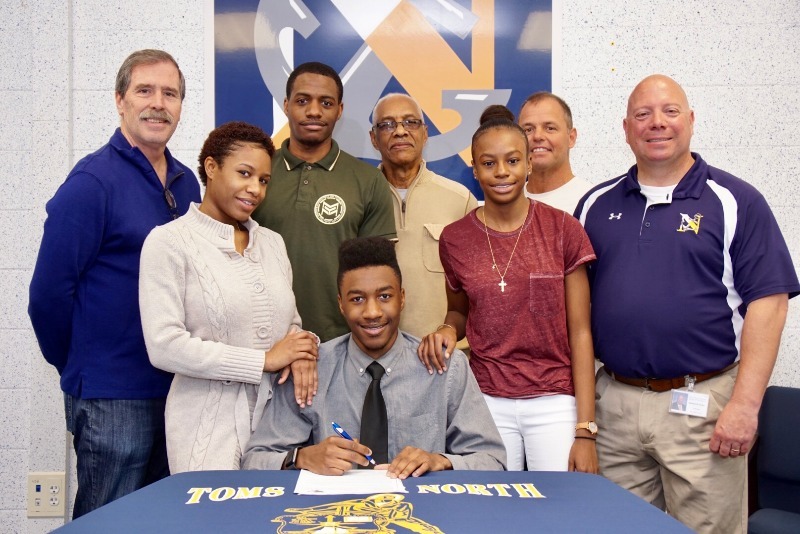 Emeron plans on continuing his track career with the Lions and will major in criminal justice. 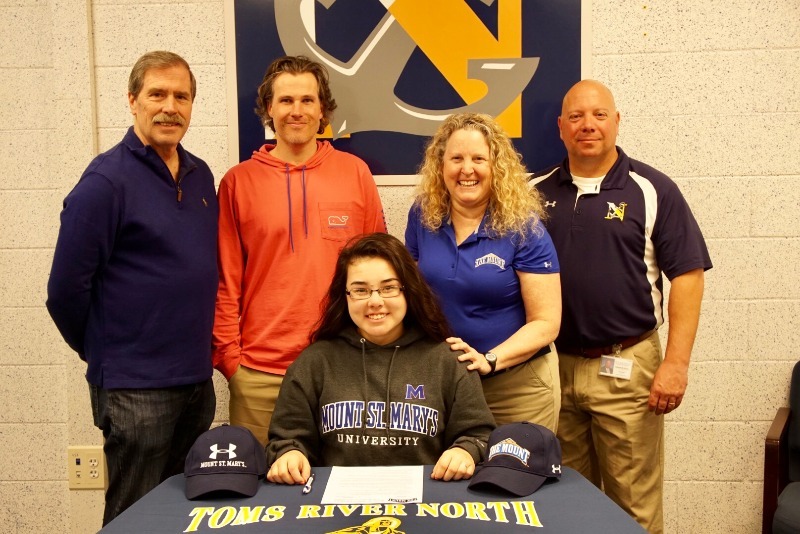 Michaila Cheung signed a letter of intent this morning to attend Mount Saint Mary's University in Emmitsburg, Maryland after graduation. 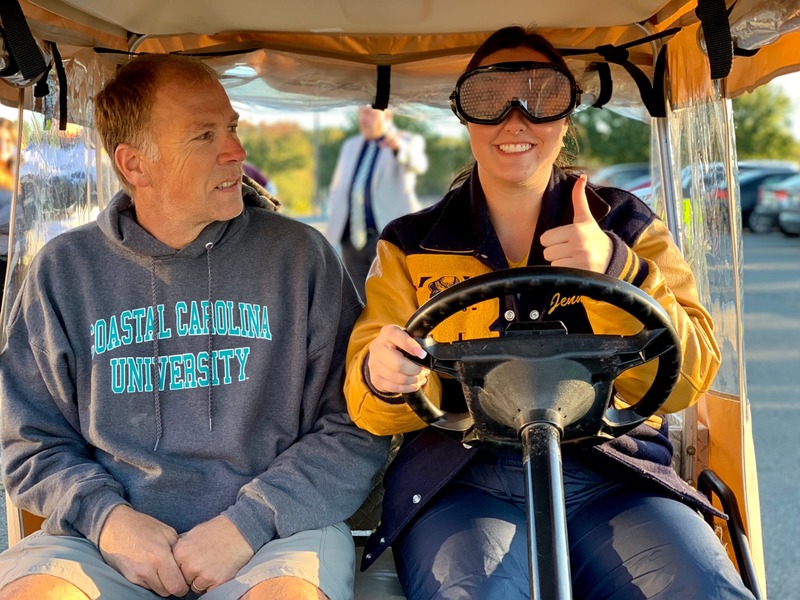 Michaila, who is the captain of the Mariner Golf team and reigning Ocean County champion, will receive a scholarship to showcase her golf talents for the Mountaineers. 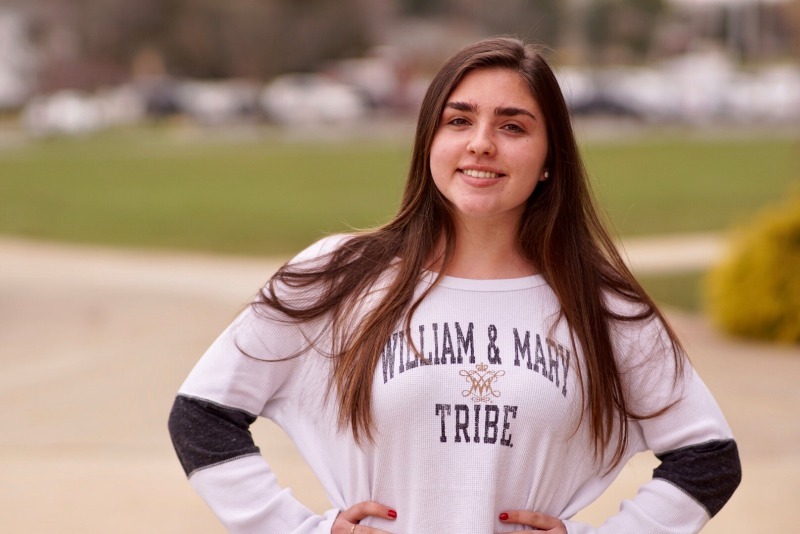 Michaila aspires to be a Physical Therapist and plans on majoring in Health Sciences. Congratulations and all the best! 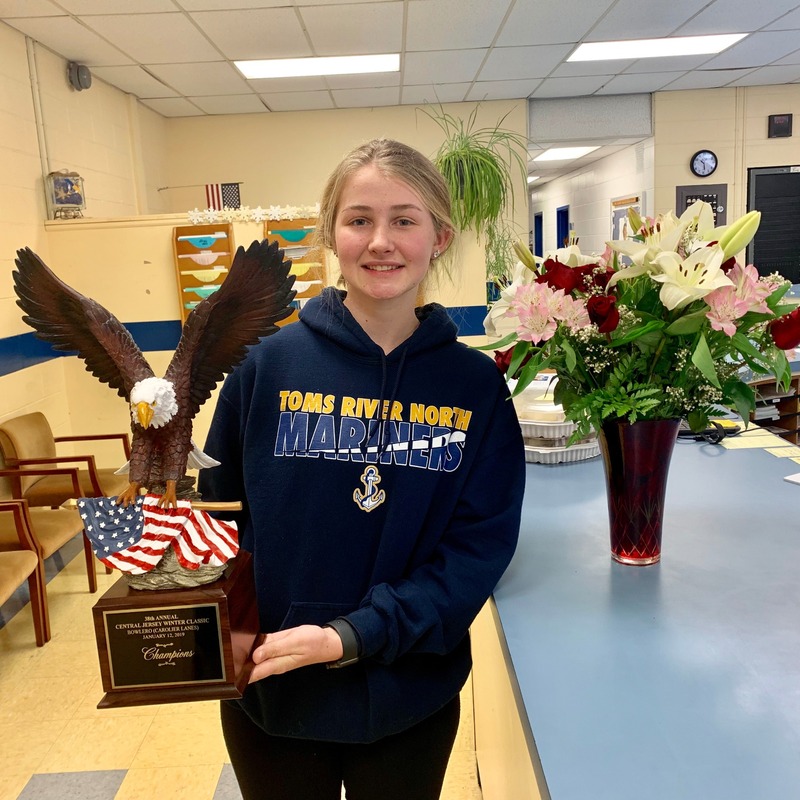 Cassidy Syrdale, as captain of the Girls Bowling team, helped propel the Mariners to claim top prize as the number one bowling team in New Jersey, winning the Tournament of Champions. Cassidy signed a letter of intent to attend Malloy College, and will receive a scholarship to bowl for the Malloy Lions. Cassidy will major in Biology and will pursue a career as a Physical Therapist. Jessie Chris is an American country musician who was named 2018 Billboard Artist To Watch and TODAY Show Artist of the Month. Ms. Chris visited the Toms River North Concert Choir to give the students practical advice about how to make a career in the music industry. 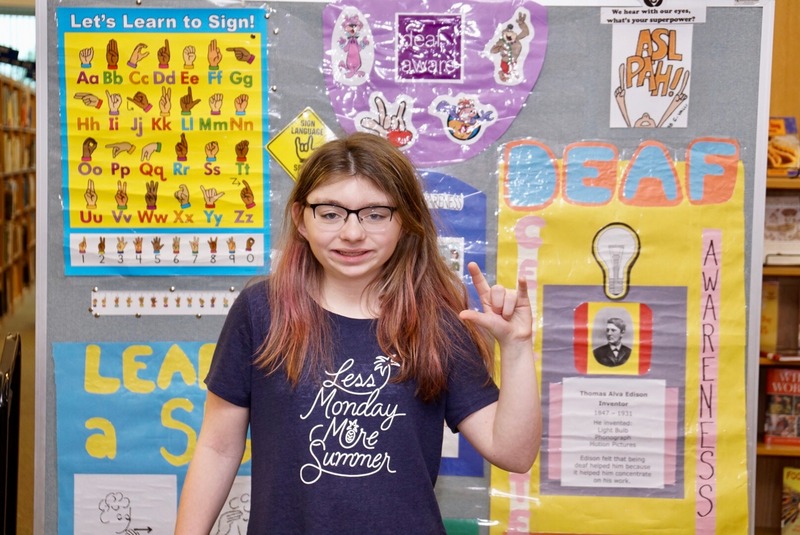 She also uses her own personal experiences to help encourage other students to follow their dreams and overcome adversity. Ms. Chris will be performing LIVE at the RWJBarnabas Arena on Saturday, April 28th @ 7pm. Do not miss it, it will be an amazing show. Congratulations to our Staff Member of the Month, Mrs. Donna Garofalo. Mrs. Garofalo is our Senior Guidance Secretary, working at High School North for the past eight years. She has long been an invaluable part of our testing program and counts the staff among her favorite things about our school. In her spare time, Donna enjoys traveling, cooking, and spending time with her family. 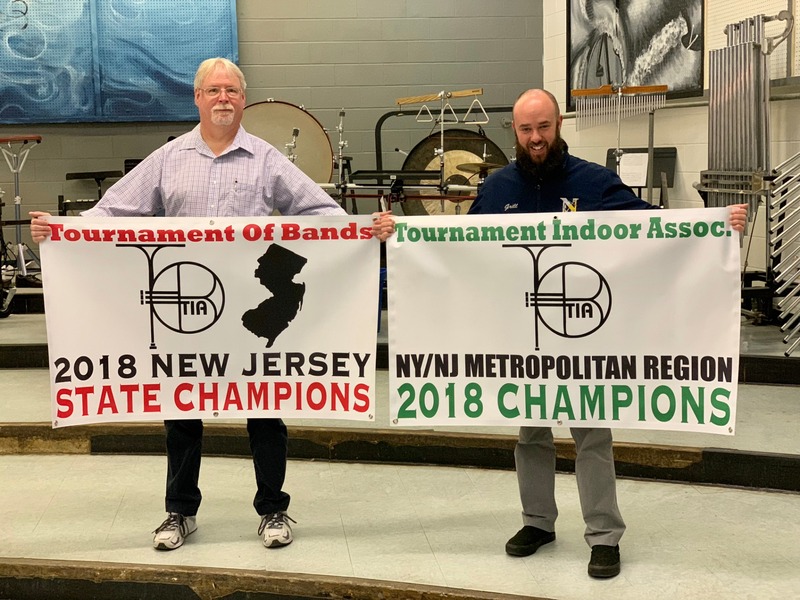 Congratulations to the Toms River North Mariners! 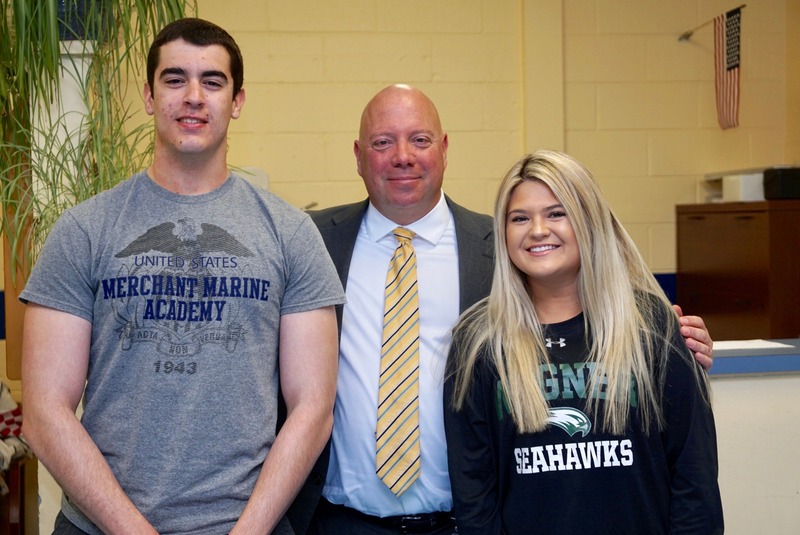 It felt like 2018 was a year of destiny for the Mariners, as the Toms River East Raiders won the inaugural title in 2016 and the Toms River South Indians won the 2nd annual championship last year. 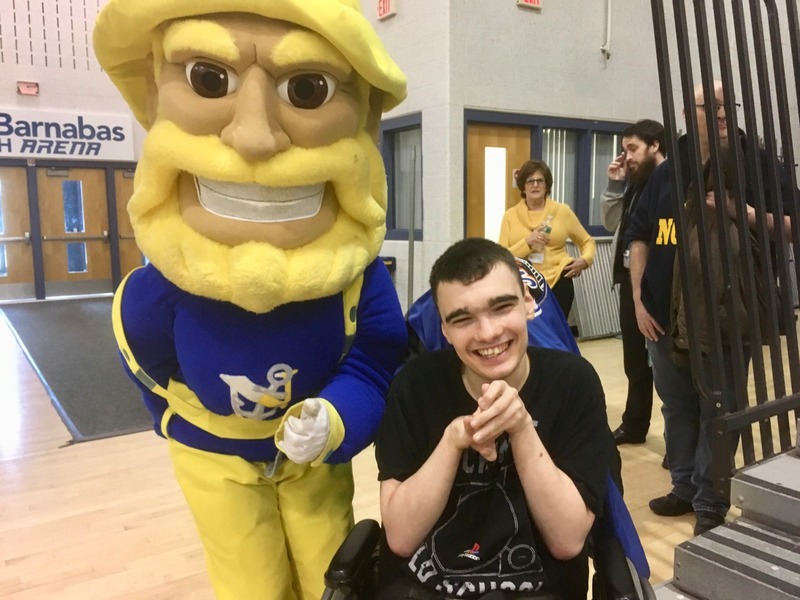 Not content to watch their cross-town rivals bask in the glow of having the best mascots in Ocean County, the Mariners roared to the front of the pack this year and never looked back winning the WOBM Mascot Madness contest. Thanks to everyone who took part in the voting. Go Mariners! 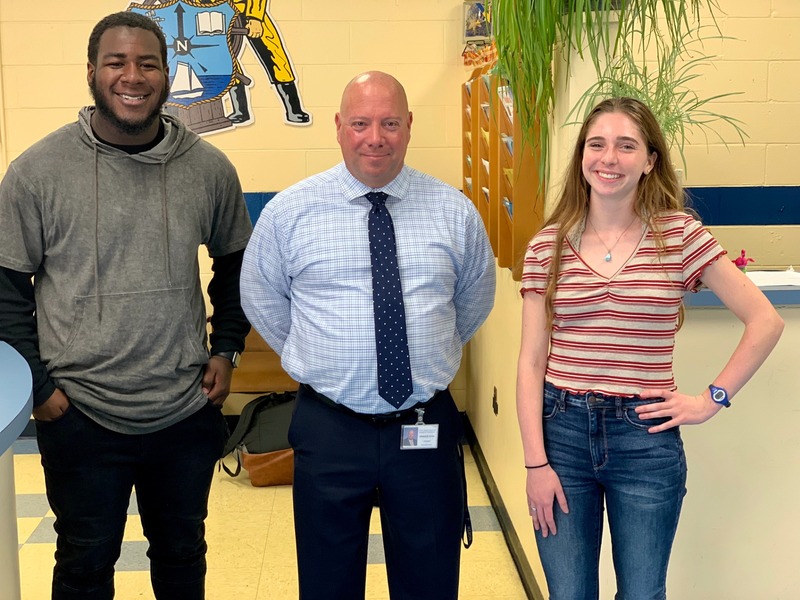 Congratulations to our April students of the month Phoebe Payba and Kolin Thievon. 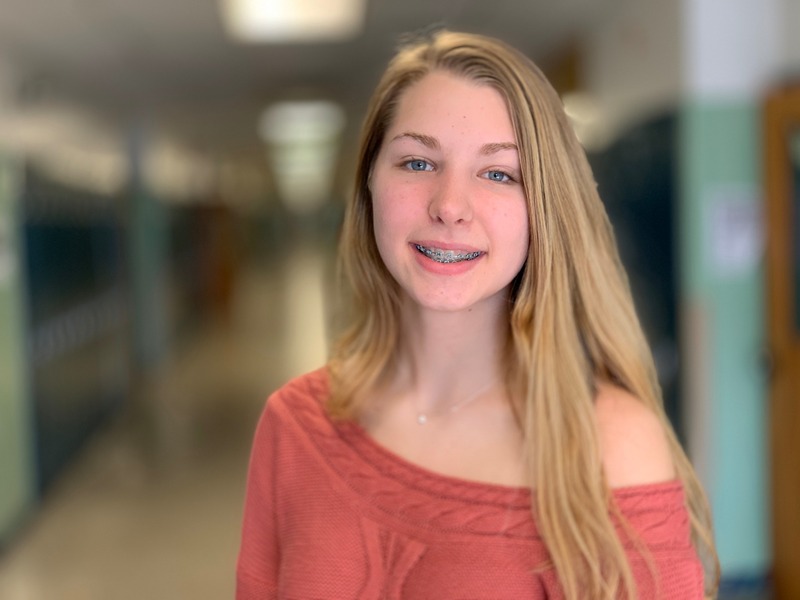 Allison Fleury will be recognized at the Ocean County Personnel and Guidance Association's 31st Annual Caring Award Ceremony. The purpose of this award is to recognize students who have given of themselves to a person, group, or cause unselfishly and without expectation of reward. Allison volunteers with Clean Ocean Action, Relay for Life and is part of the "Good Kids" theater project that tackles the topic of sexual abuse. 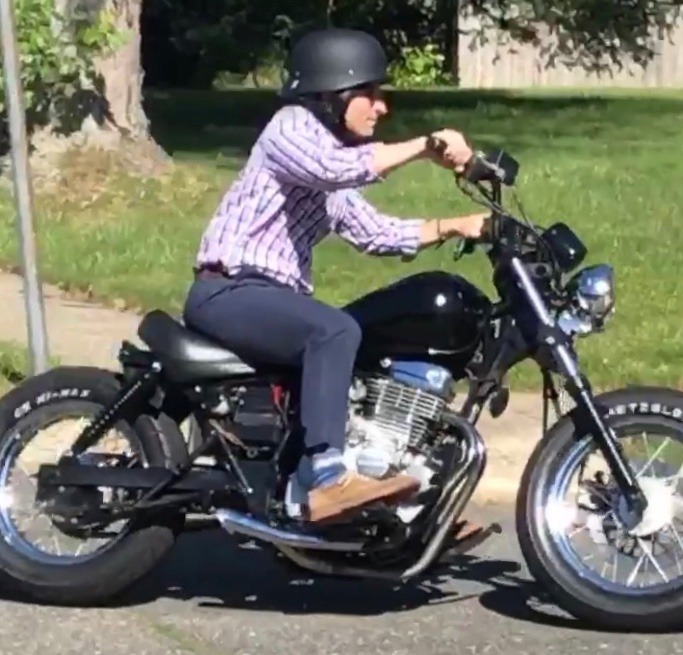 She also has appeared in some of the Ocean County Prosecutor's Office videos that aim to convince students to stay away from dangerous behaviors. The Girls Field team had a sensational afternoon this past weekend at the Raritan Relays. 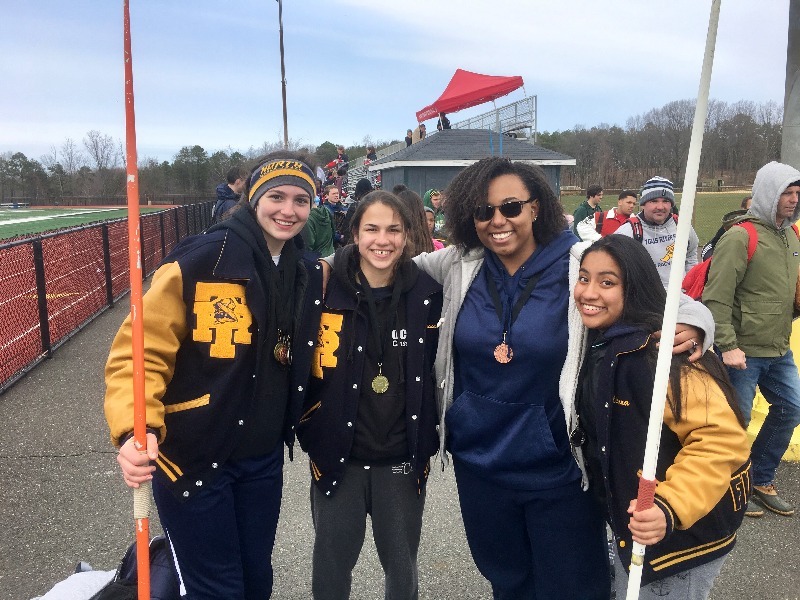 Through the combined efforts of LIz Pitera, Annah Green Nadia Brown and Julianna Ianinini, the Lady Mariners took first place in the in the discus, second in the javelin and third place in the shot put. Coach William Wilbert, after having a terrific wrestling season and being named "Coach of the Year", keeps the momentum going with the Spring Track and Field team. He said it was an "Outstanding performance to start the season and I expect nothing less from here on out". Go Mariners! After a long, cold winter, Spring Break is finally upon us. 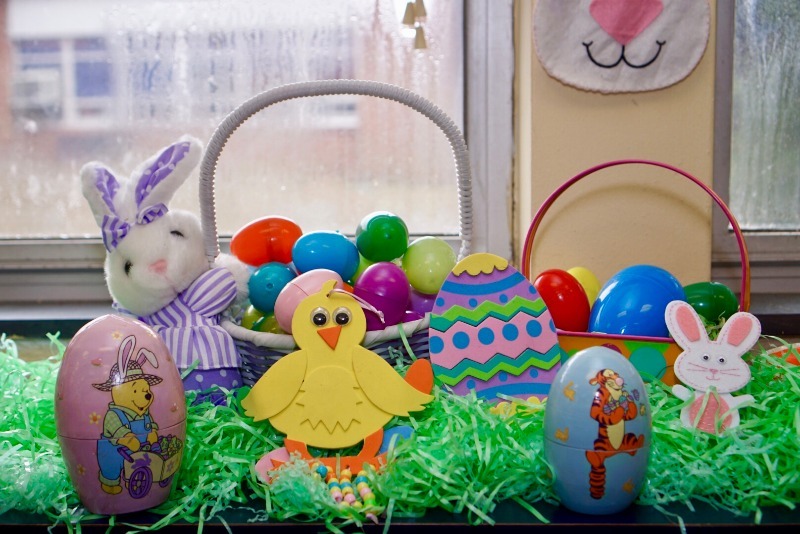 On behalf of Principal Keller, the administration and all the staff, we wish everyone a safe holiday. Please check your student calendar for all the exciting events happening in April and we will see you soon. 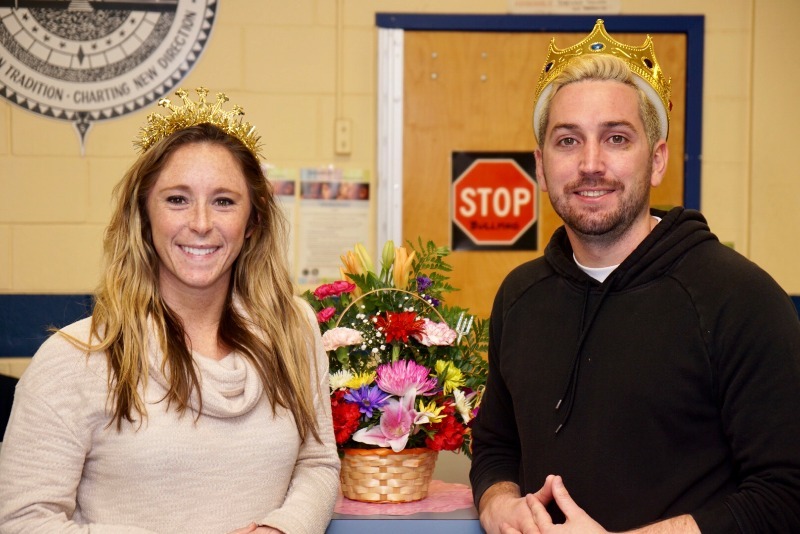 Congratulations to Biology teacher, Ms. Ashley Burgess and Physical Education teacher Ryan Dering for being crowned "King" and "Queen" at this year's annual Teachers Pageant. Belle Byrnes leads the All Star Washboard and Jug band to support Media Specialist Ms. Karla Iverson's bid for "Ms. Elective" during last night's Talent Show. 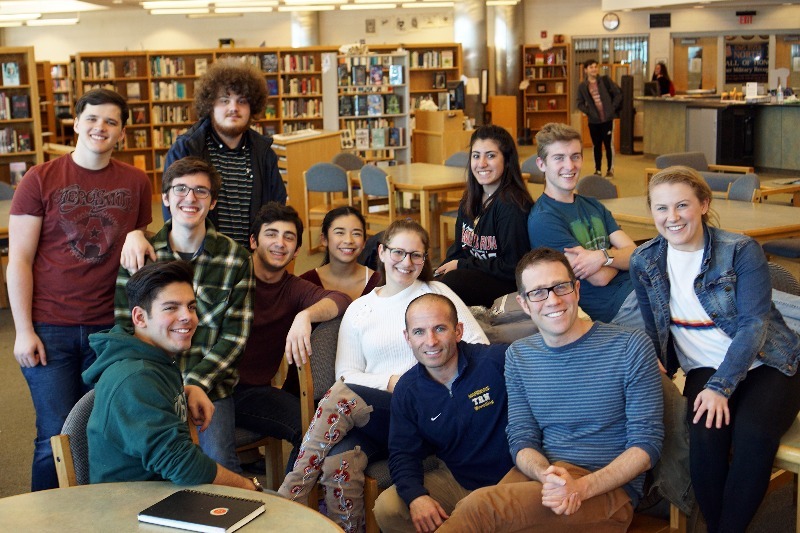 The Toms River North Art Academy hosted a lecture and a Q & A with Broadway Musical Conductor, Nate Patten. 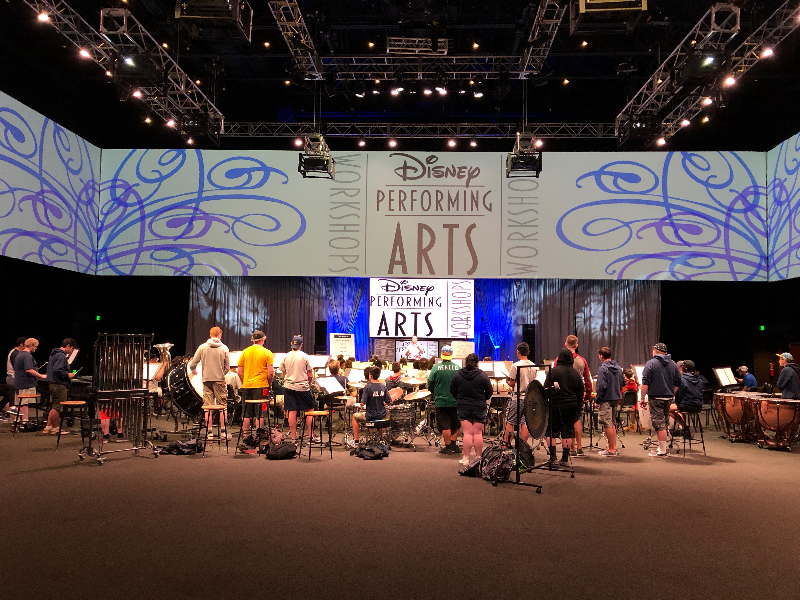 This week's snowstorm did not deter the Toms River North band from attending the workshops and competition held by the Disney Performing Arts in Orlando, Florida. Senior Prom bids are now on sale until April 13th in room B20 after school. Cost is $70 per bid. Students should see Mr. Seiverd or Ms. Burgess with any questions. 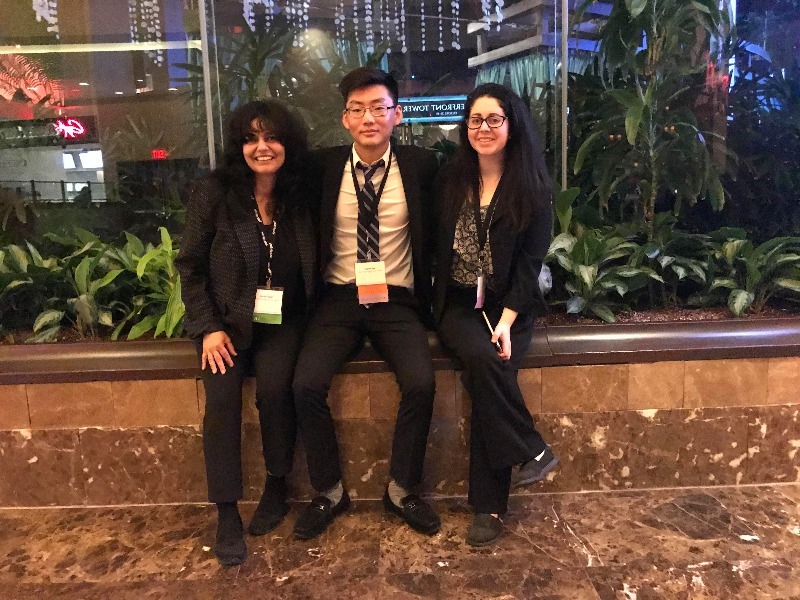 Toms River High School North attended the FBLA New Jersey State Leadership Conference (SLC) on March 8th and 9th in Atlantic City. Tickets for The Addams Family can be purchased online at www.trnhs.booktix.com or they can be purchased through Mrs. Mcneil in guidance from 12 noon-1 pm AND from 1:30-2:00pm Tickets are $7 each This week! Thursday, Friday and Saturday at 7 pm Don't miss it!